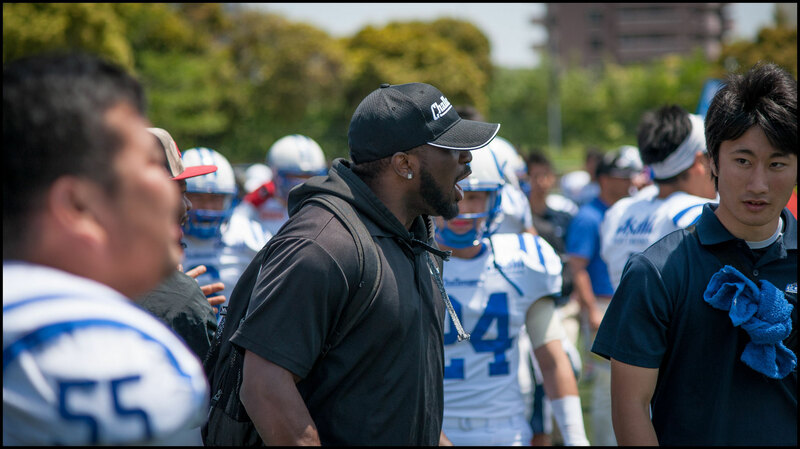 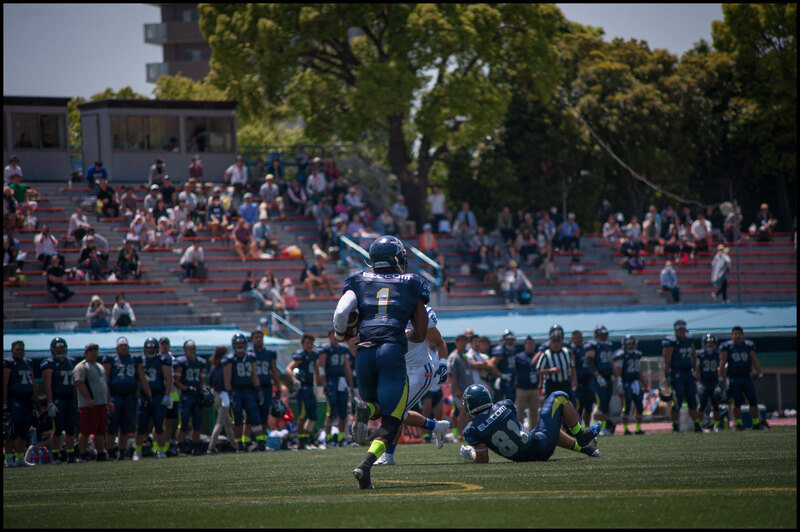 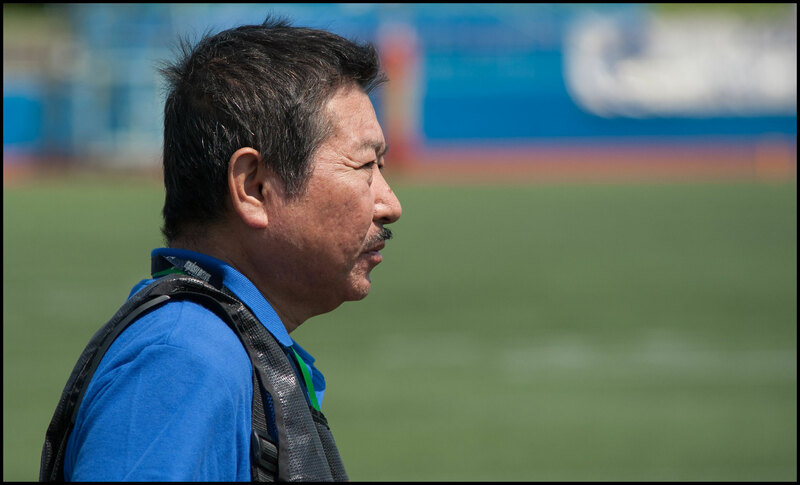 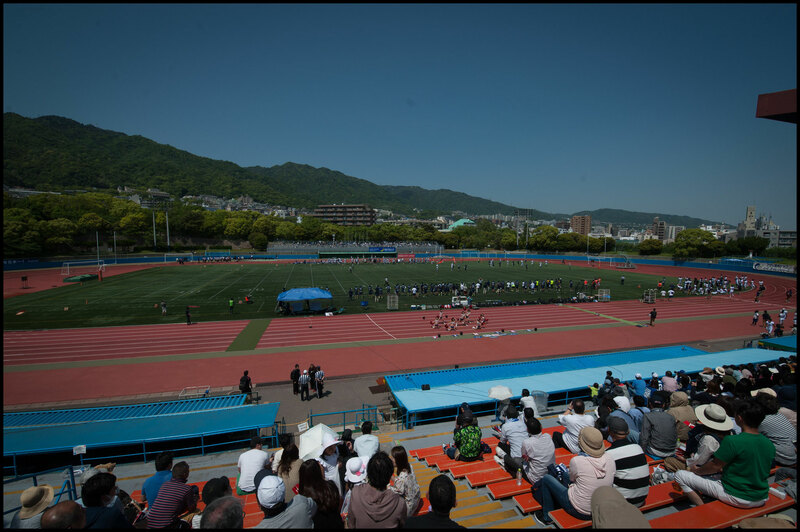 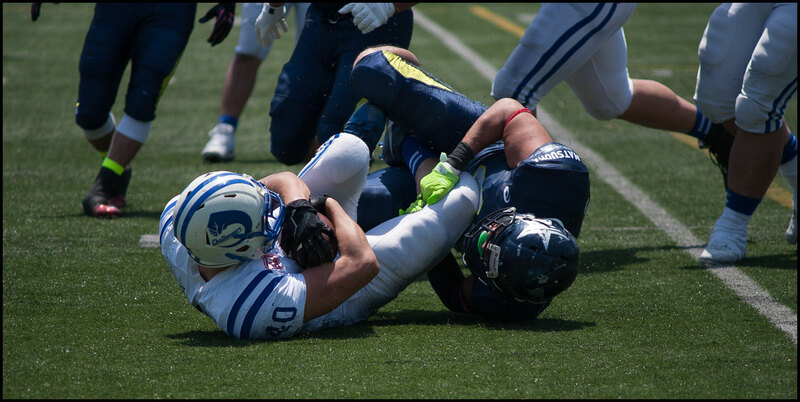 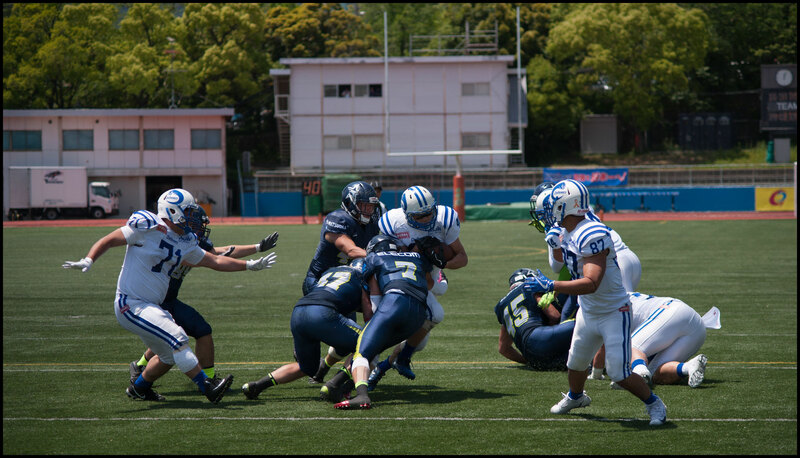 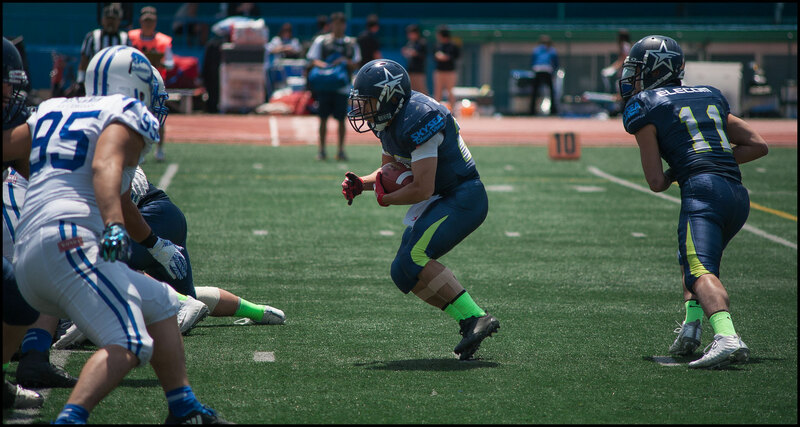 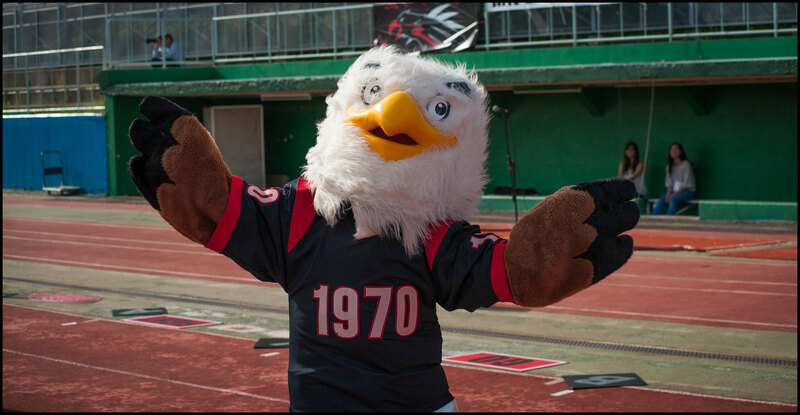 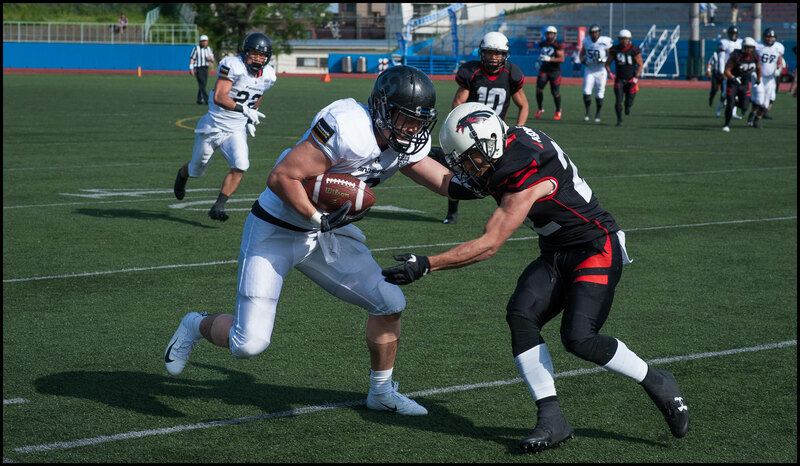 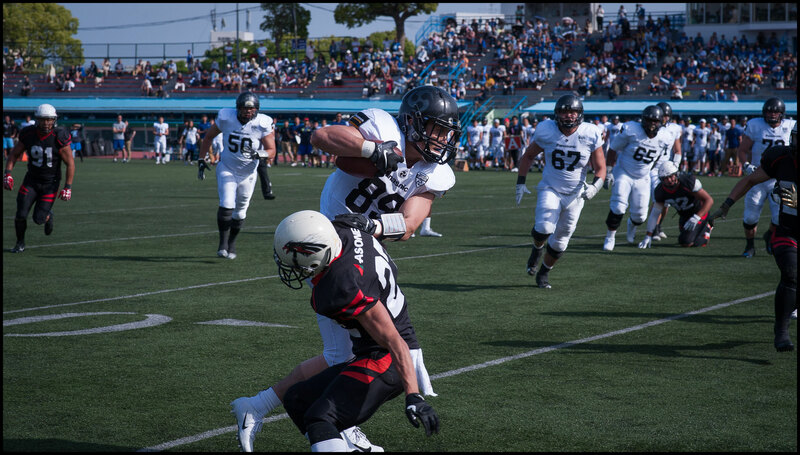 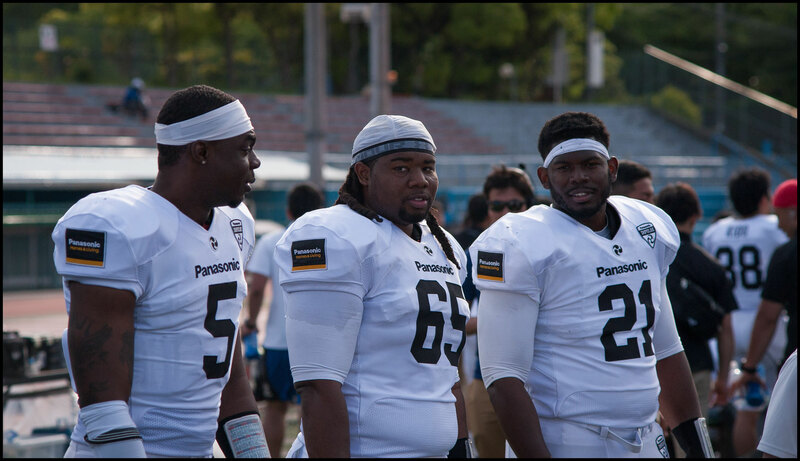 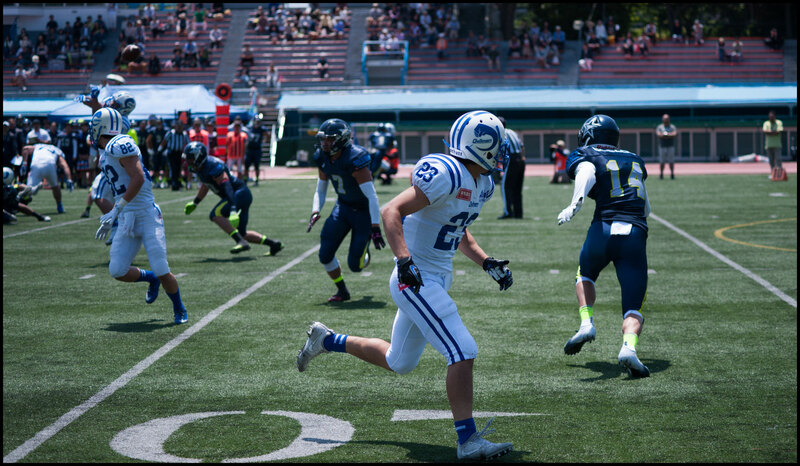 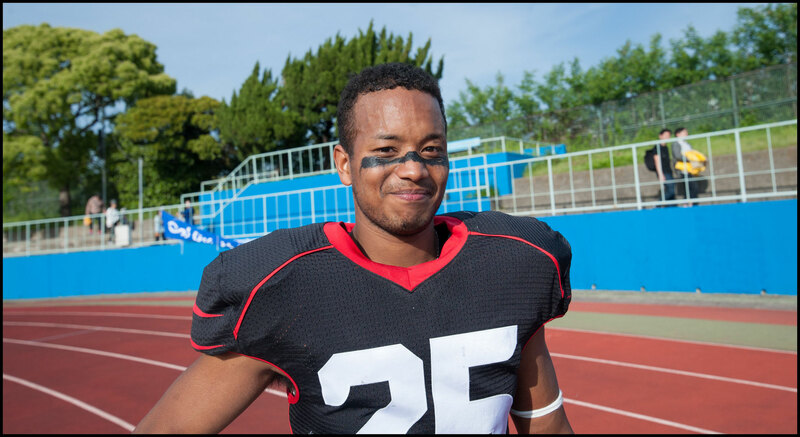 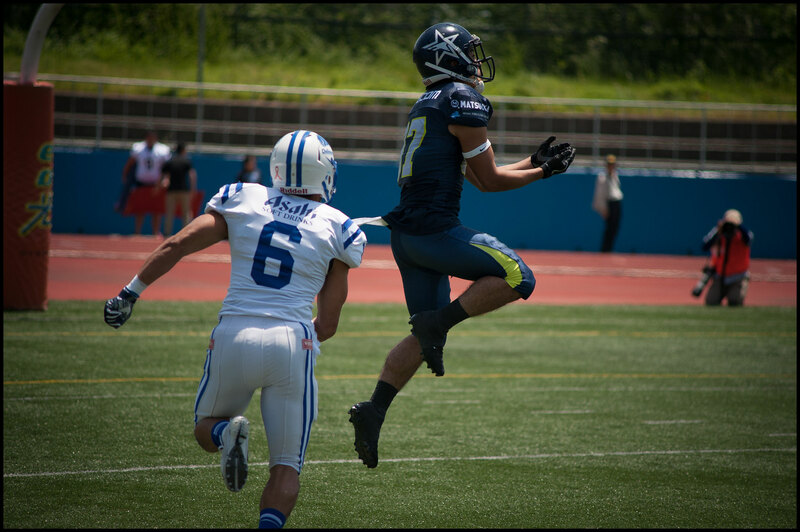 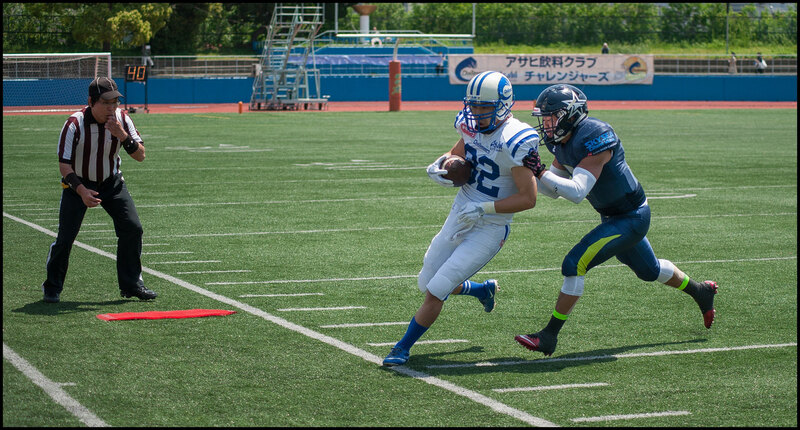 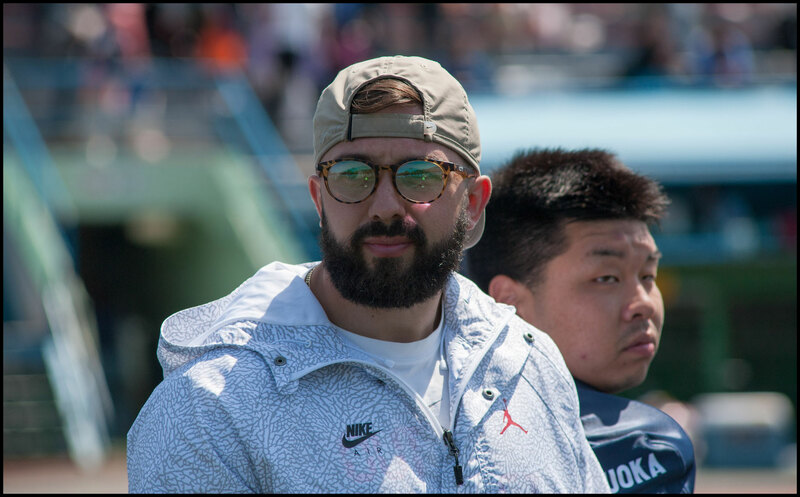 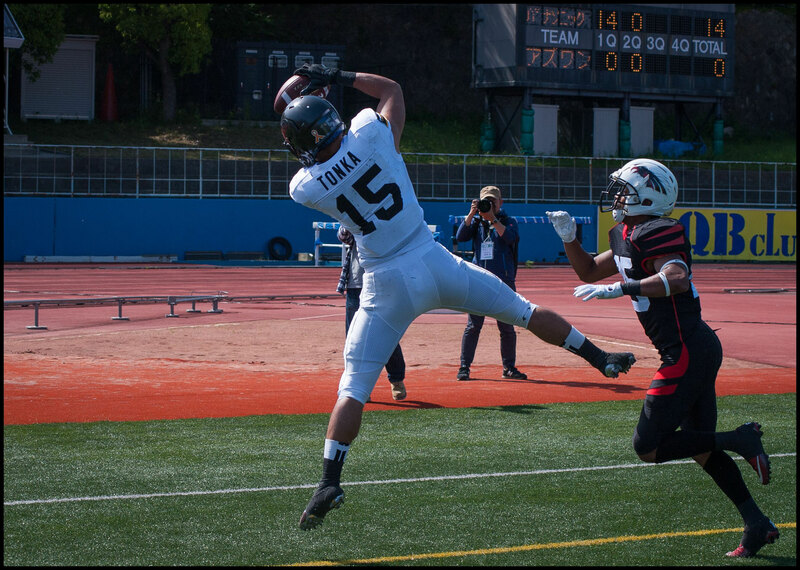 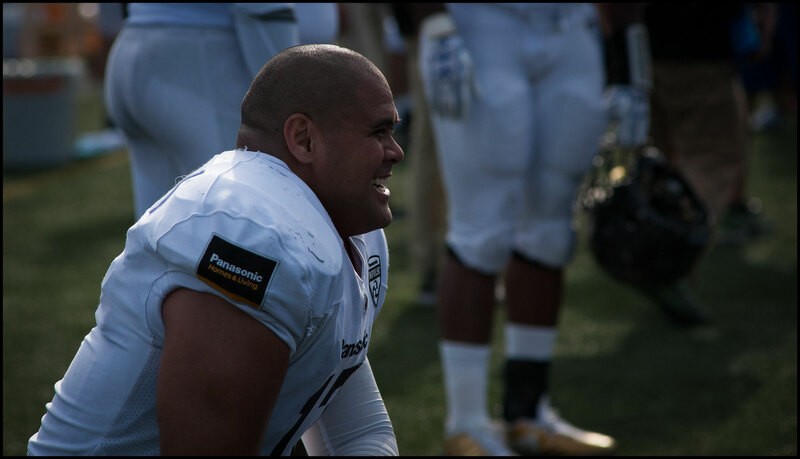 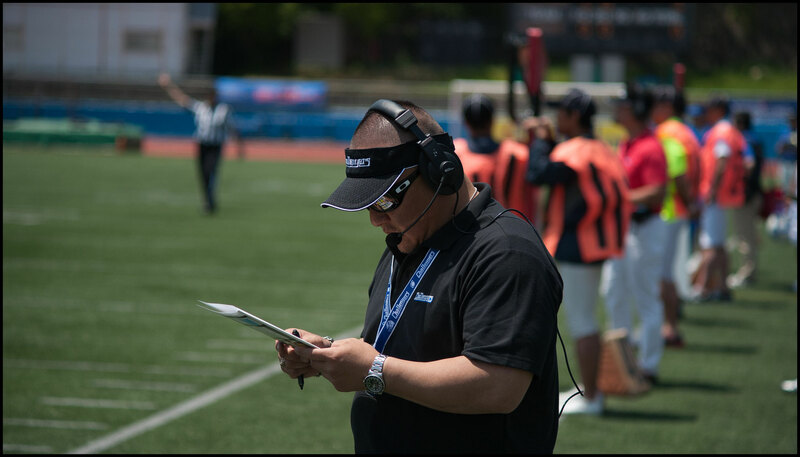 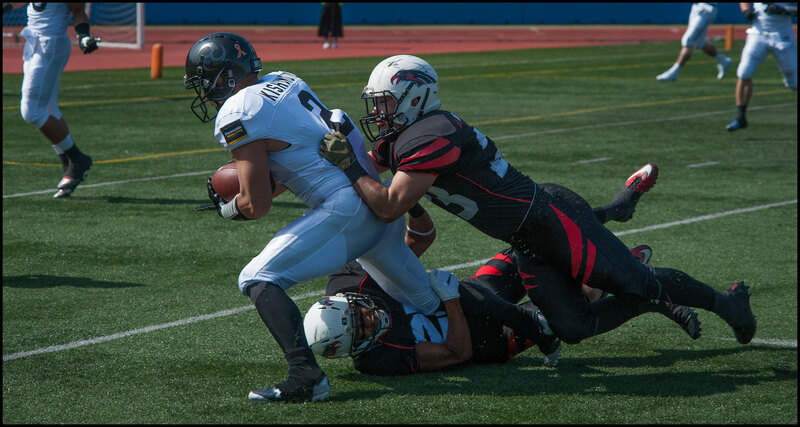 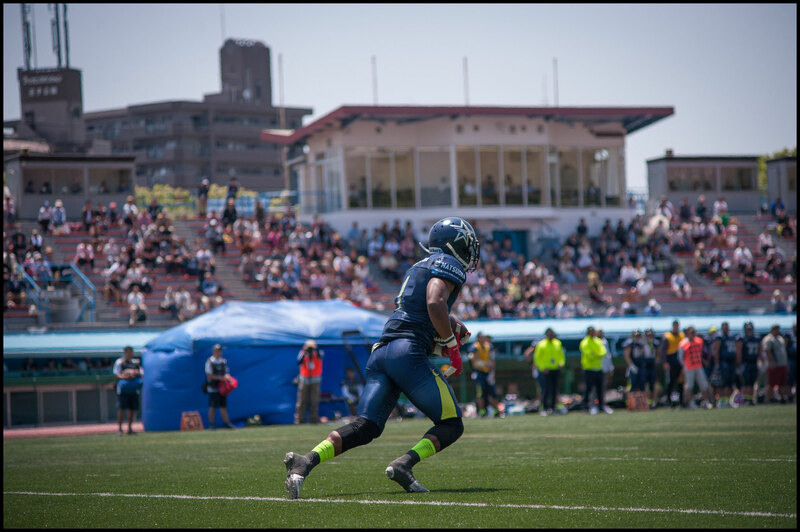 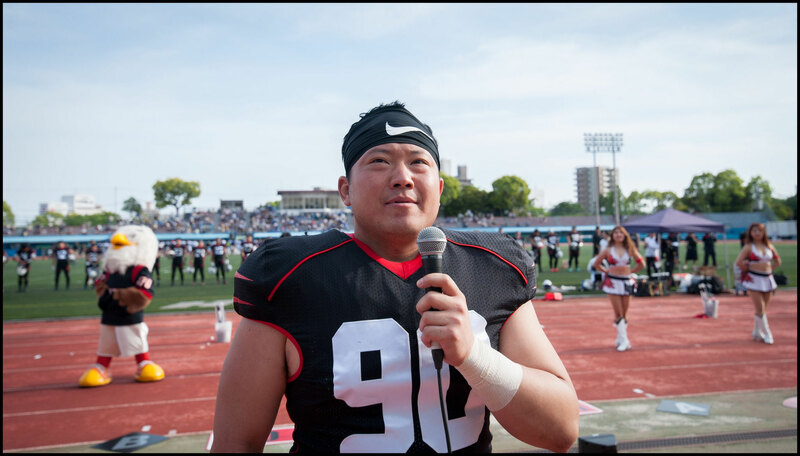 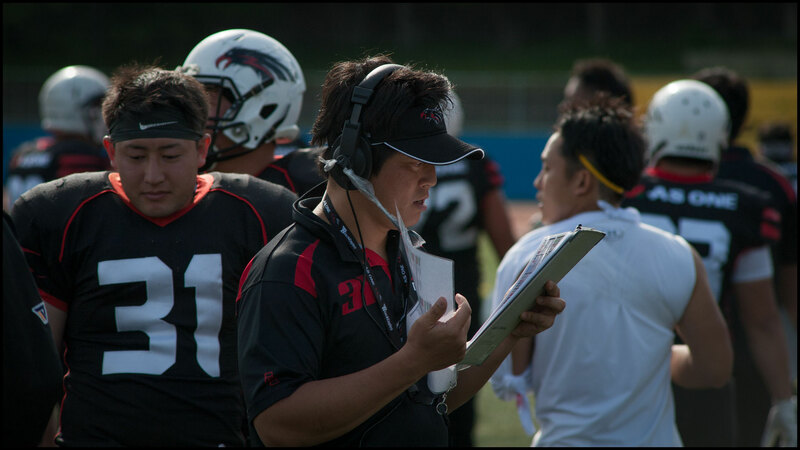 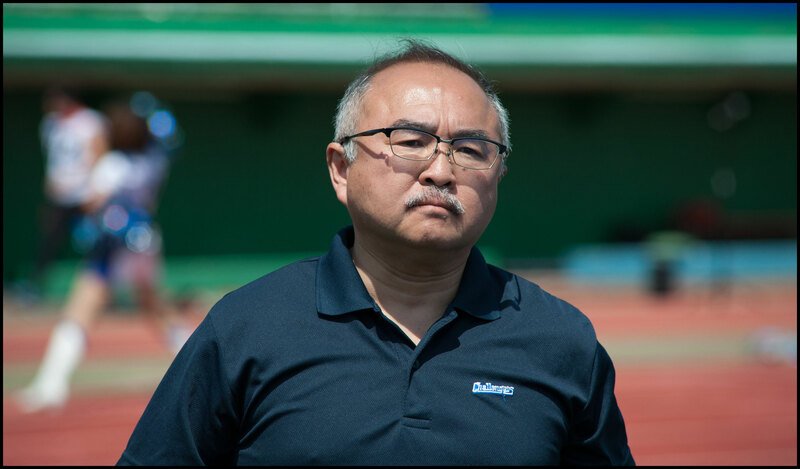 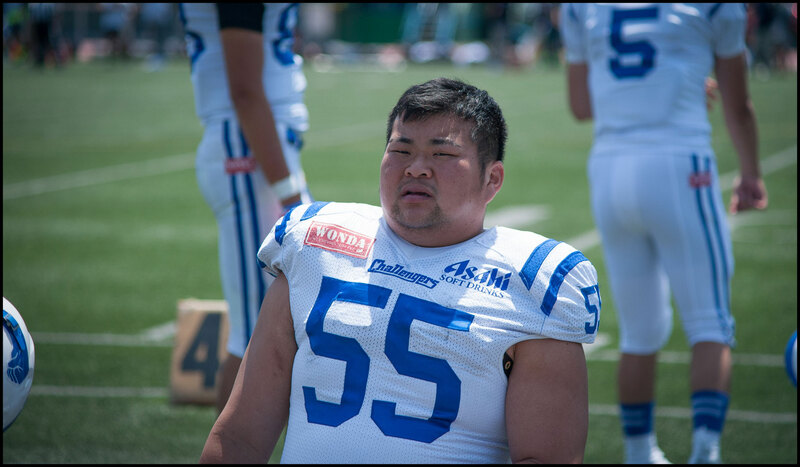 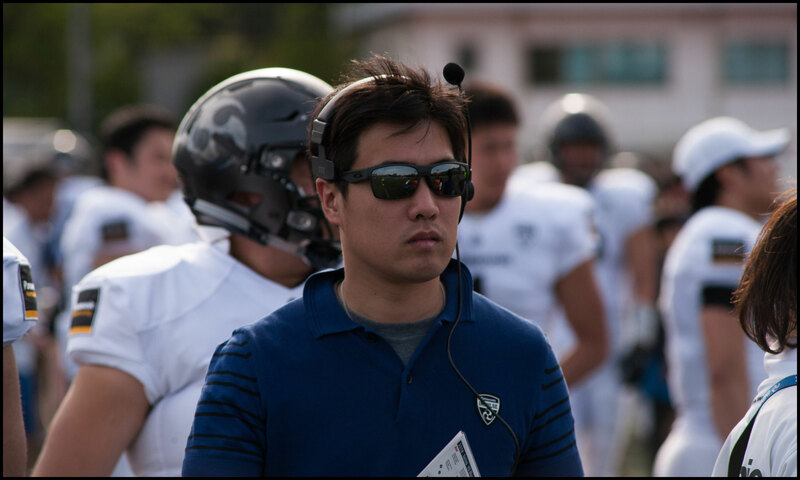 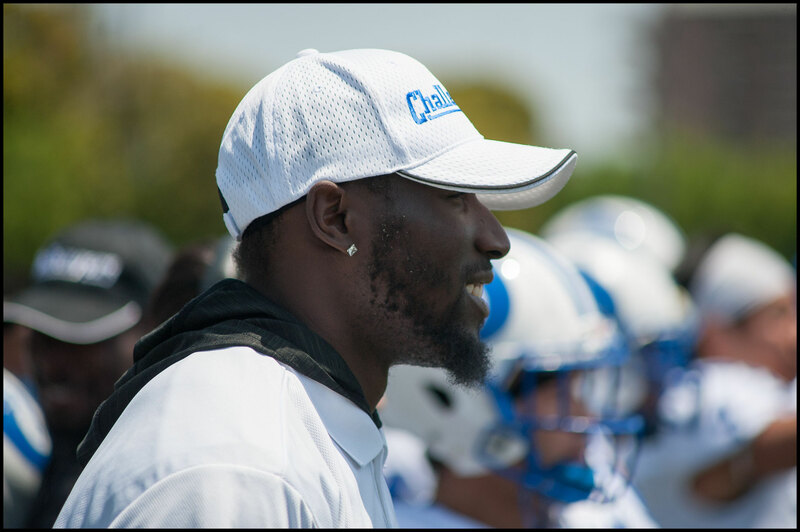 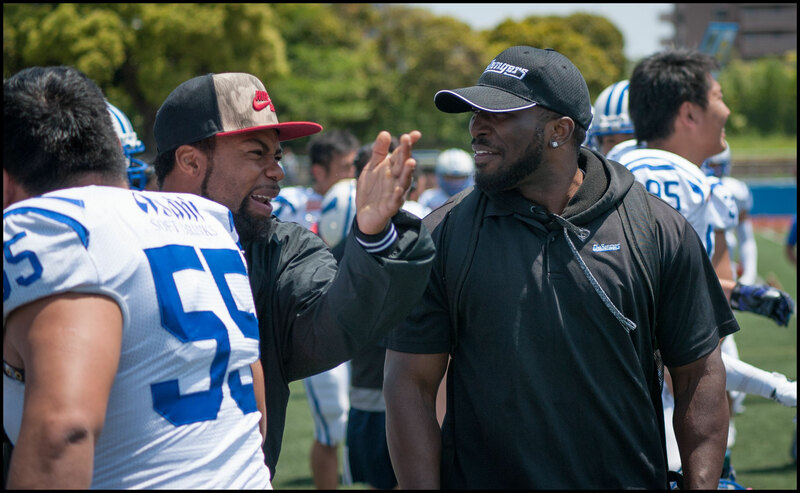 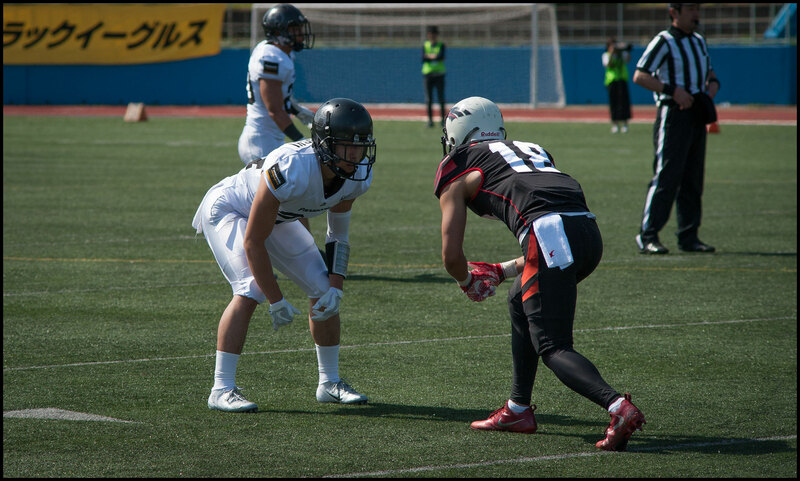 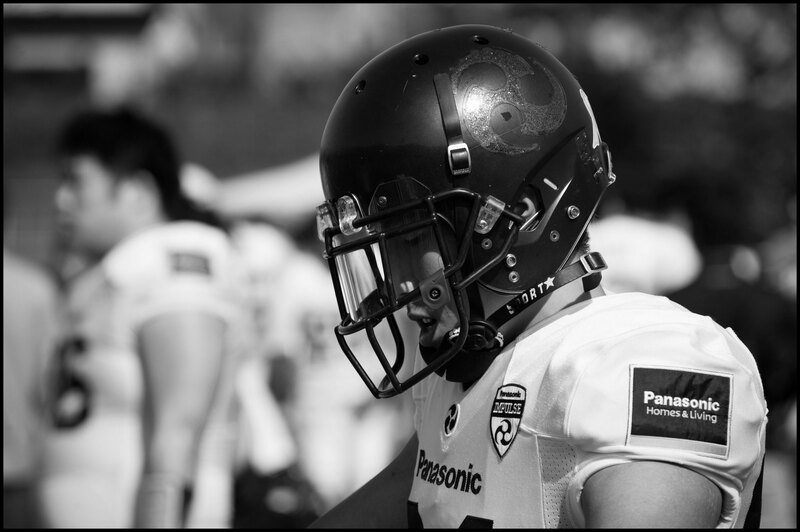 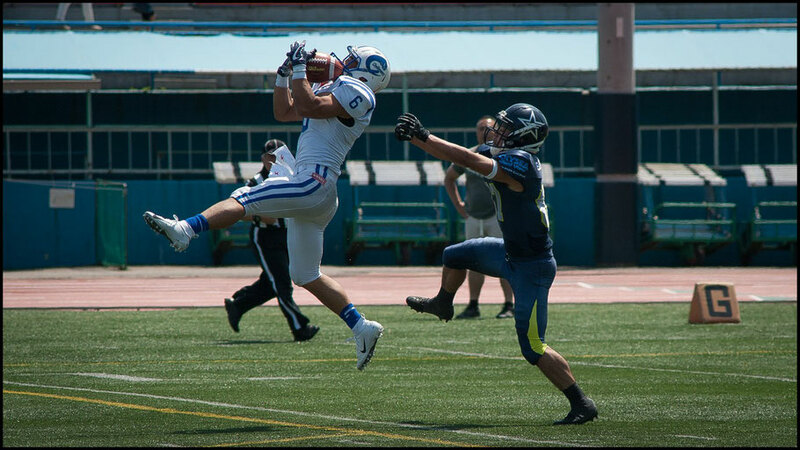 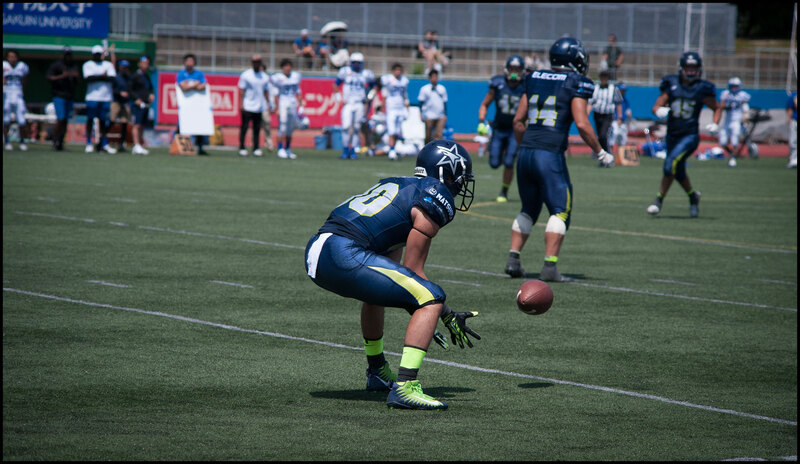 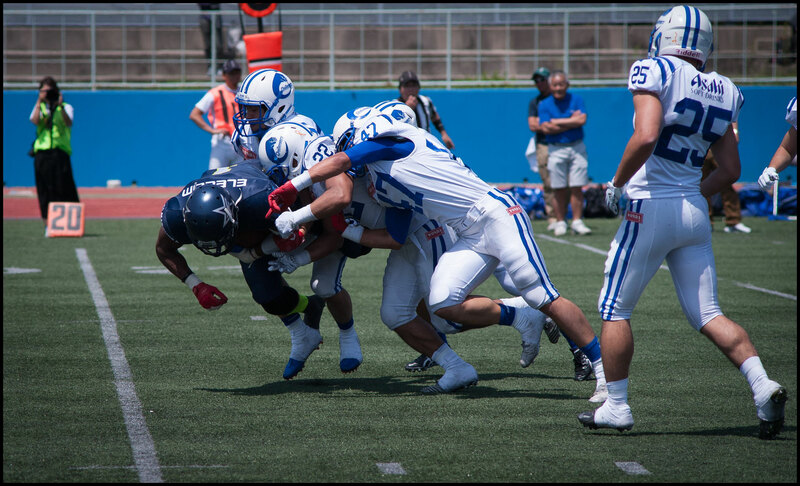 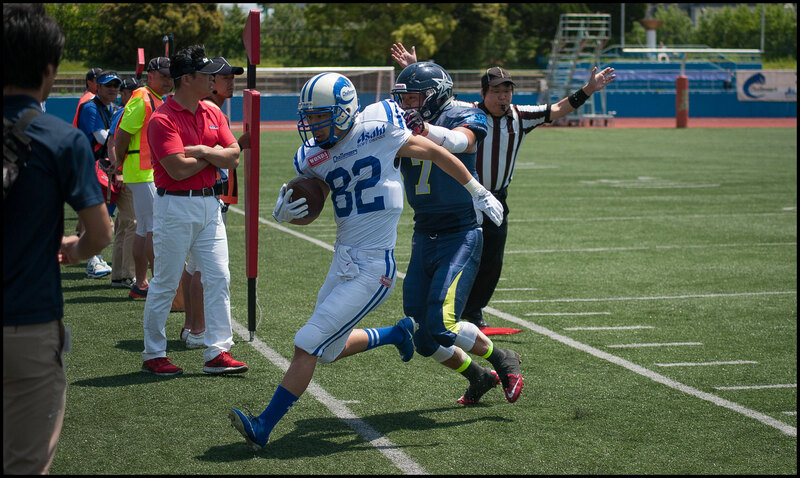 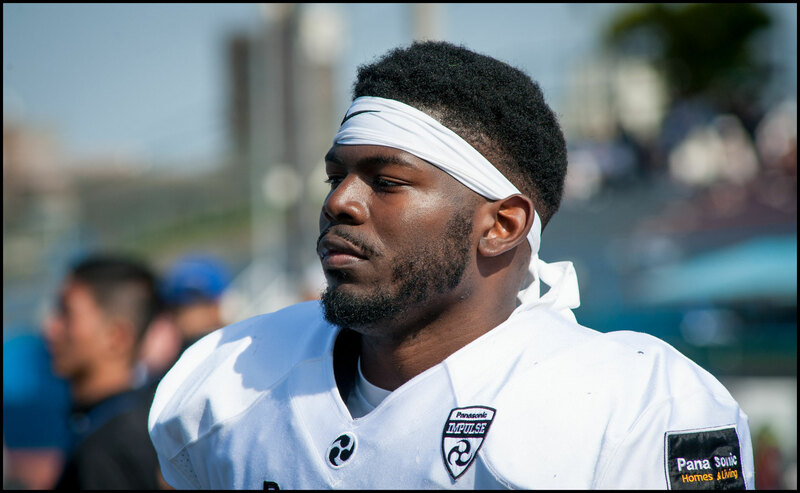 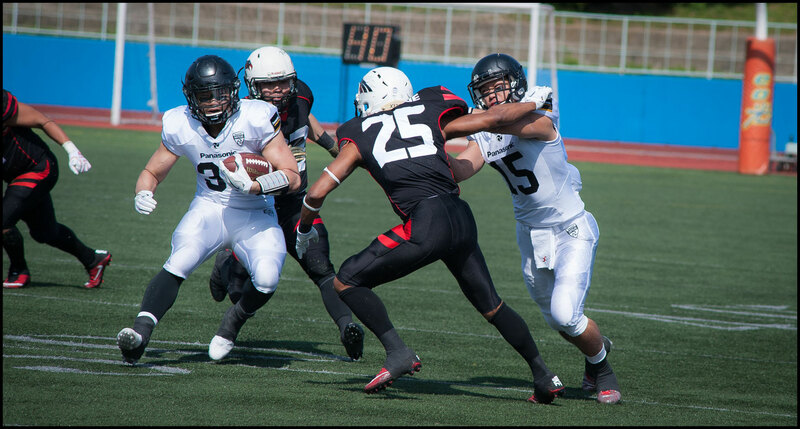 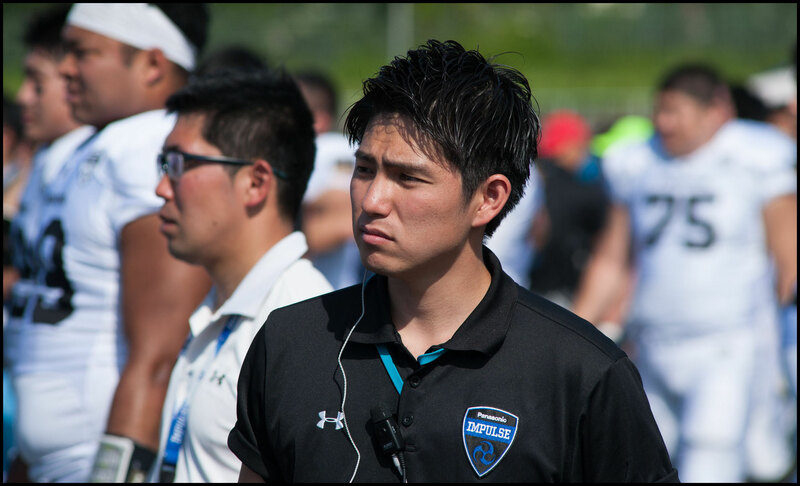 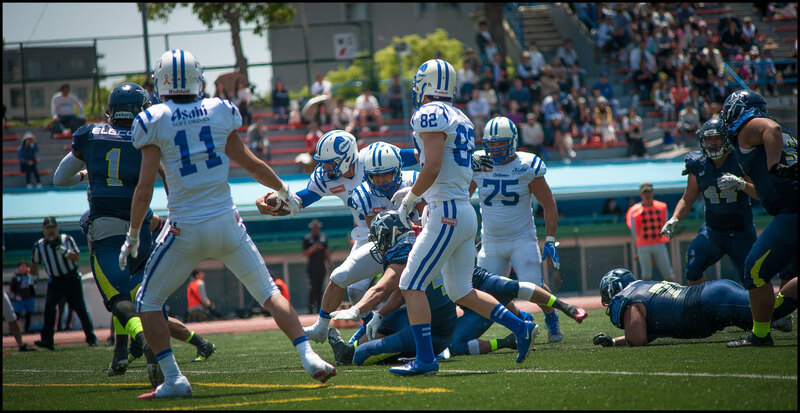 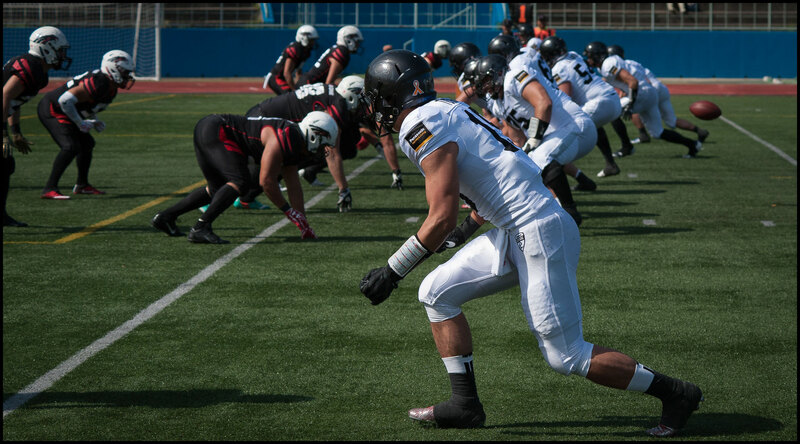 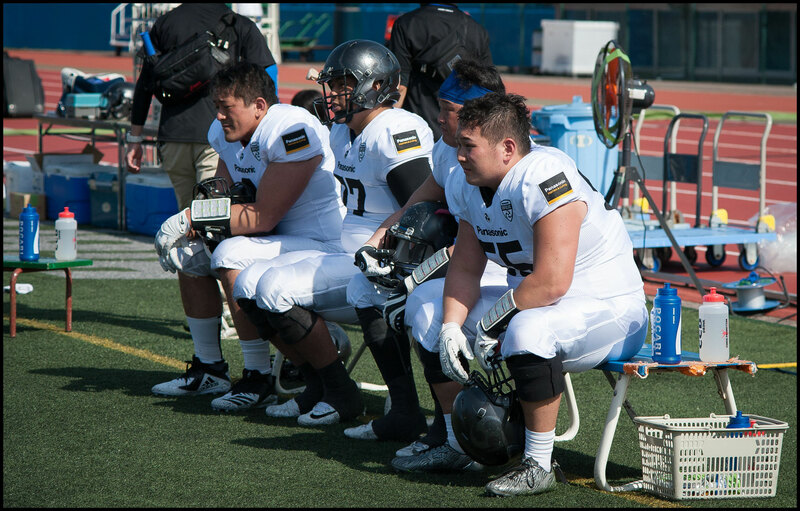 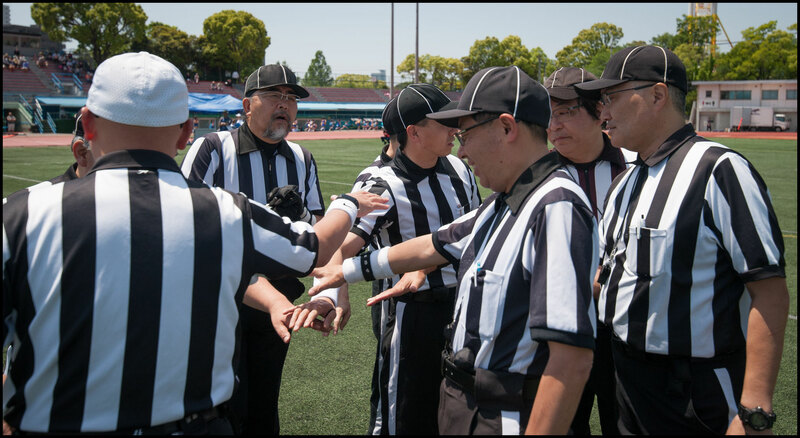 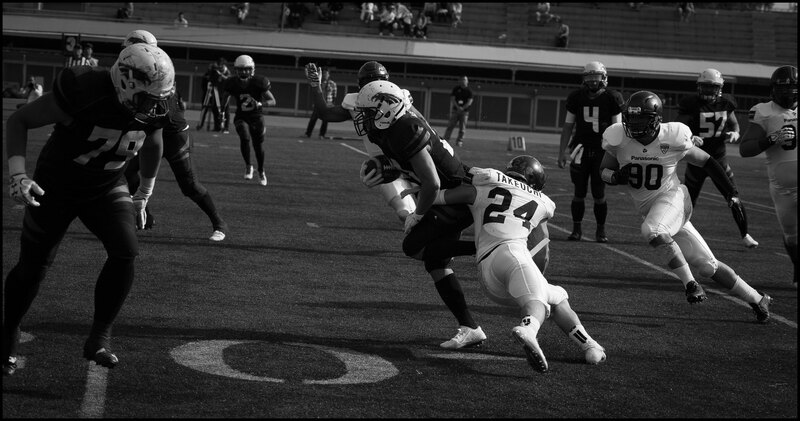 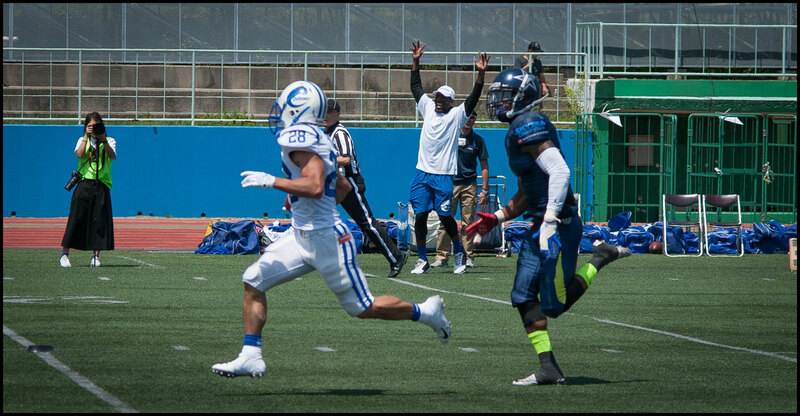 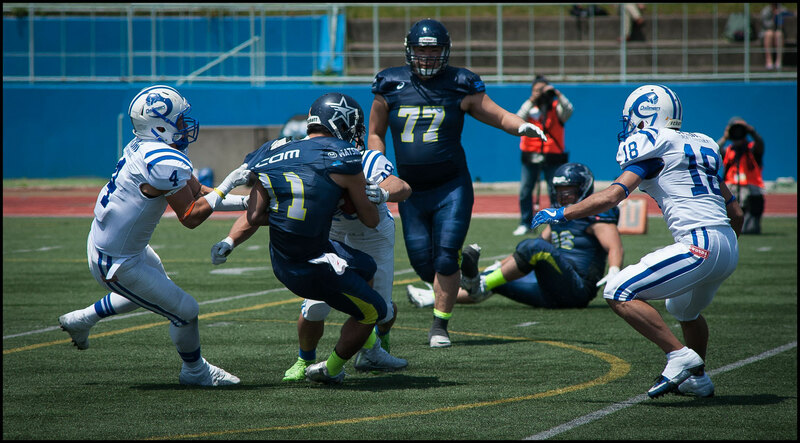 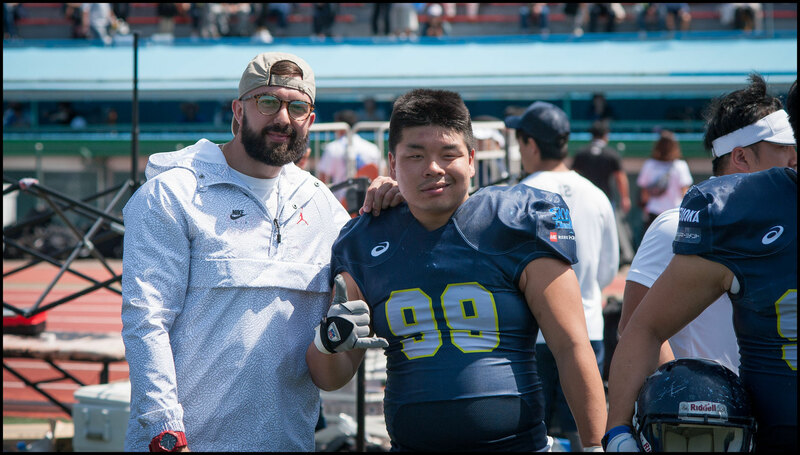 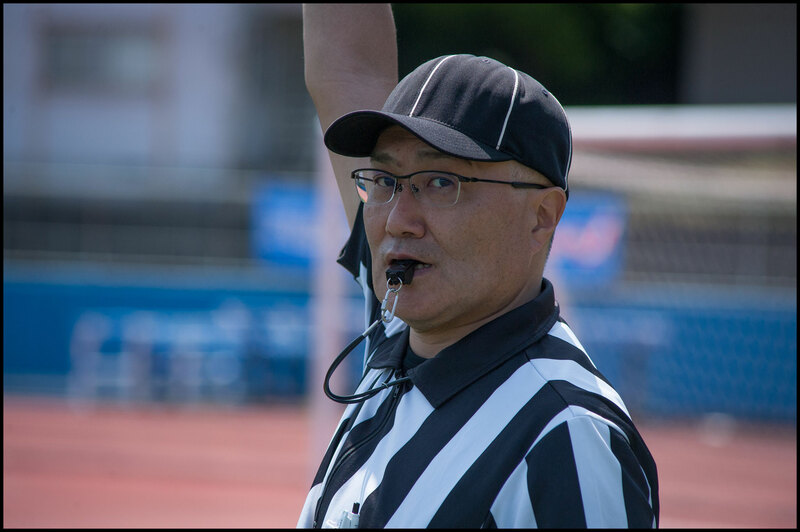 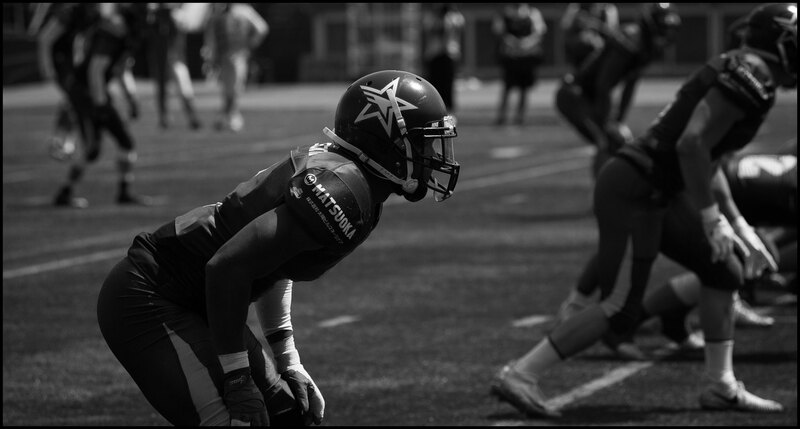 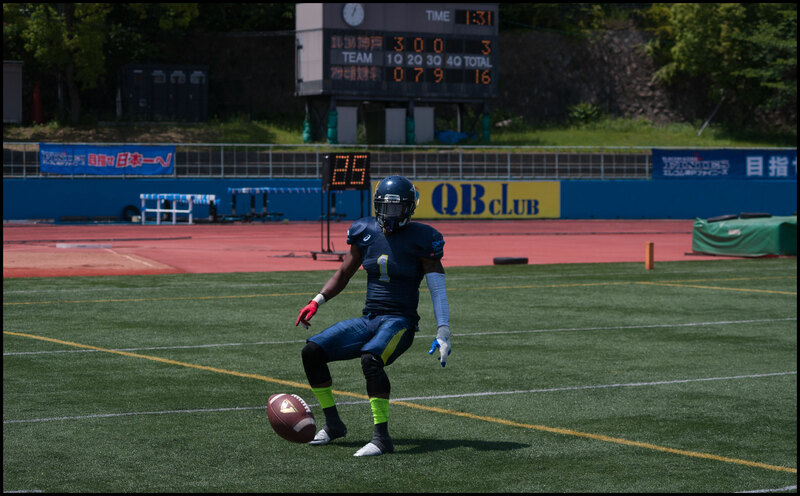 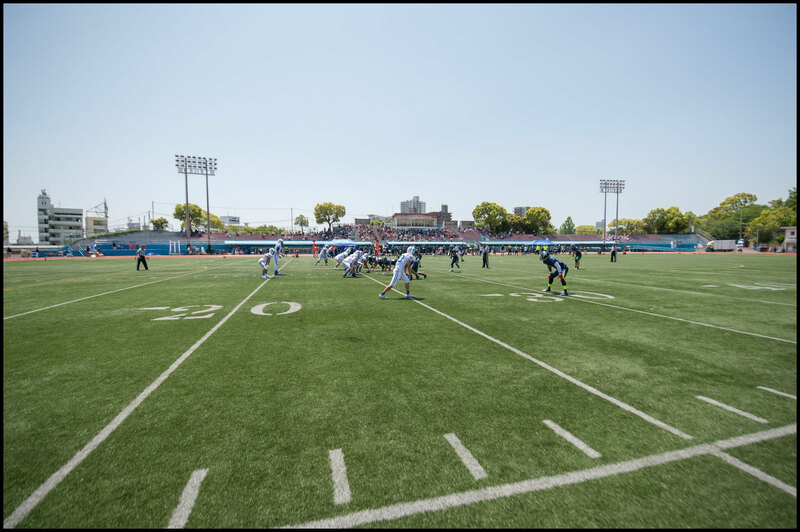 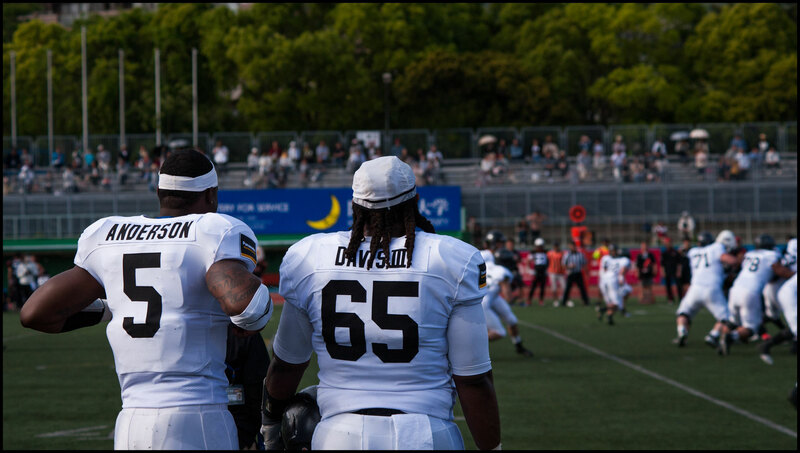 Panasonic Impulse laid down a marker for the X-league’s West Division with their 63-0 dismantling of As One Black Eagles at Oji Stadium, Kobe on Sunday in the second of two Green Bowl games played on a sunny and breezy Children’s Day. 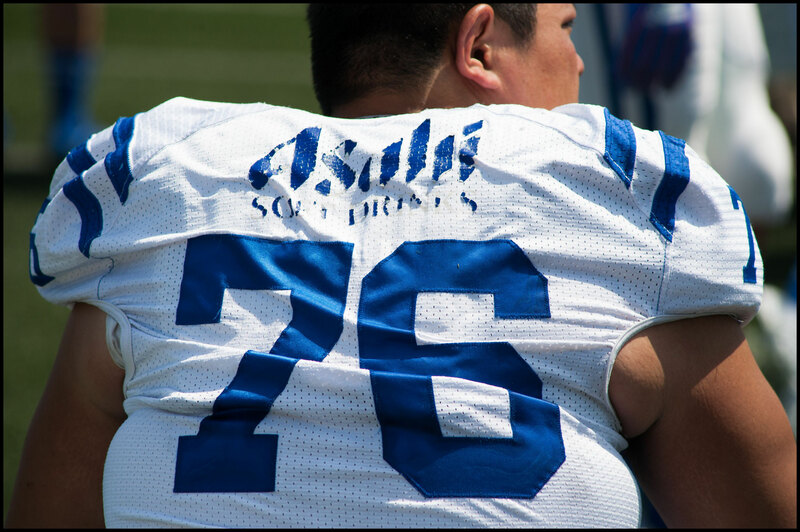 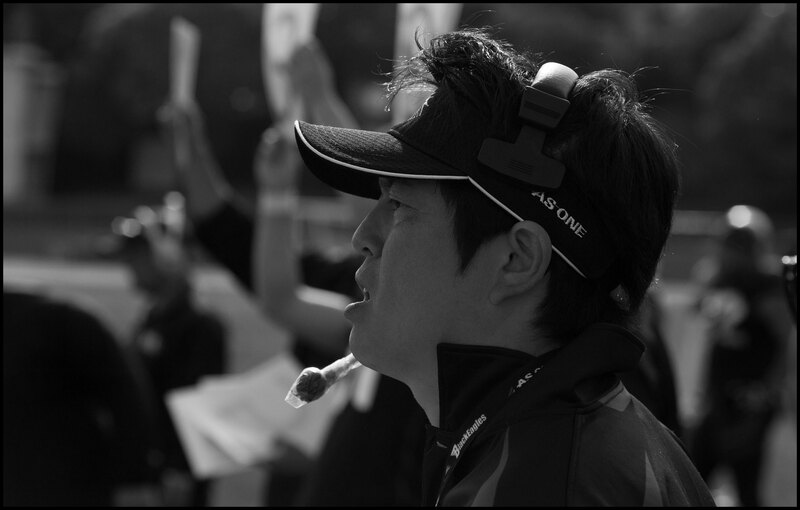 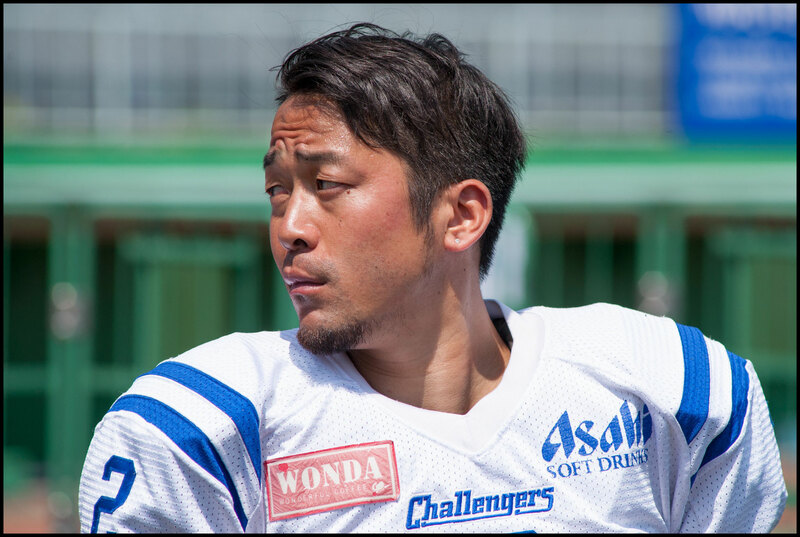 With the win, Impulse progress to their eighth straight Green Bowl final appearance, where they will face the Asahi Soft Drinks Challengers. 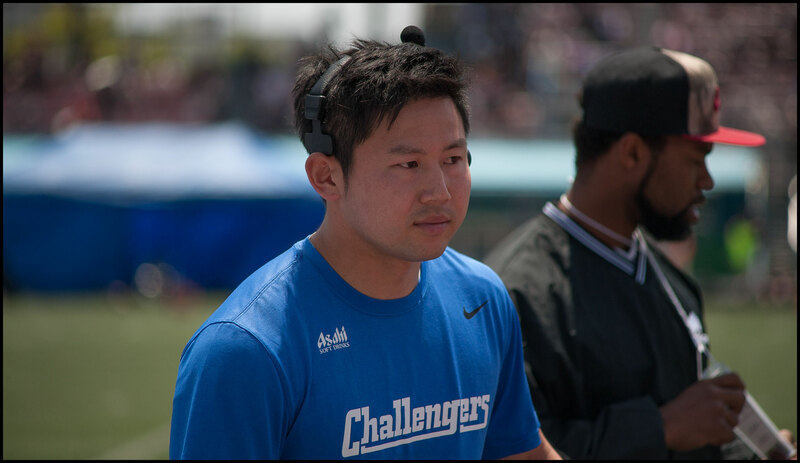 The Challengers return to the final for the first time in two years after defeating Elecom Kobe Finies in the first game of the day. 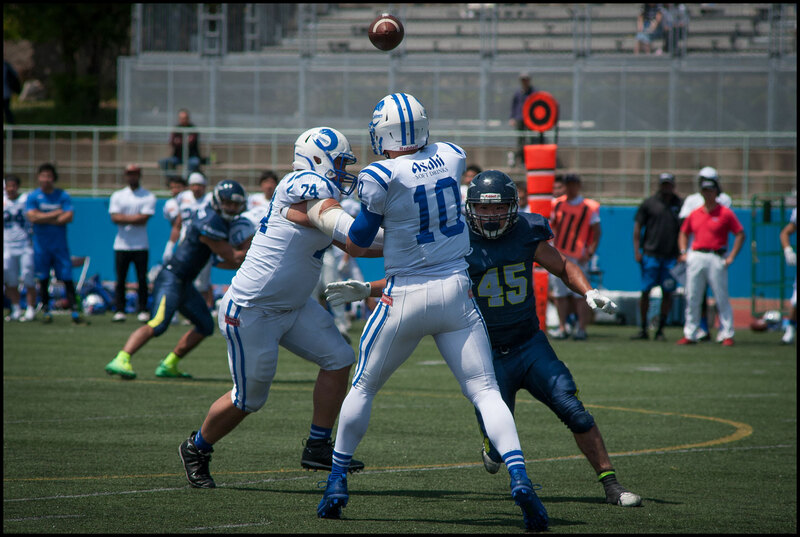 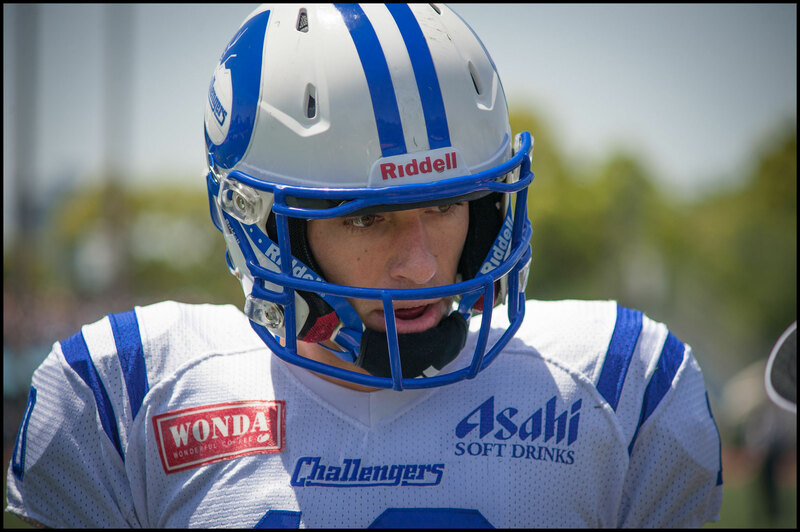 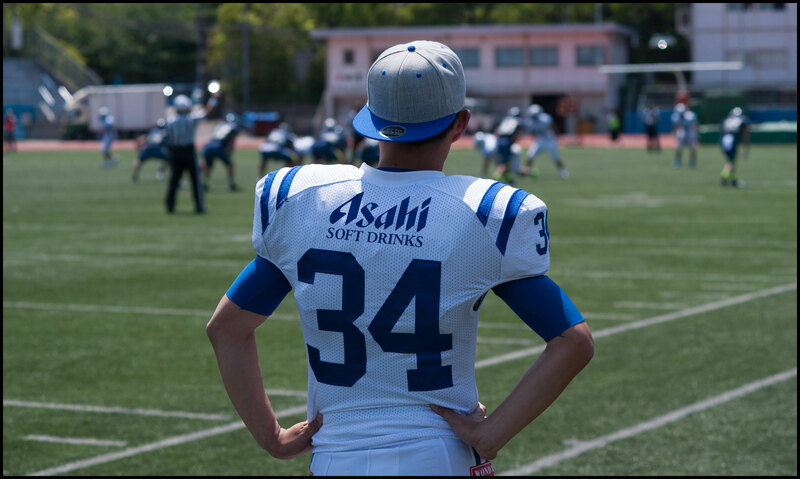 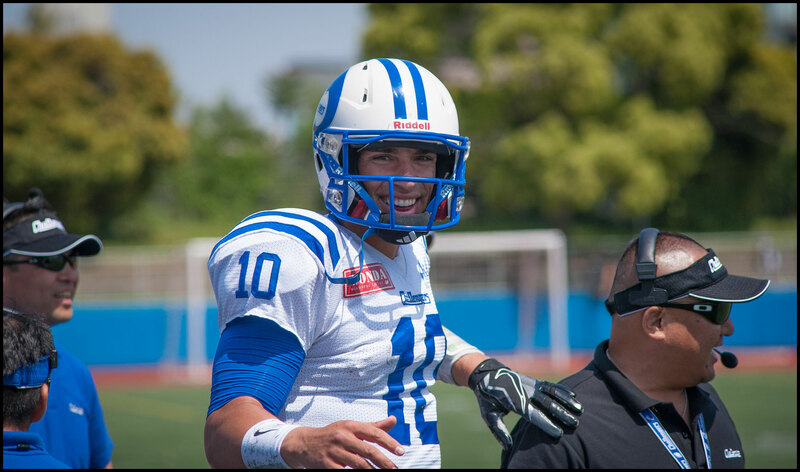 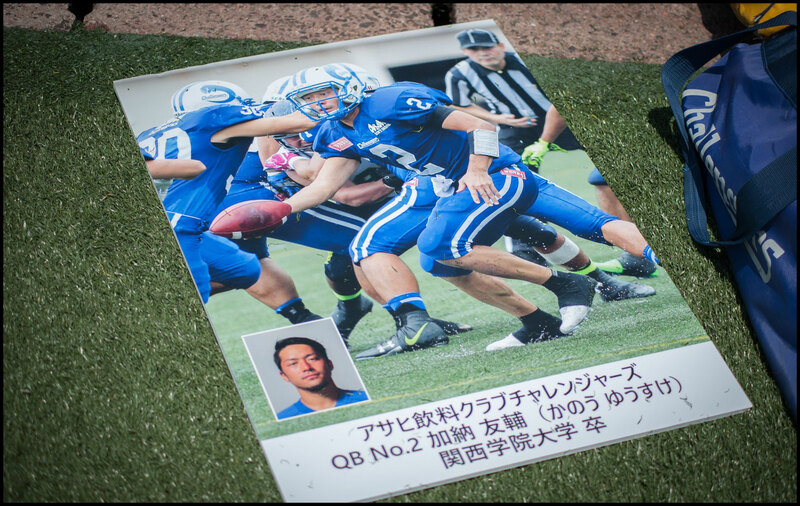 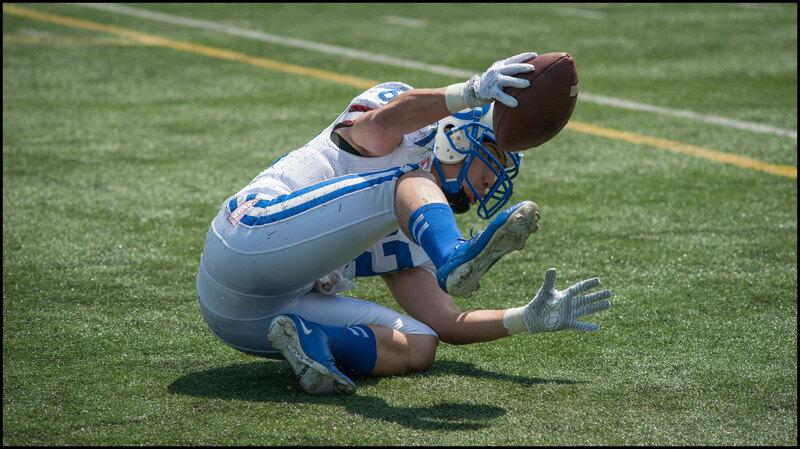 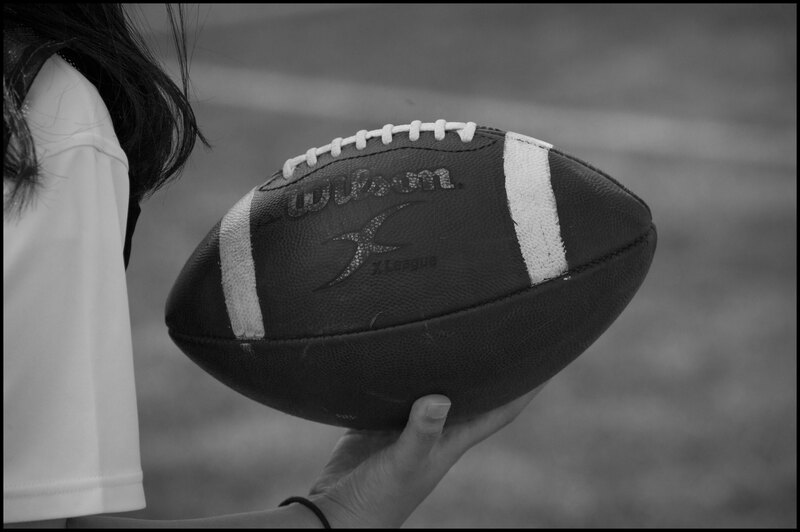 Asahi are led by American QB, Alex Niznak, who was on the sidelines ineligible to play for the corresponding game last year. 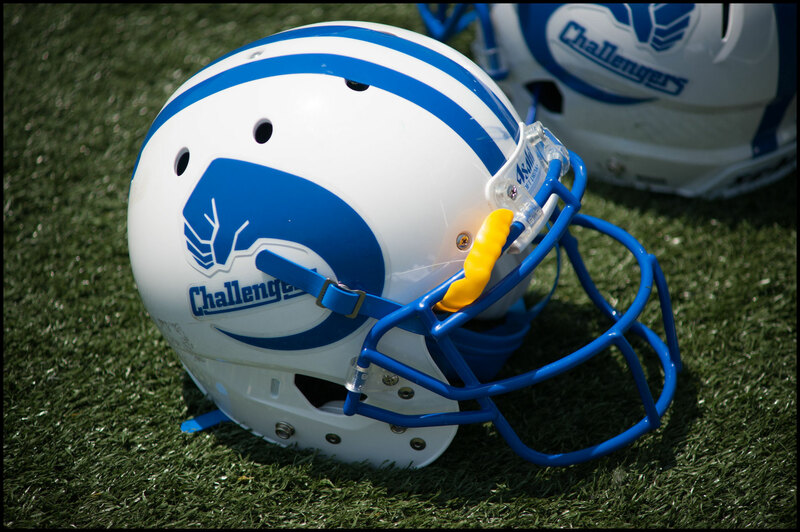 Challengers lost that one 10-7 to Finies in a game that went down to the wire. 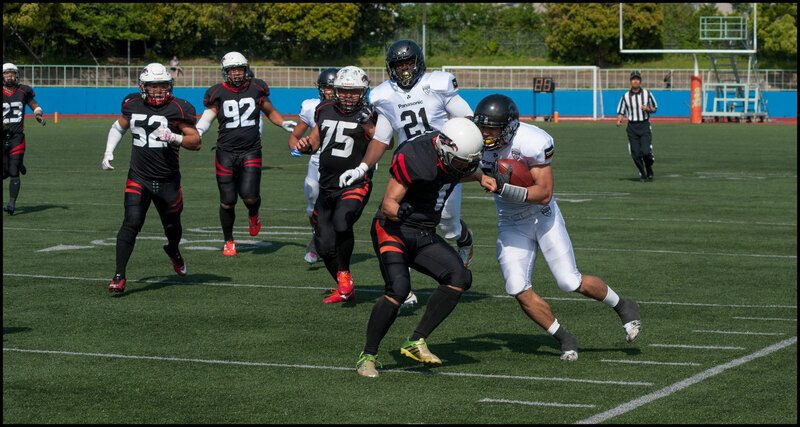 This year Niznak got revenge and his team’s first points of 2018 with a rushing TD in the second quarter. 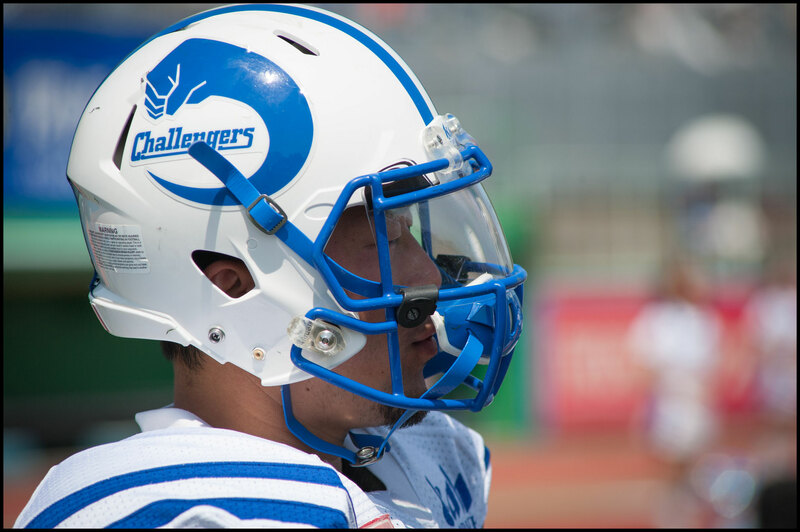 That gave Challengers a lead they never relinquished as they ran out 23-10 victors. 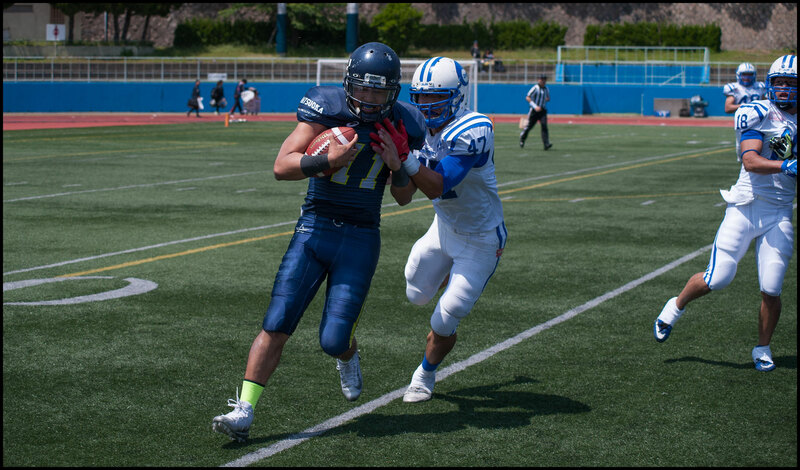 Niznak was in last year. 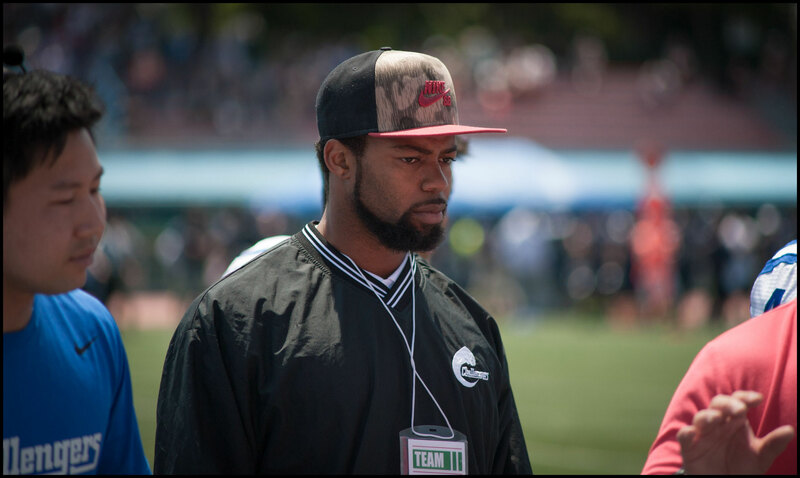 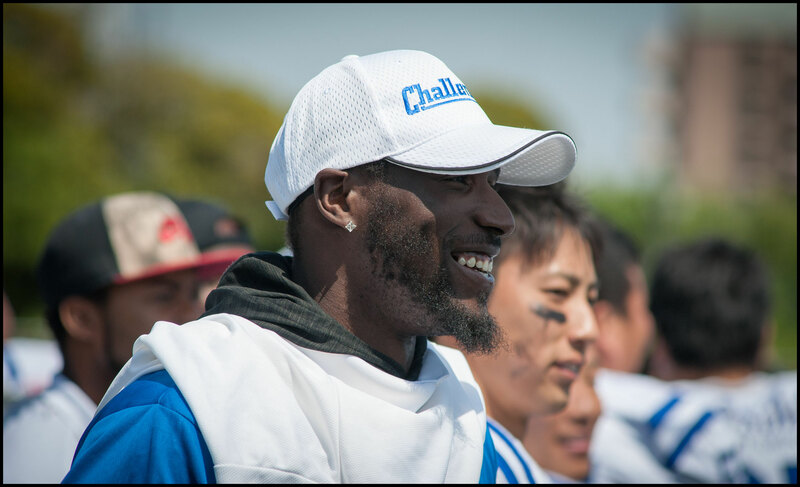 Another second-year American for the Challengers, DB Clint Floyd Jr., was also on the sidelines battling a stomach ailment but said he is planning to play in the final. 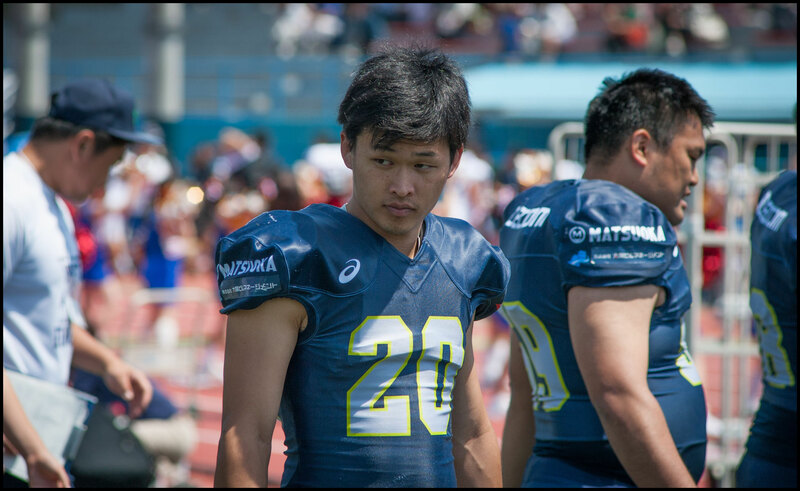 Three of Asahi’s Japanese players that play the same positions as the Americans had notable games against the Finies. 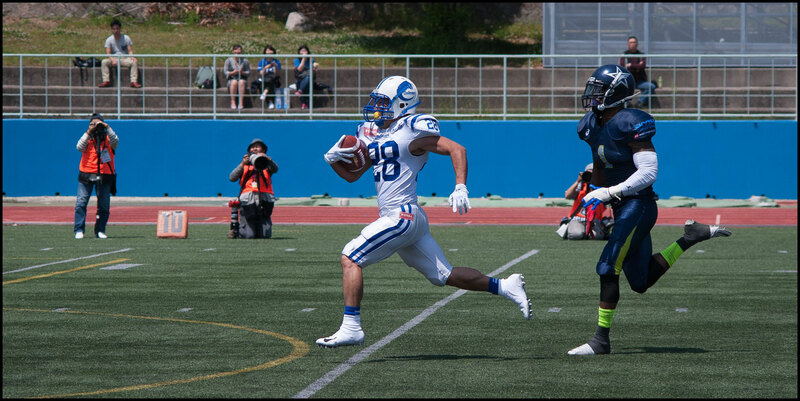 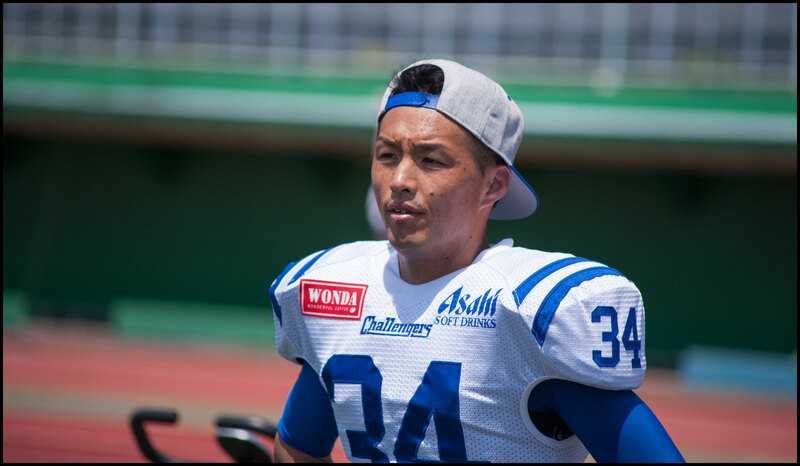 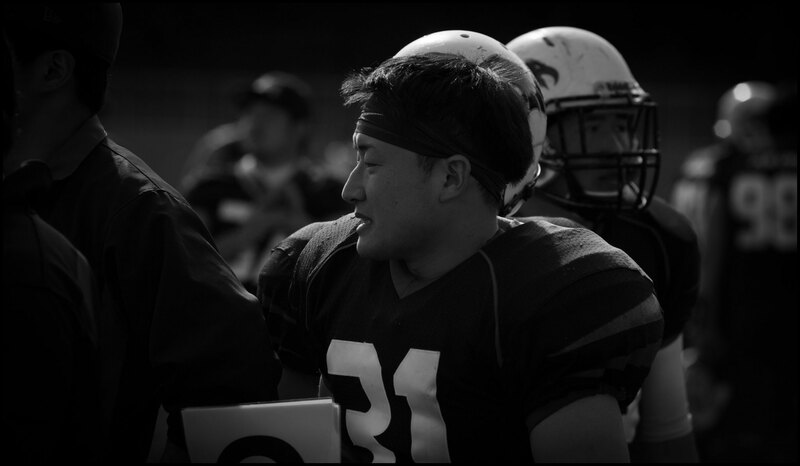 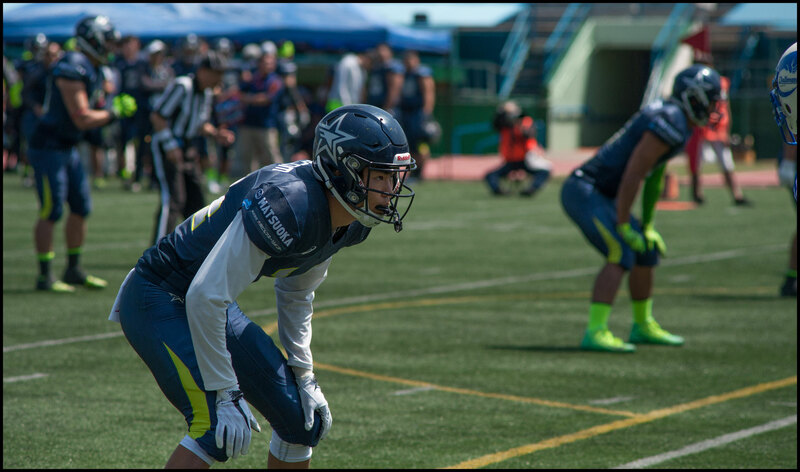 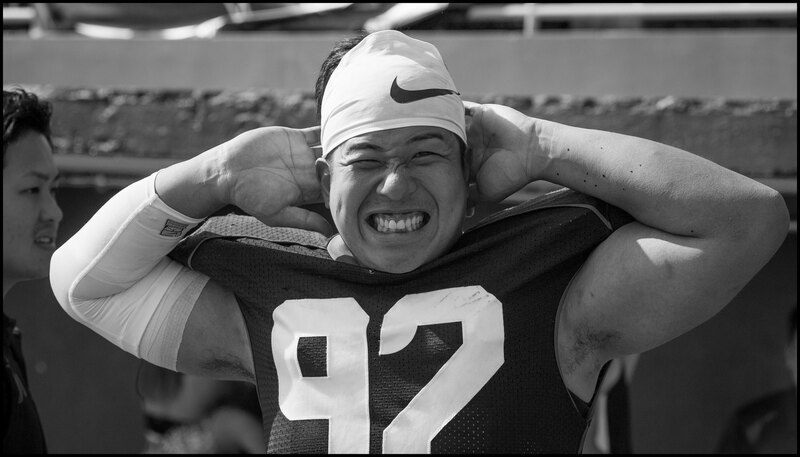 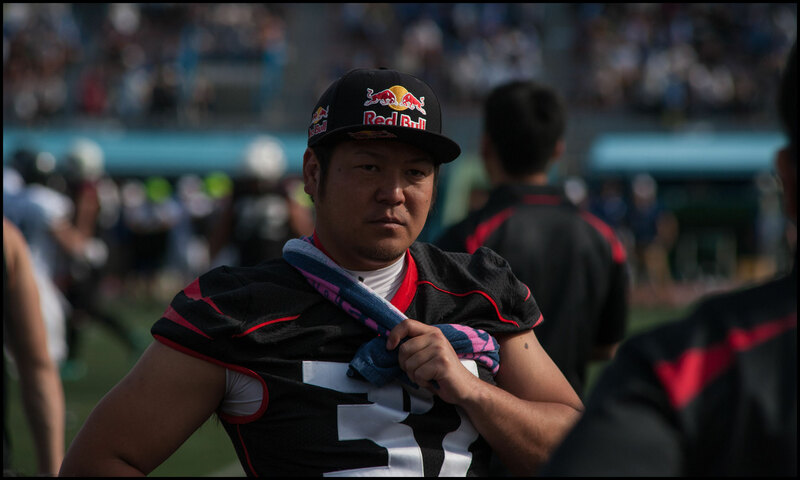 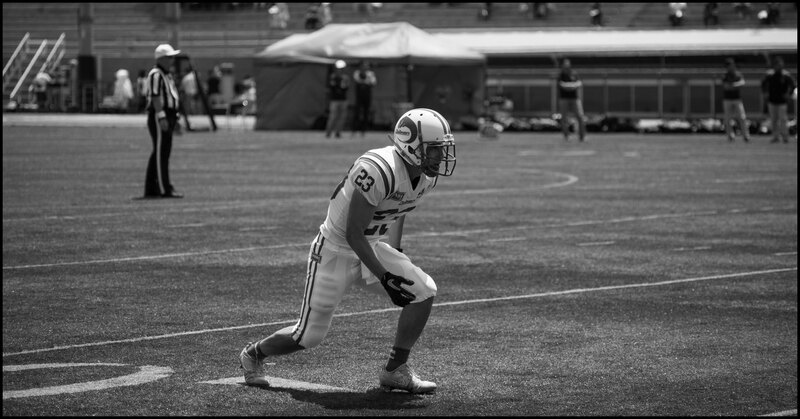 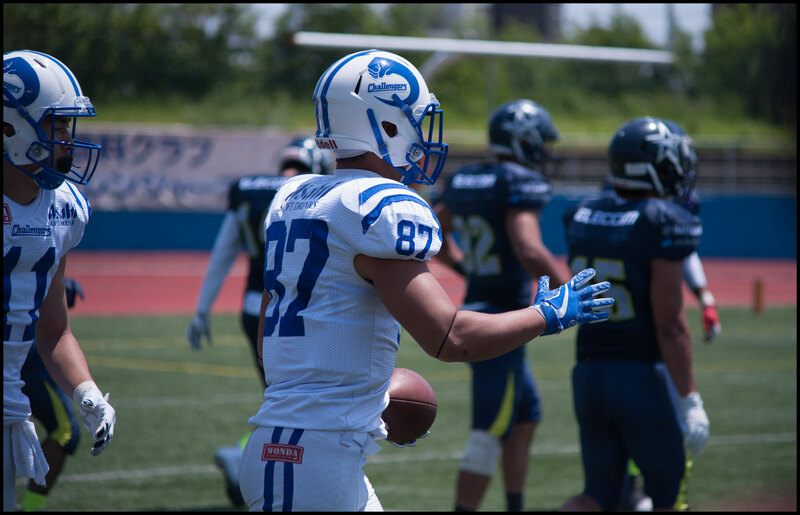 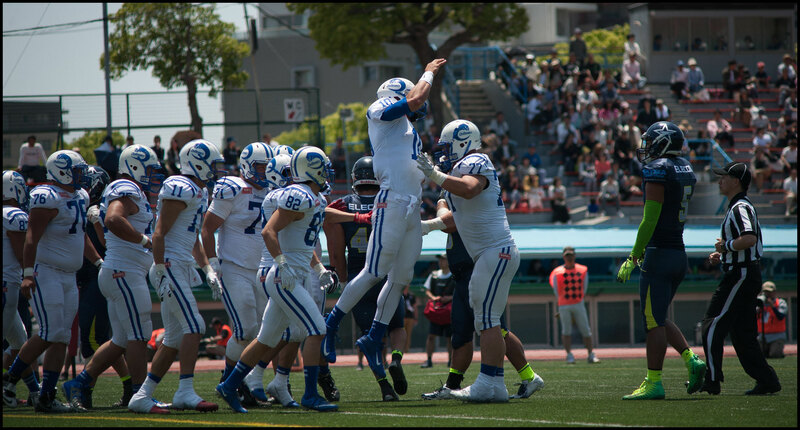 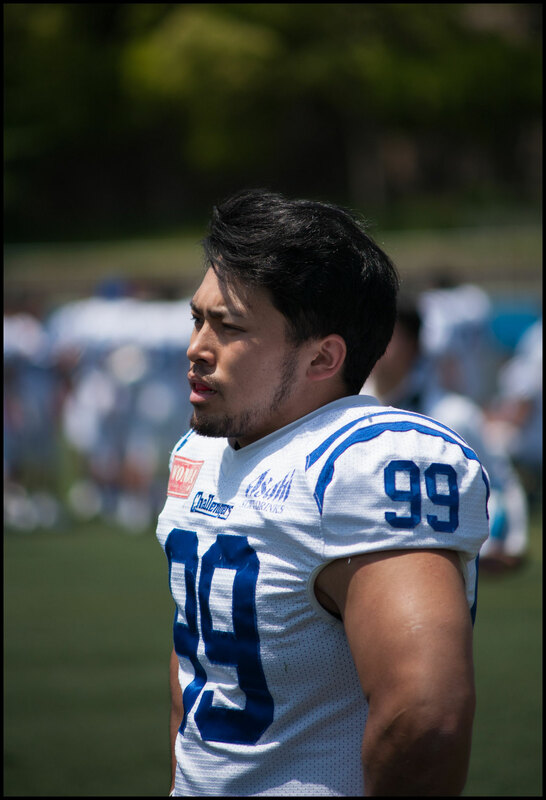 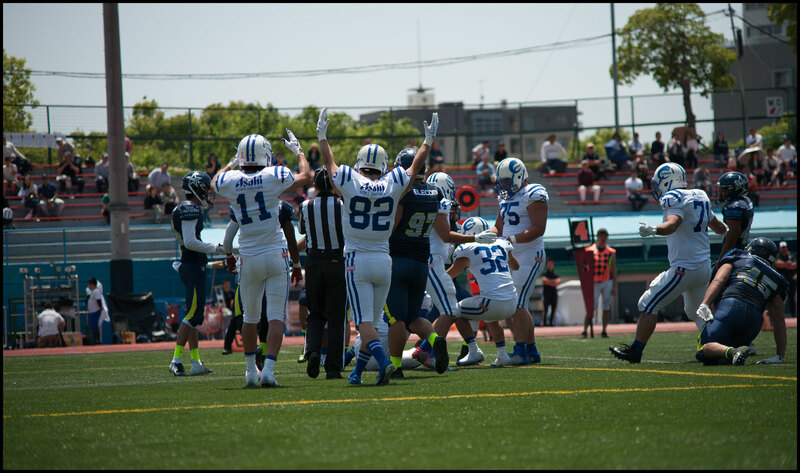 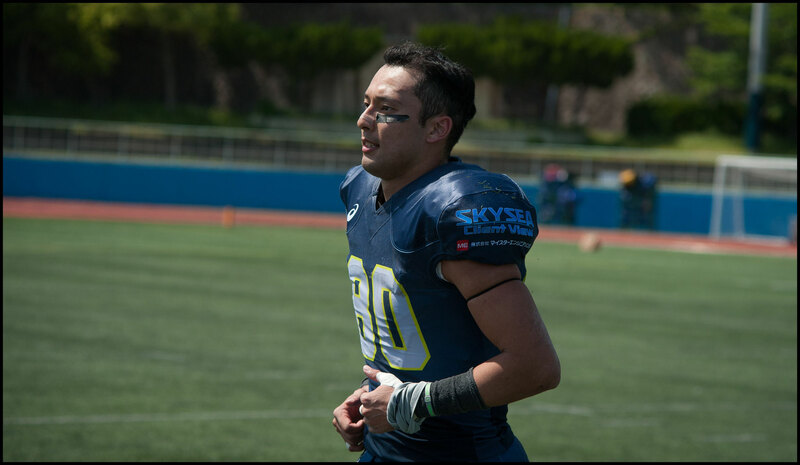 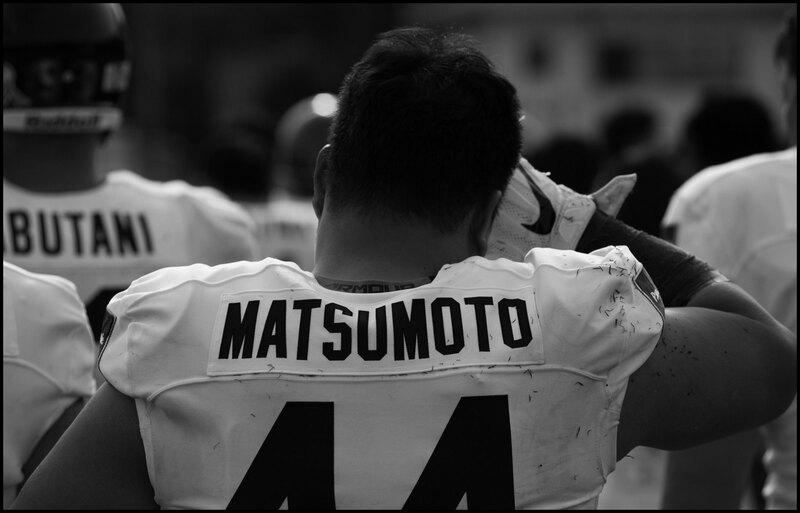 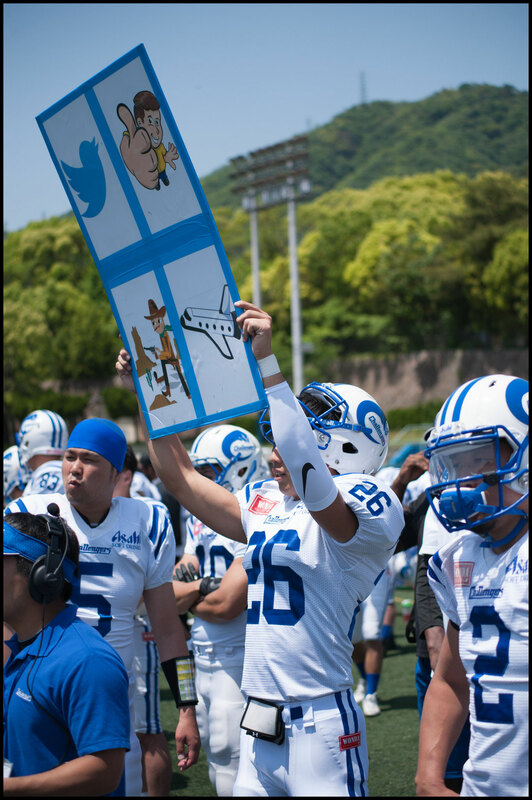 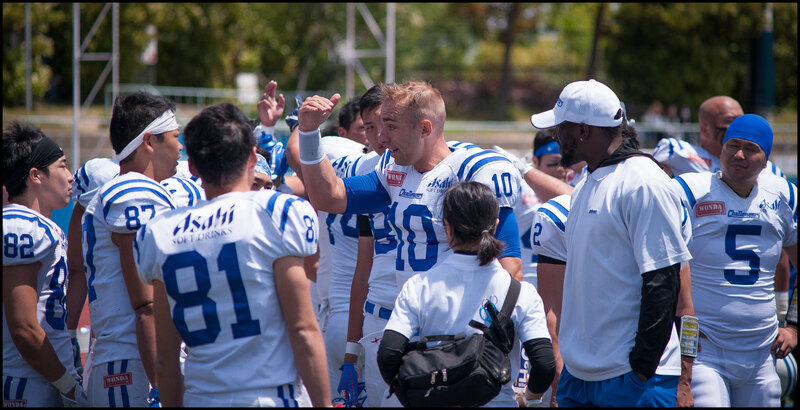 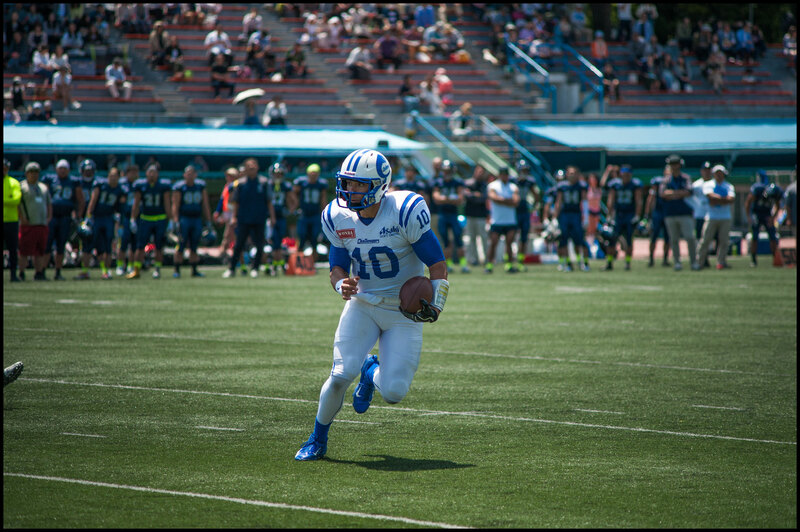 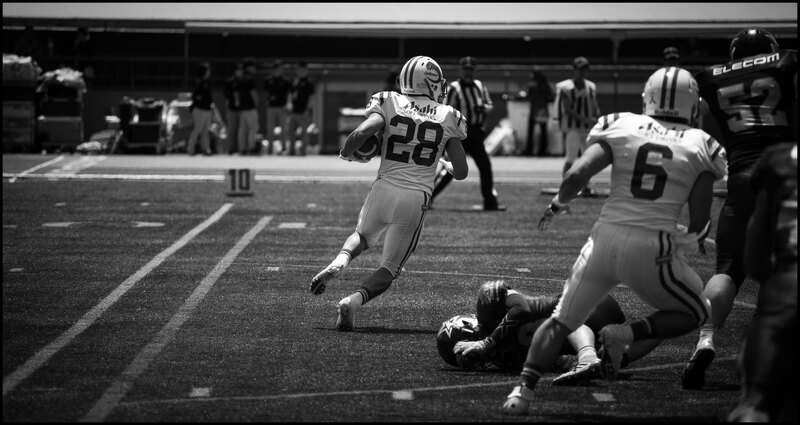 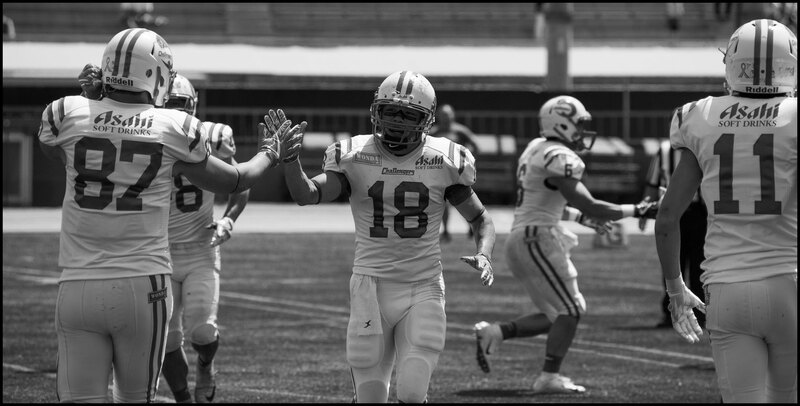 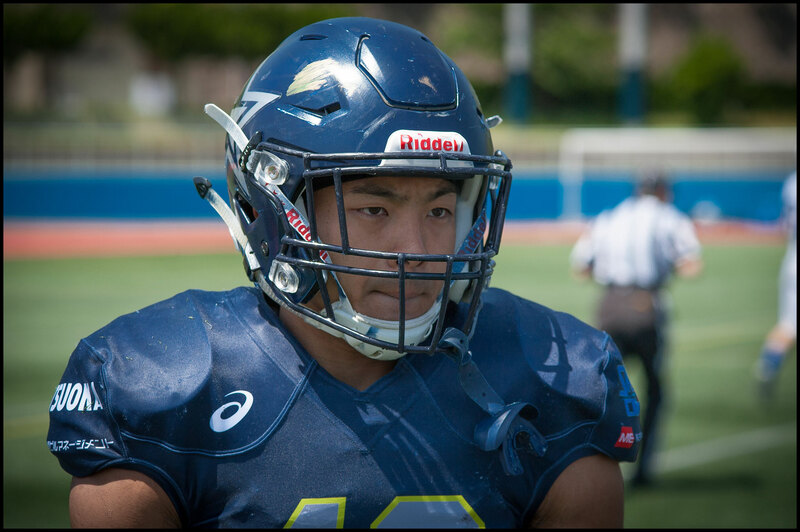 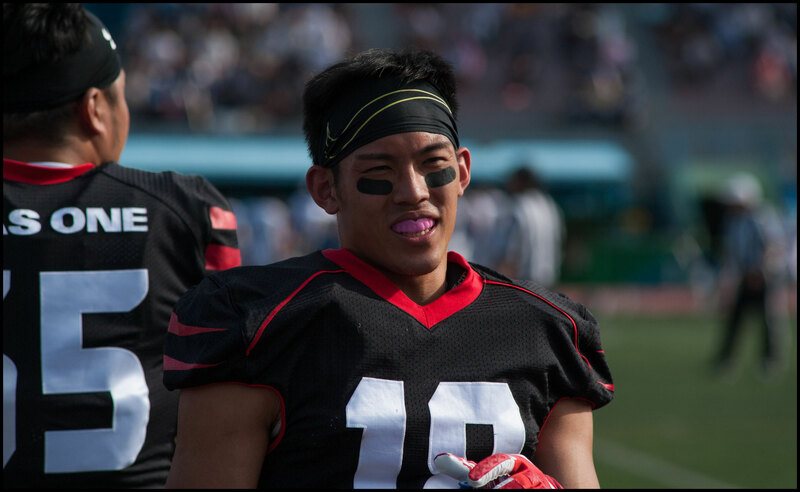 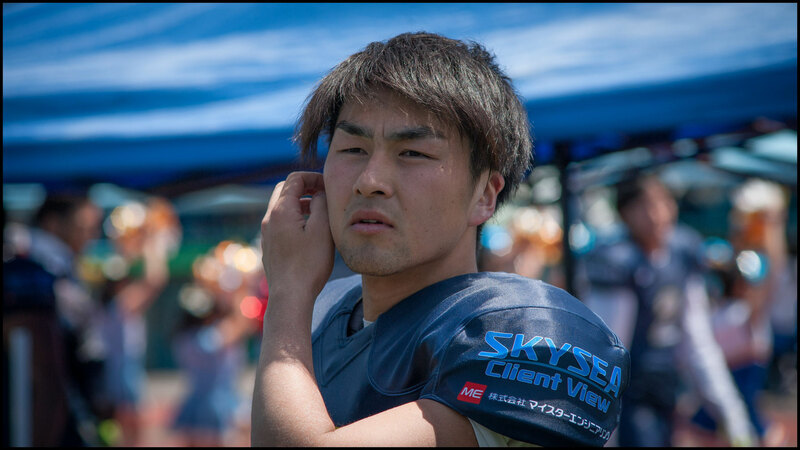 DB Takeshi Masui grabbed two interceptions, LB Kenshiro Oe recorded two sacks and just missed an interception, and Yutaka Tatsumi had a kickoff return for a TD. 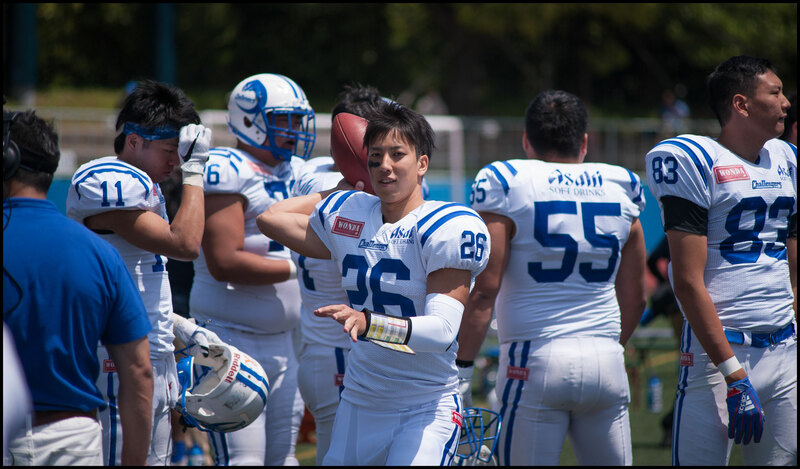 The man who kicked that ball for the Finies, Masayuki Tanaka, also started at DB and had two interception chances himself but couldn’t hang on to either. 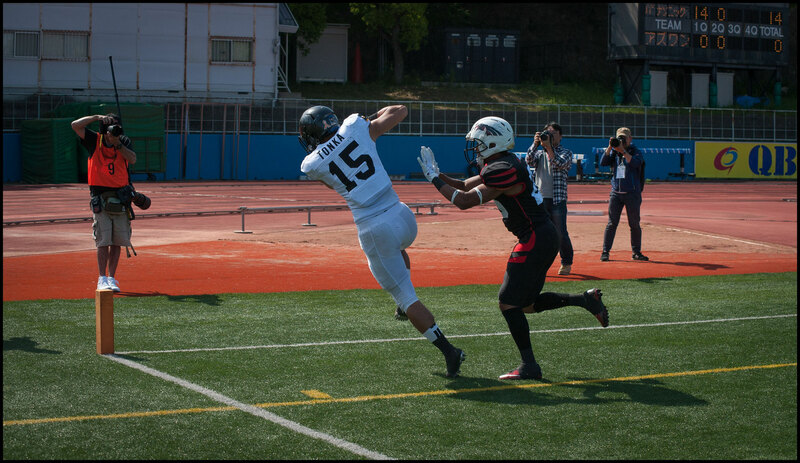 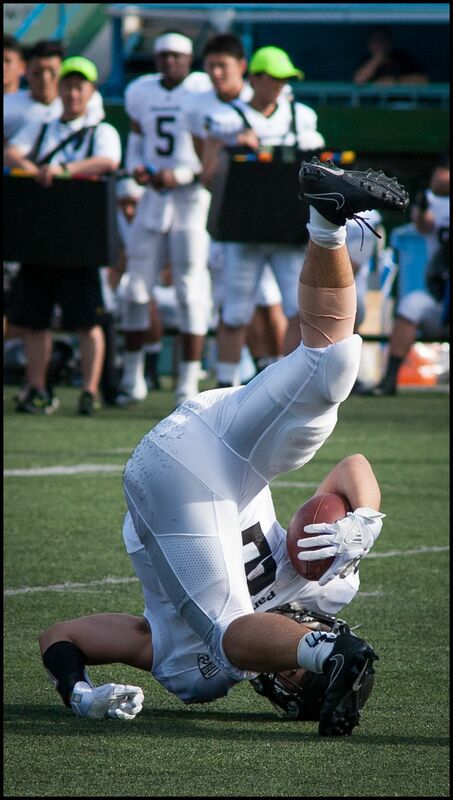 Aside from DB Sean Draper, the foreign players for the Finies were not in uniform. 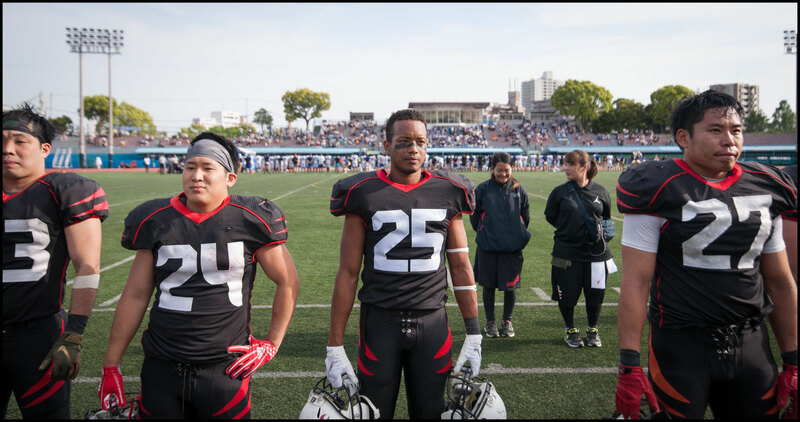 In the day’s second game, Black Eagles faced Panasonic Impulse with their imposing American imports. 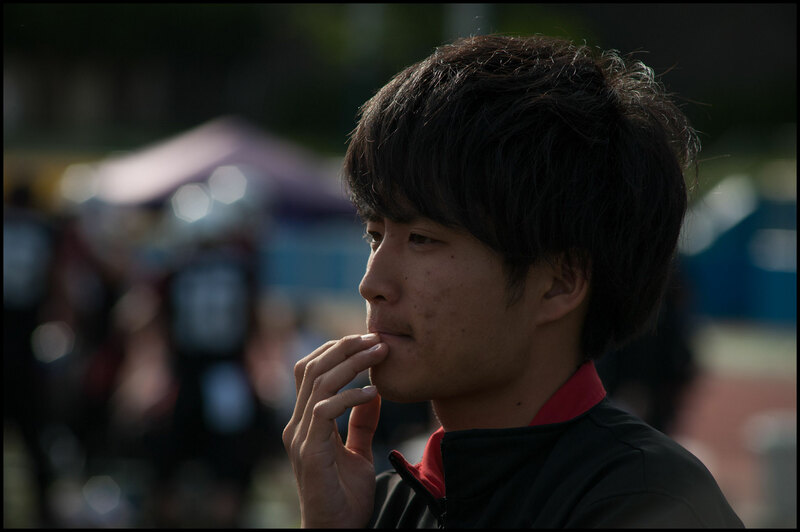 Impulse are also packed with domestic players as strong and fast as anybody in the X-league. 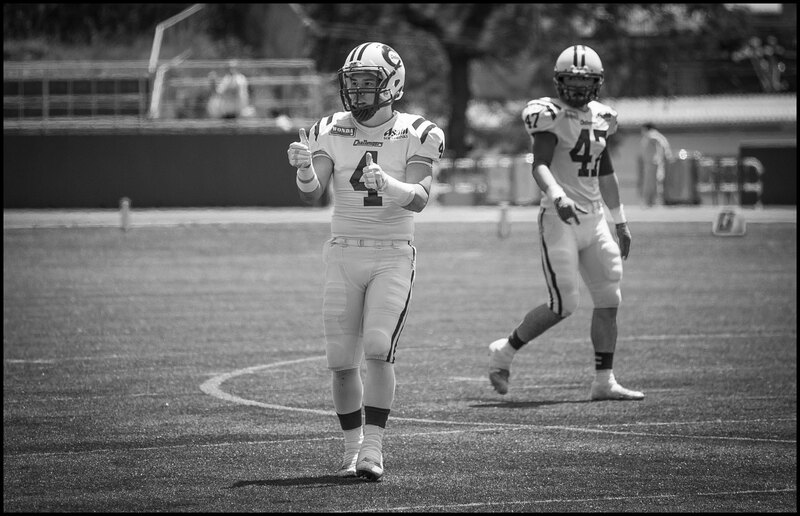 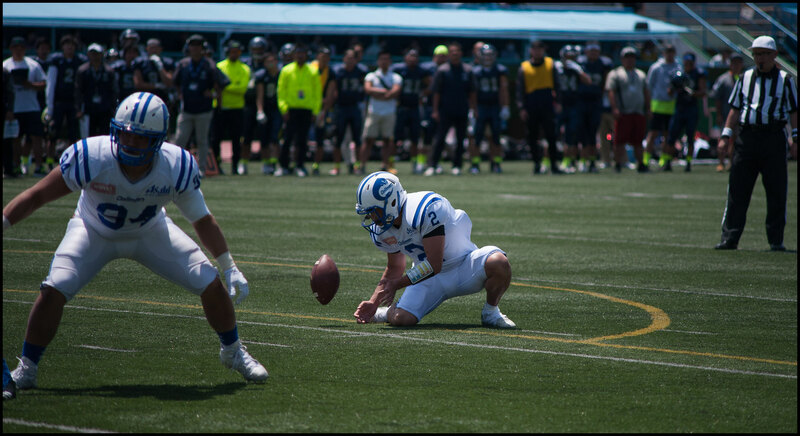 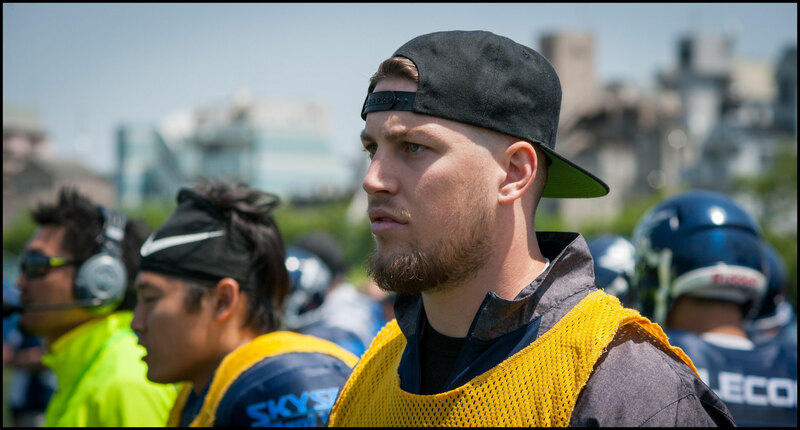 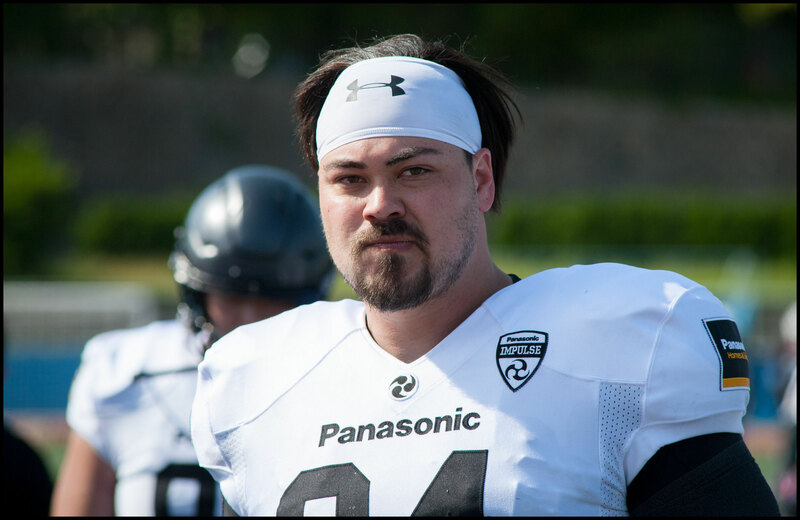 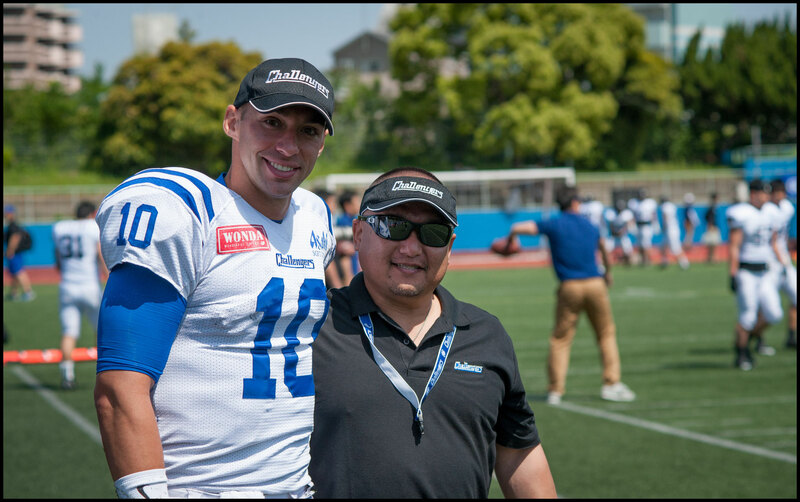 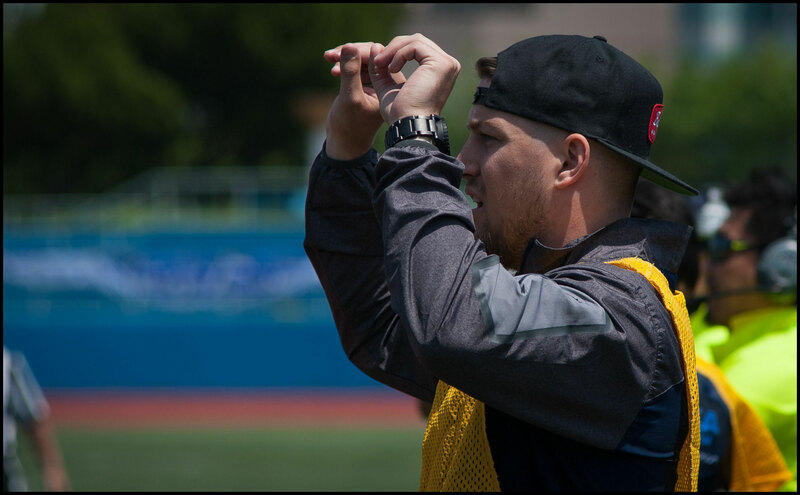 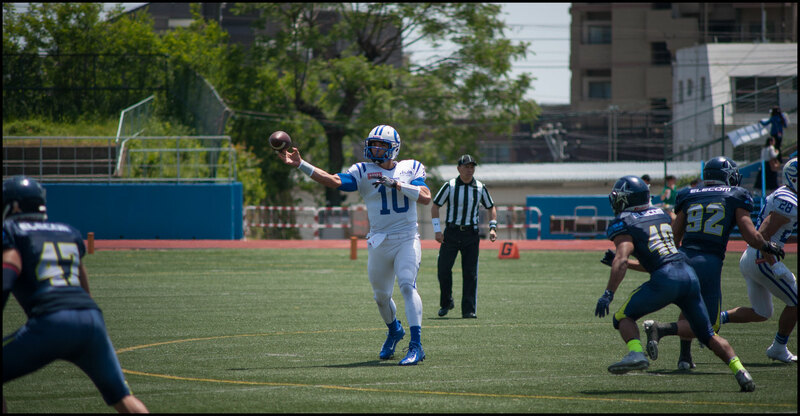 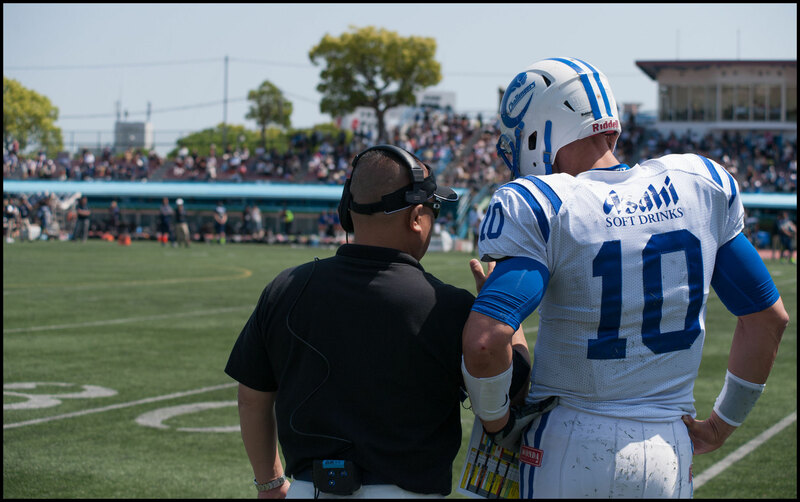 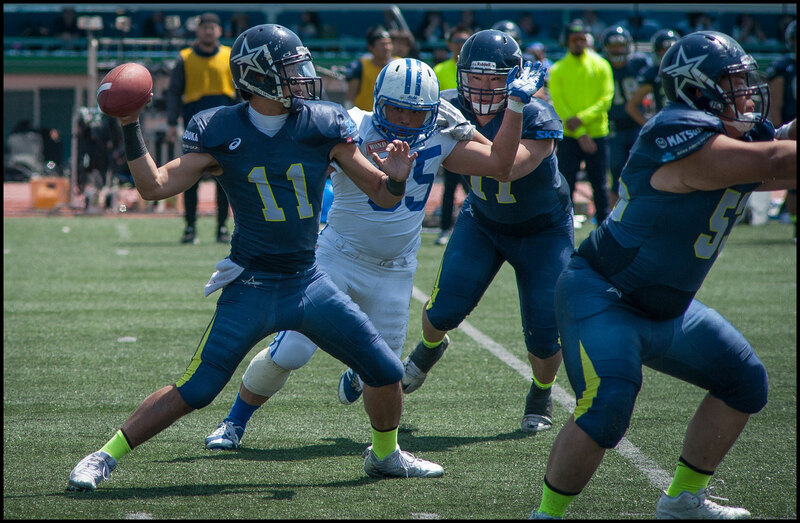 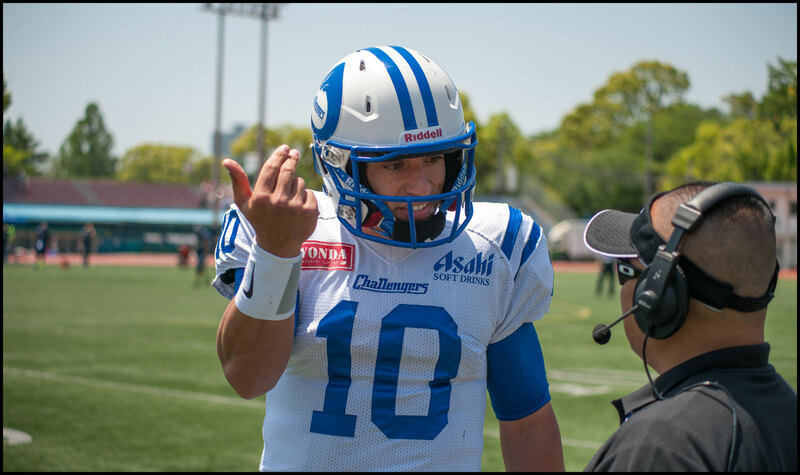 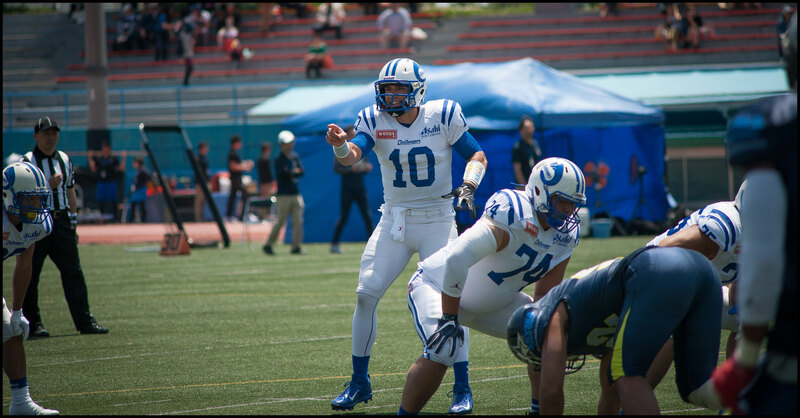 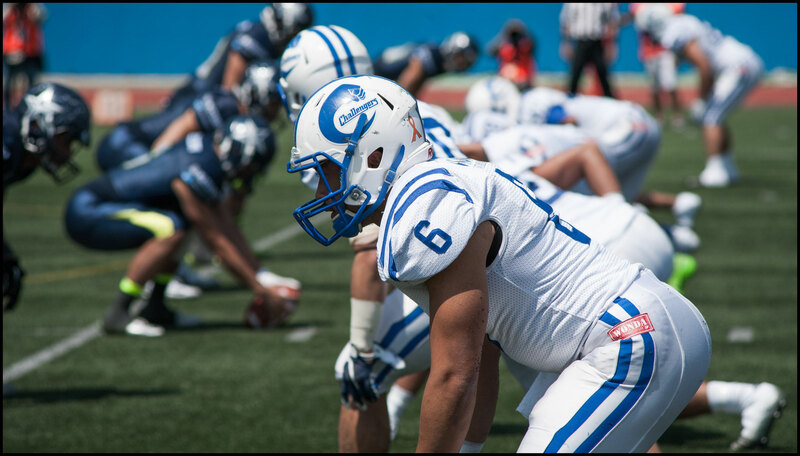 Former Sagamihara Rise QB Benjamin Anderson, in his second year with Impulse, leads an offense that runs the spread option out of the pistol formation. 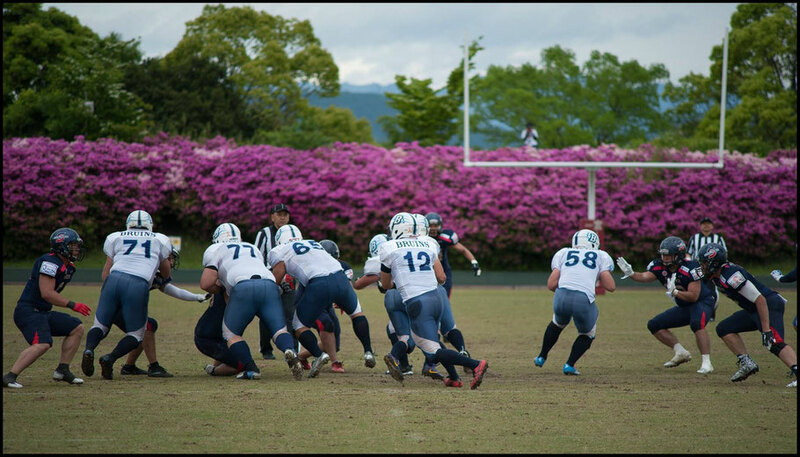 In this system, the QB, with his RB behind him, stands a few yards back from the center at the start of each play. 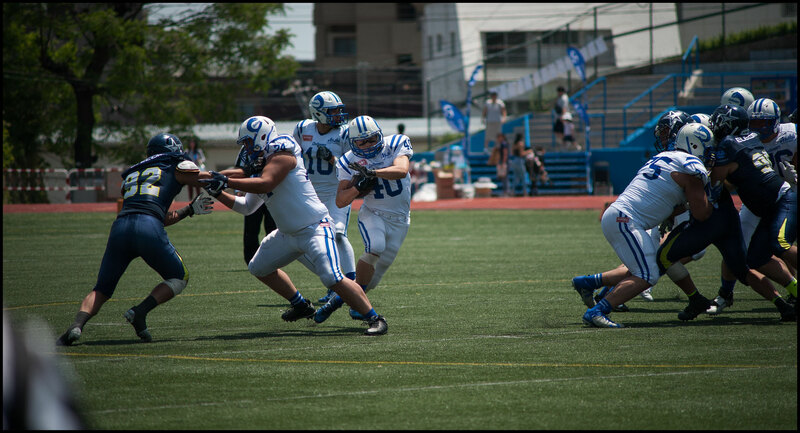 On their bread and butter running plays the QB turns to hand the ball to his RB for an inside run or fakes the handoff and takes off himself. 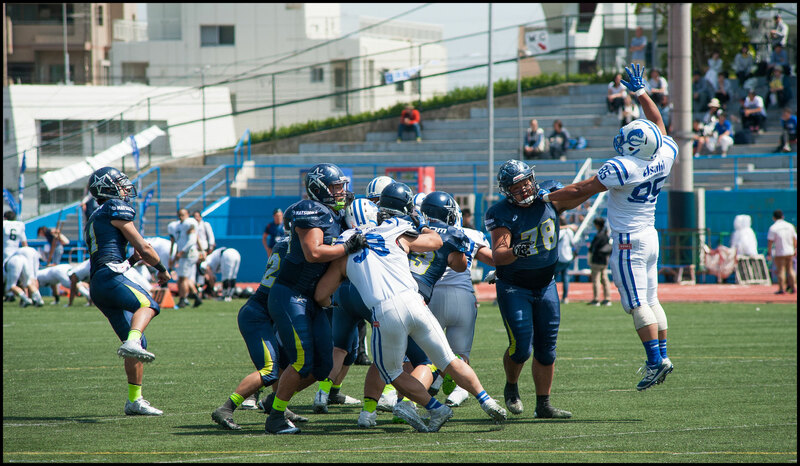 It’s an attack that works best with a tall agile QB, who can see over the offensive line and then break towards open space when the opportunity arrives. 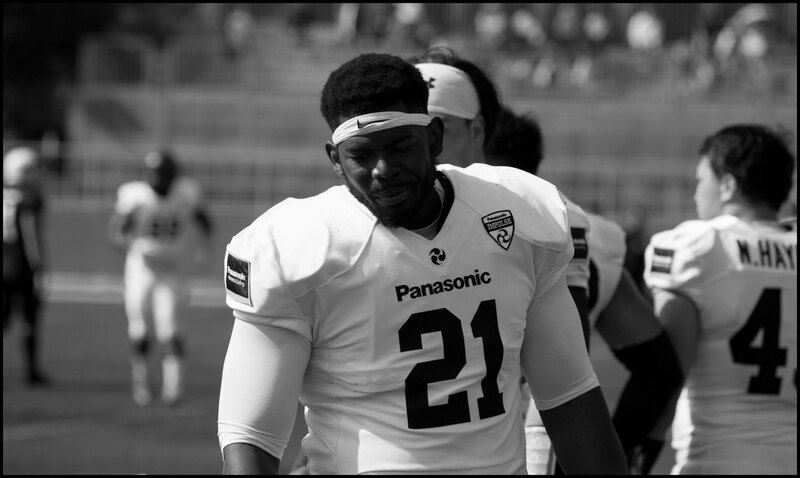 Anderson of course is both tall and fast and had plenty of time against the Black Eagles. 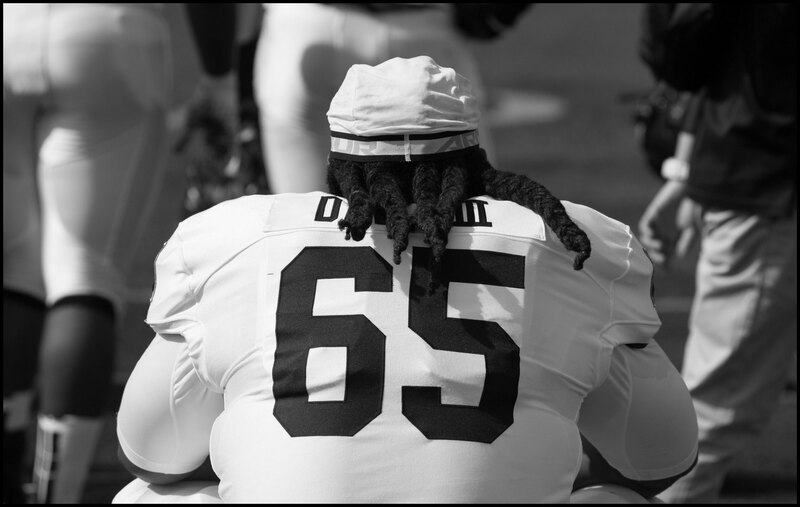 Behind the stout blocking of Edmond Davis III and company on the offensive line, Anderson handed off, threw or scrambled at will. 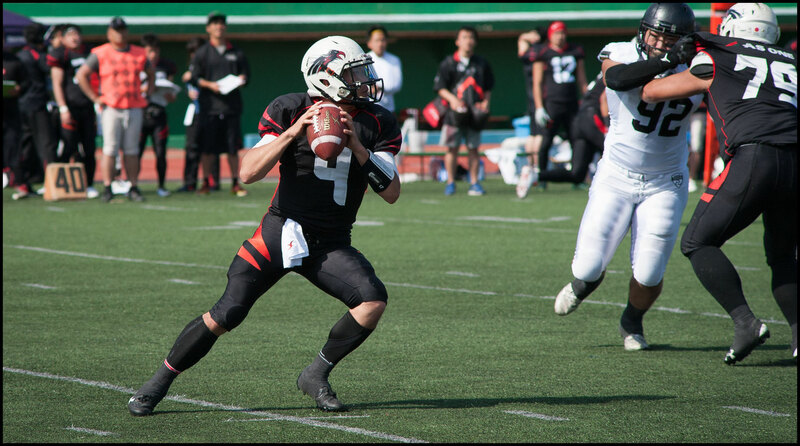 He went 6 of 8 passing for 106 yards while rushing for 45 yards and a TD. 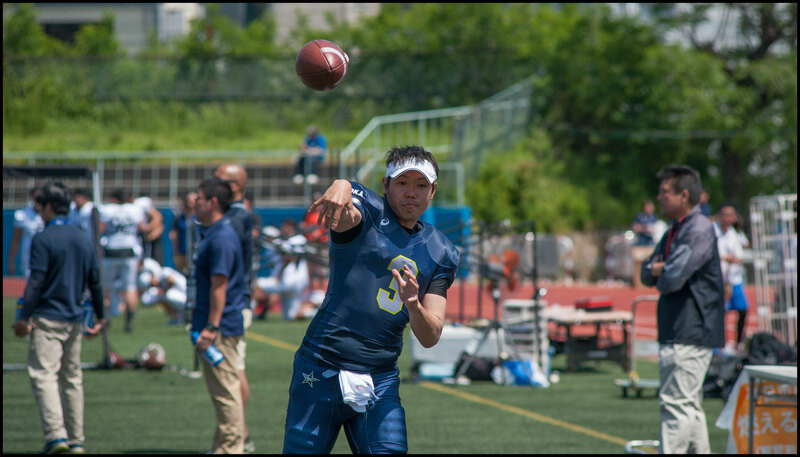 With everything working smoothly Anderson was quickly replaced with the second and then third-string QBs. 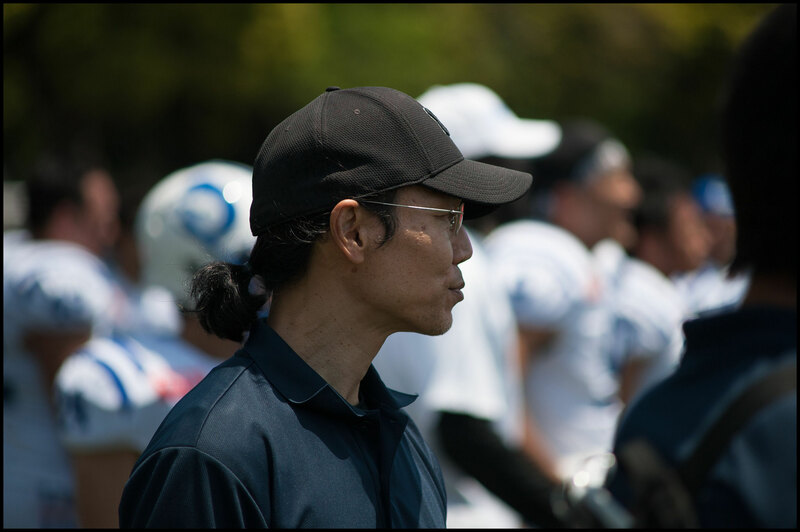 They didn’t fare quite as well, giving up an INT and only completing 6 passes between them, but the pace of play and demeanor of the Impulse offense was calm, controlled, and punctuated by big gains. 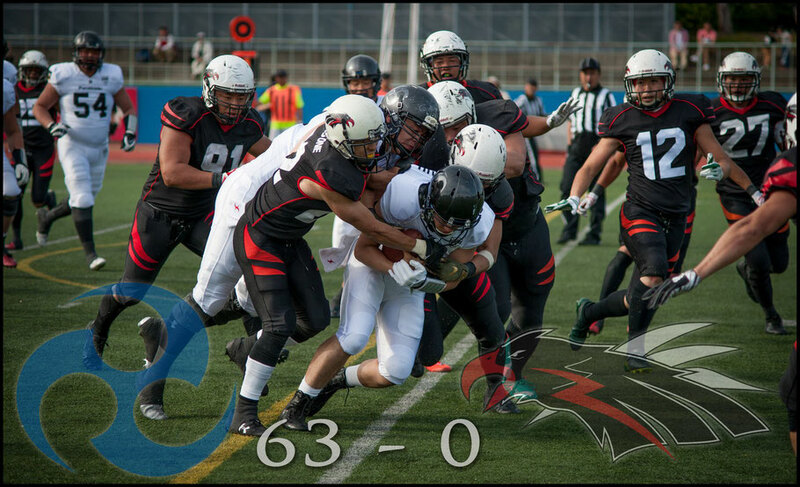 The score was 35-0 at the half. 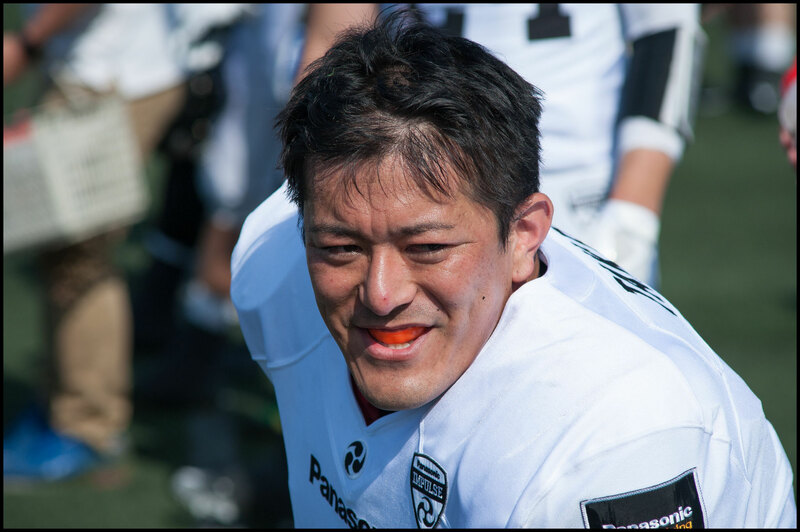 Both teams remained on the sidelines during the break and the mood was playful on the Panasonic bench, where the players could be seen laughing and bouncing into each other. 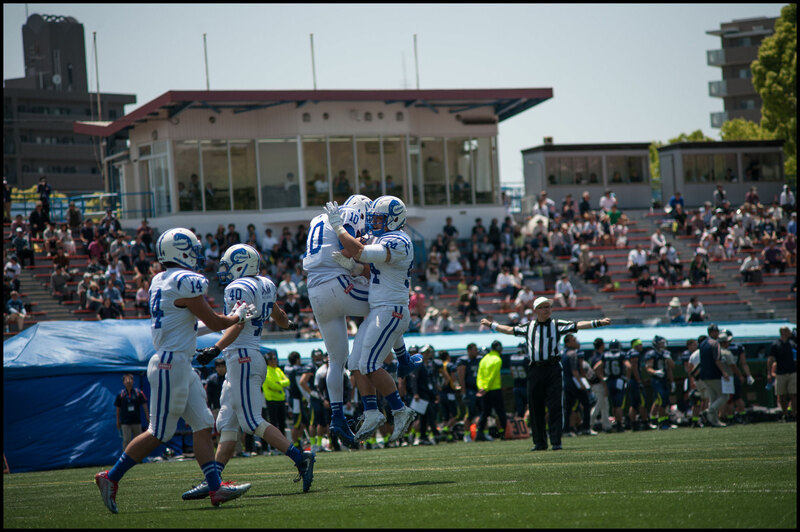 The reasons to smile just kept coming as Impulse returned the opening kickoff of the second half for another TD. 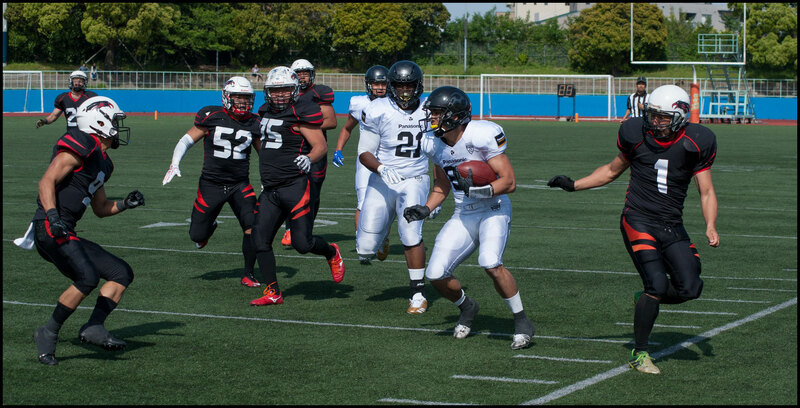 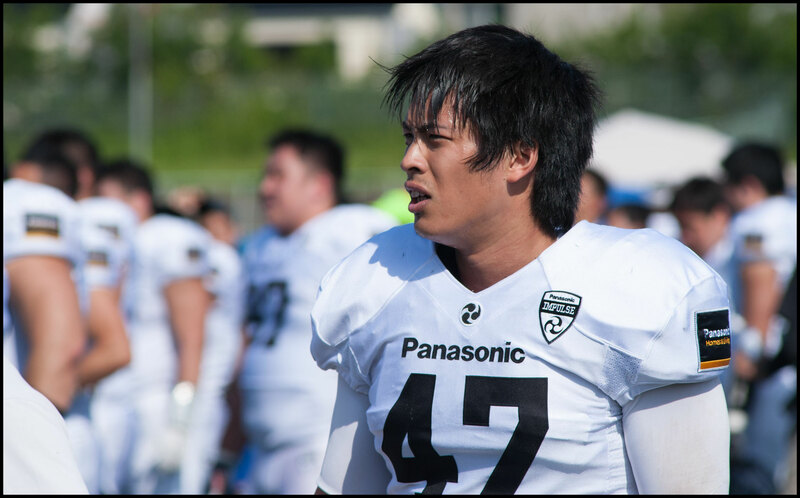 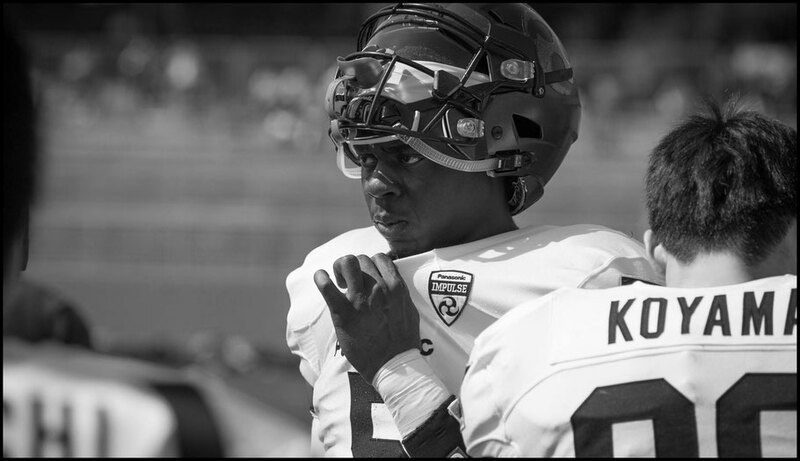 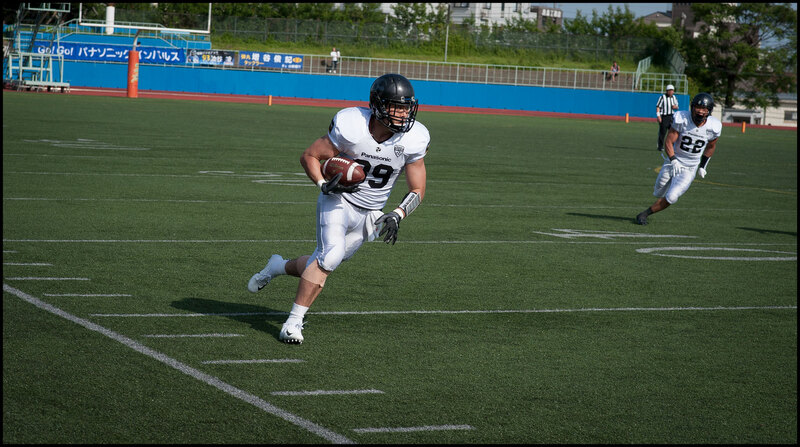 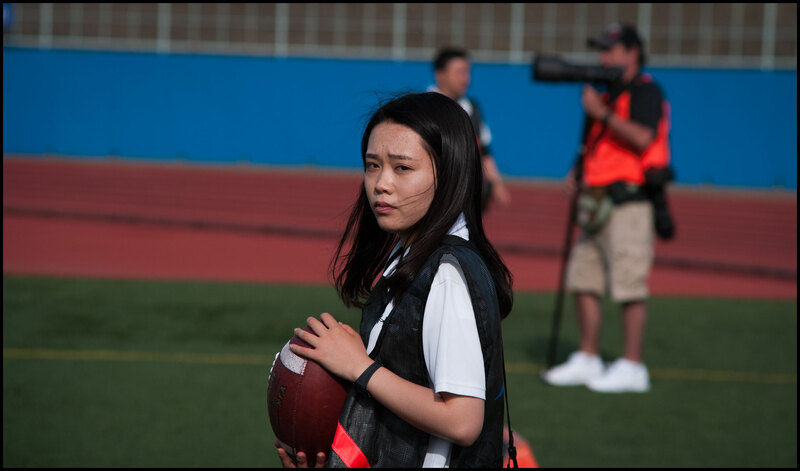 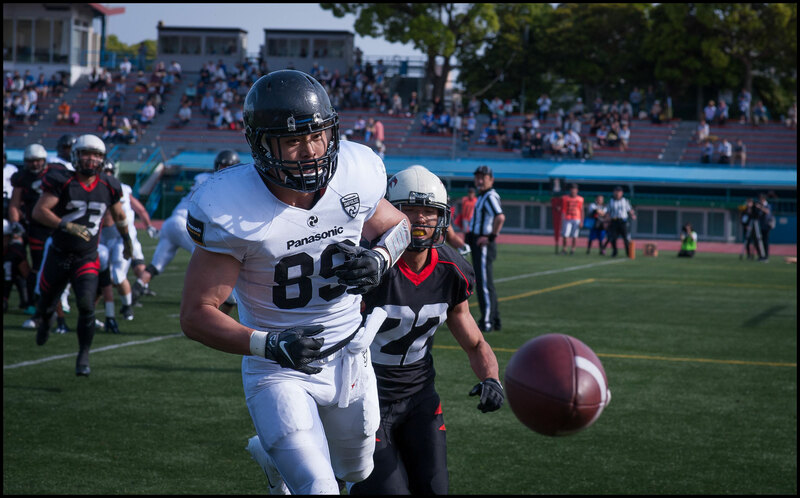 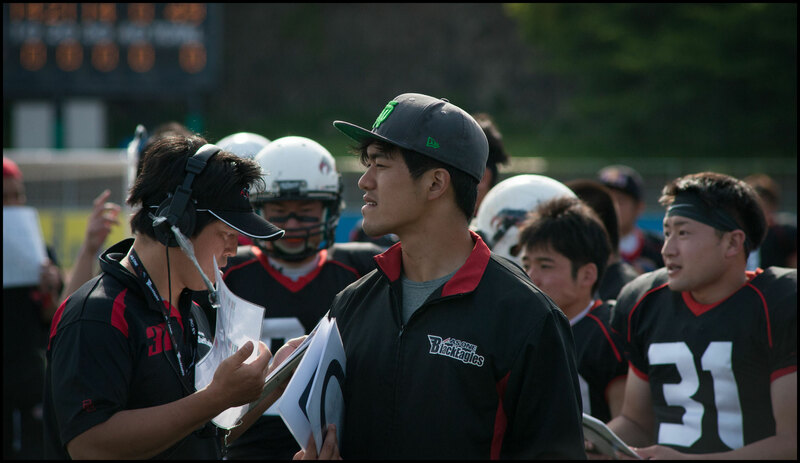 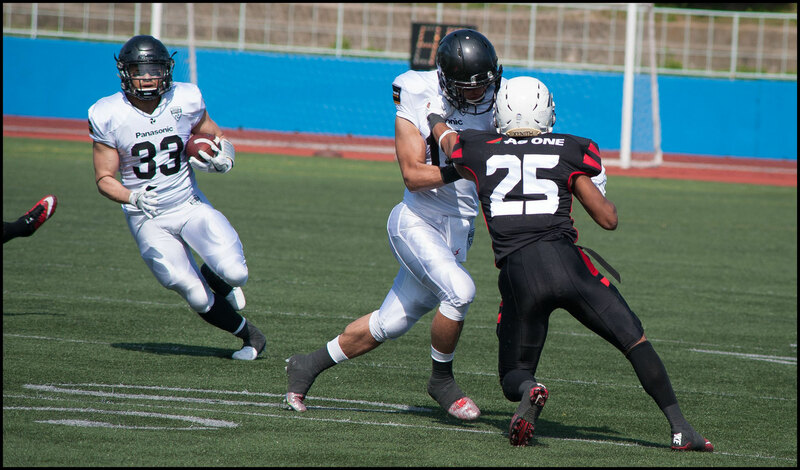 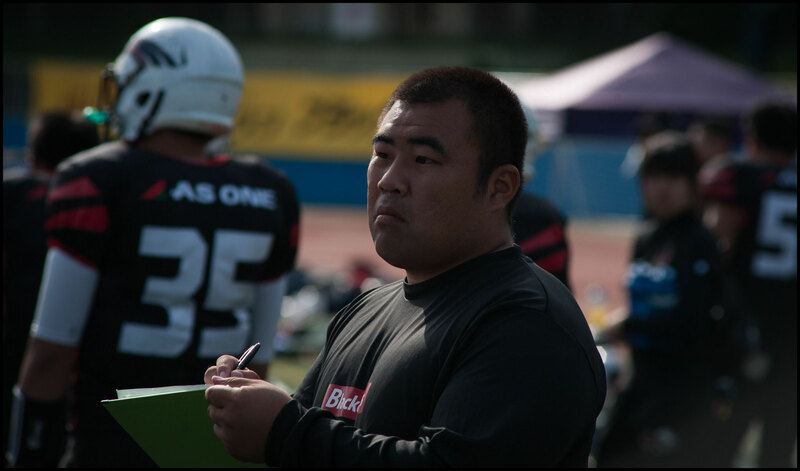 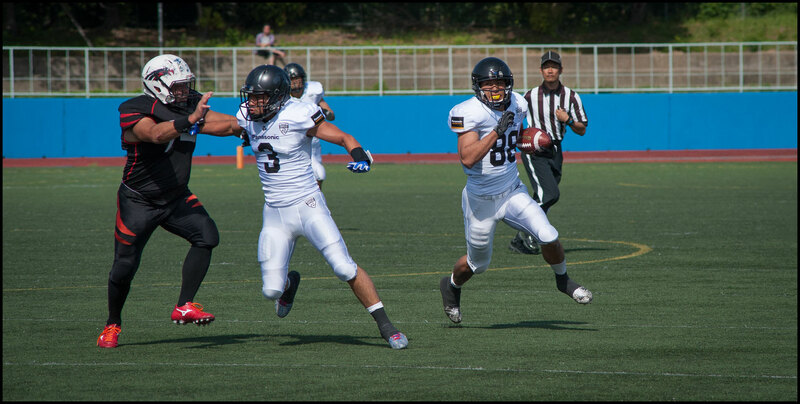 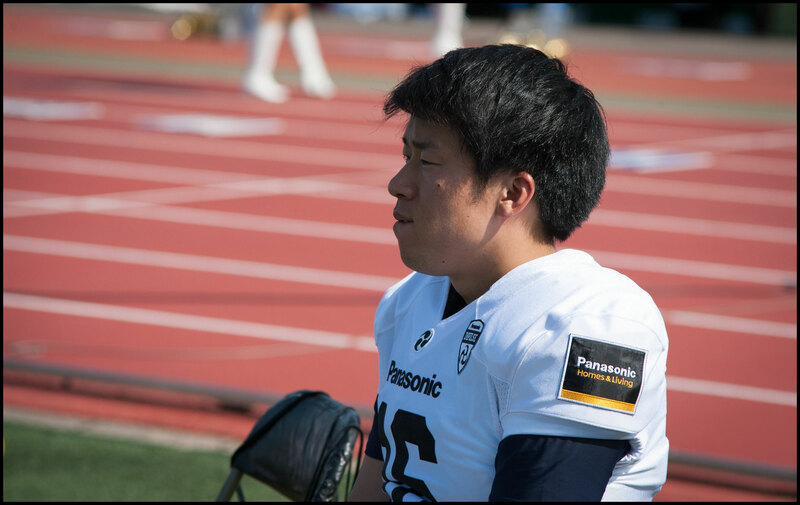 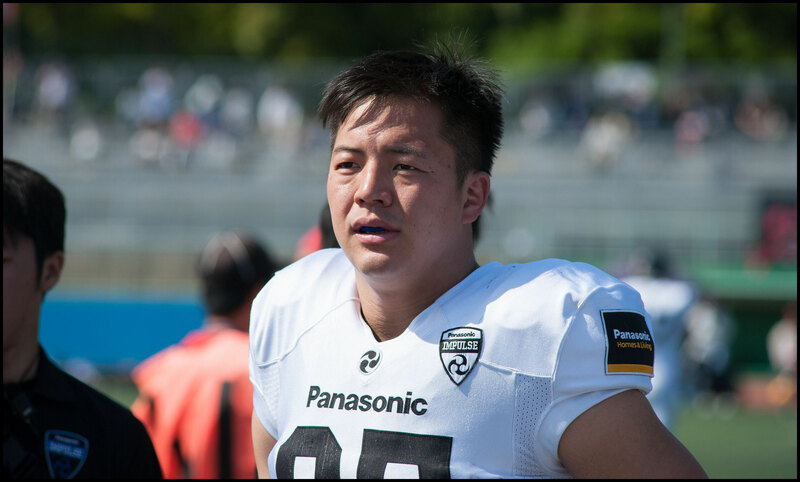 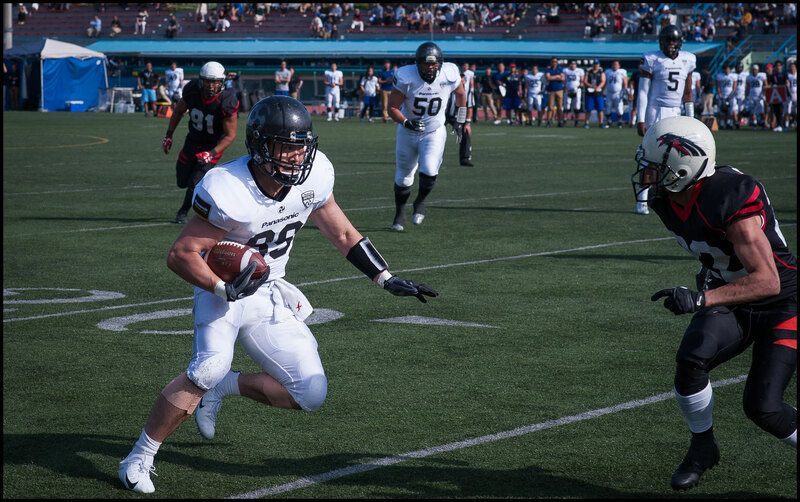 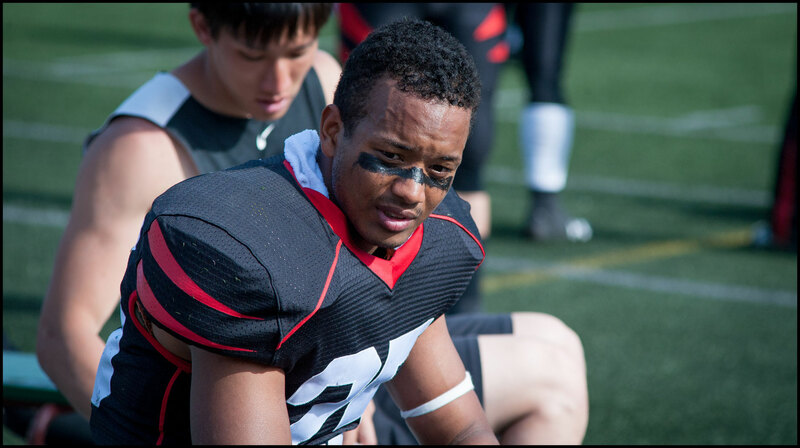 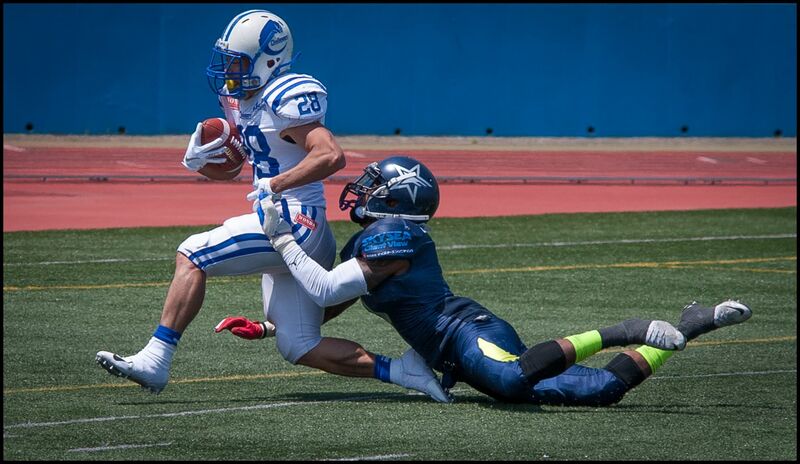 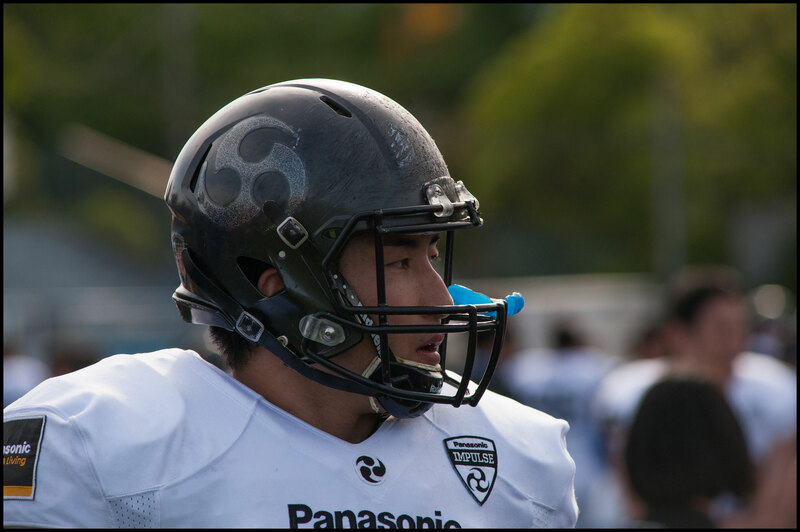 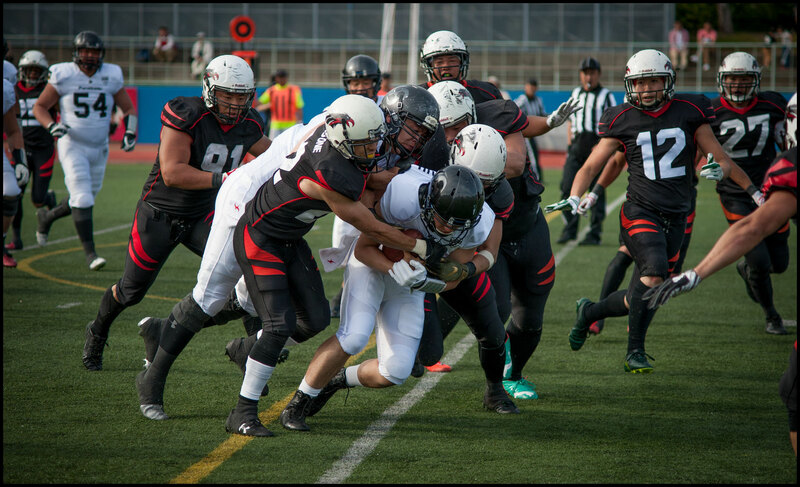 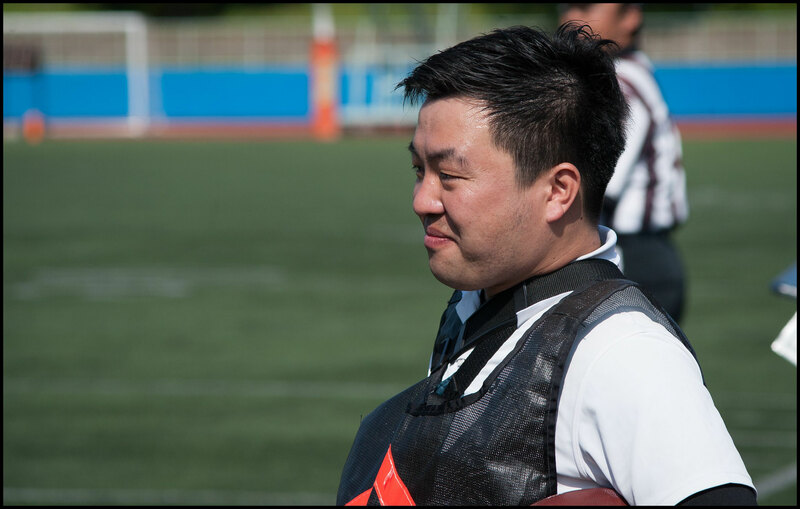 Panasonic finished with nine TDs as the Black Eagles found themselves overmatched in all areas of the game. 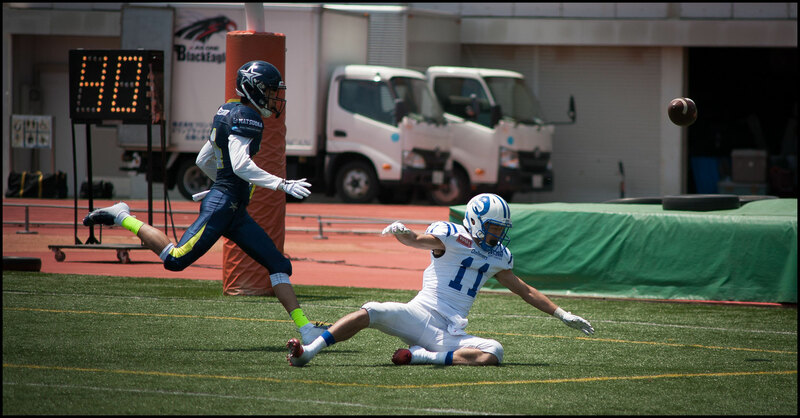 Aside from one interception the only negative for the Impulse was a turn over on a punt when both return men attempted to catch the punt on the fly but instead knocked it directly back to the Black Eagles for a first down. 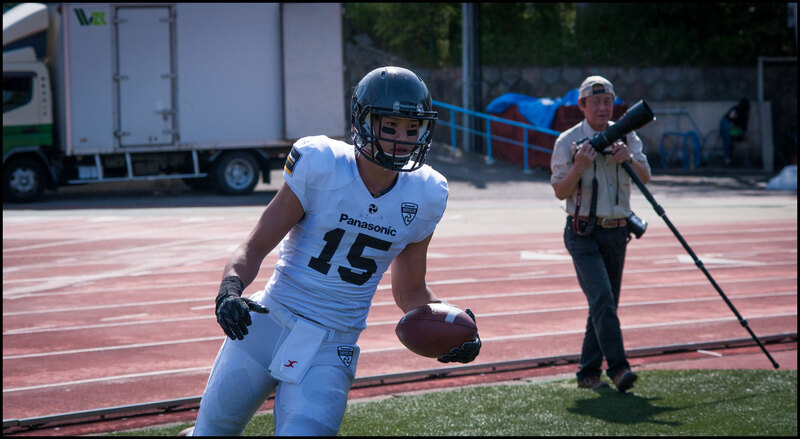 Panasonic also missed their only FG attempt. 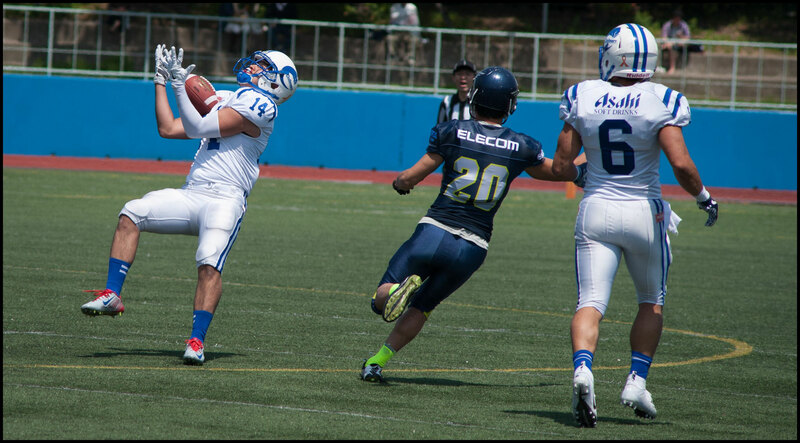 It was a long try that had the distance but didn't stay true on the windy day. 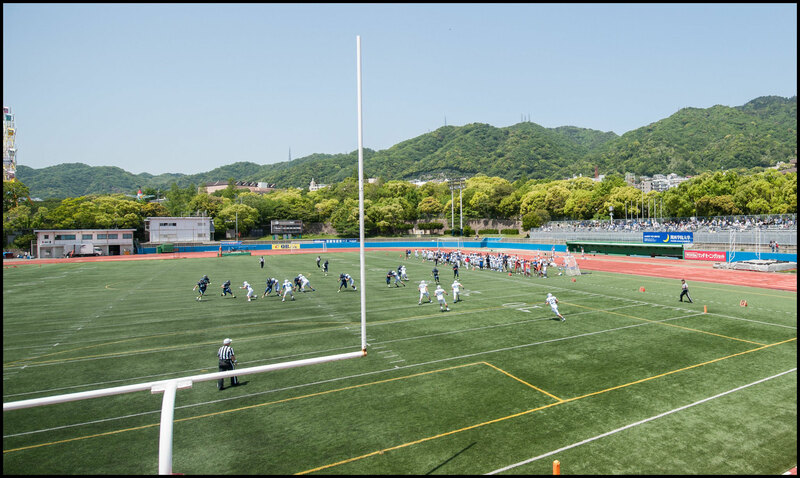 The defending Green Bowl champions and their boisterous fan base will face Asahi on May 20, in the final at Oji Stadium at the foot of the Rokko Moutains in Kobe. 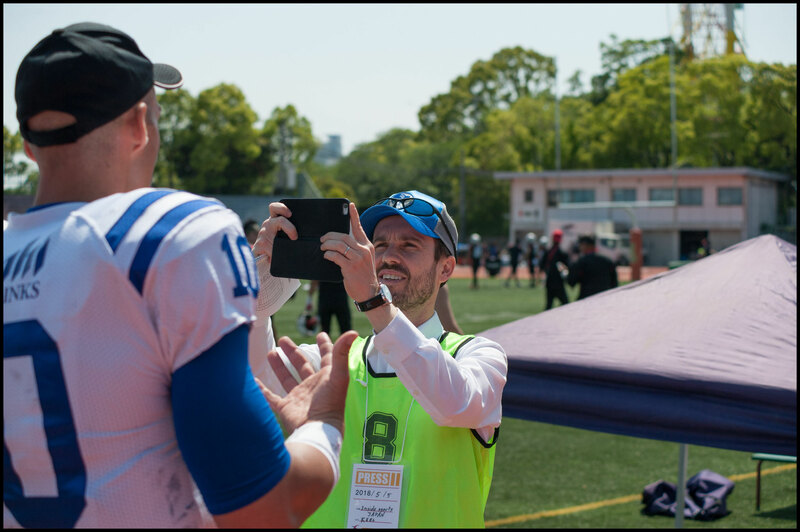 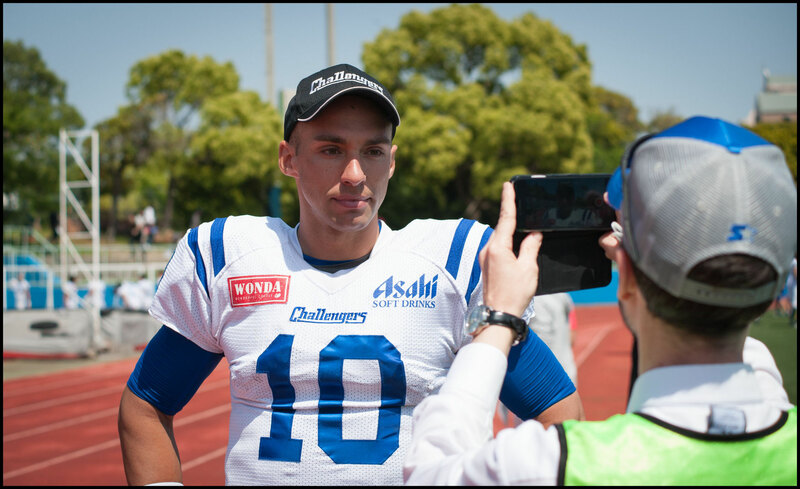 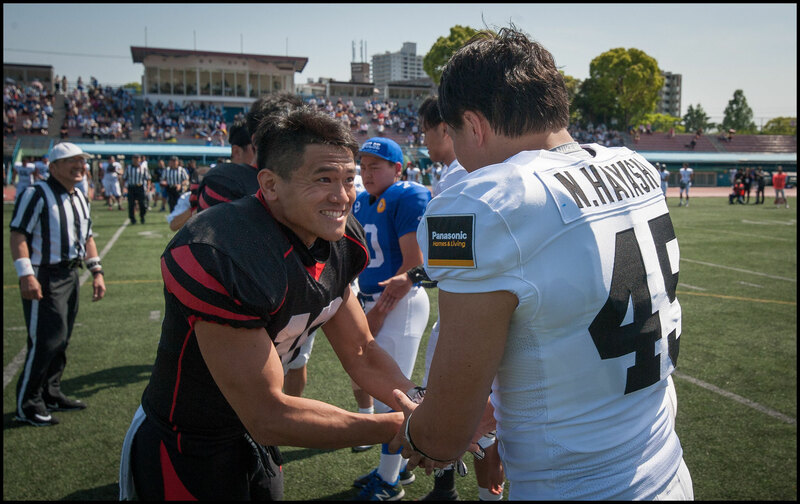 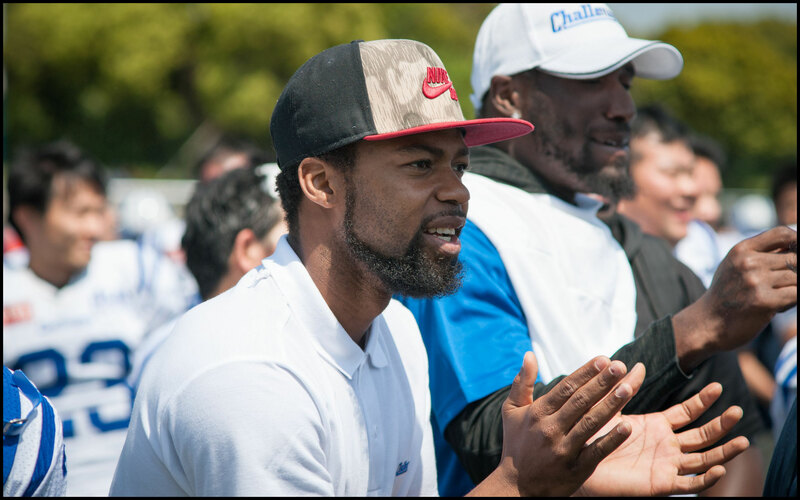 The Challengers were the last team to beat Panasonic in this competition when they won the Green Bowl in 2013 on the same field. 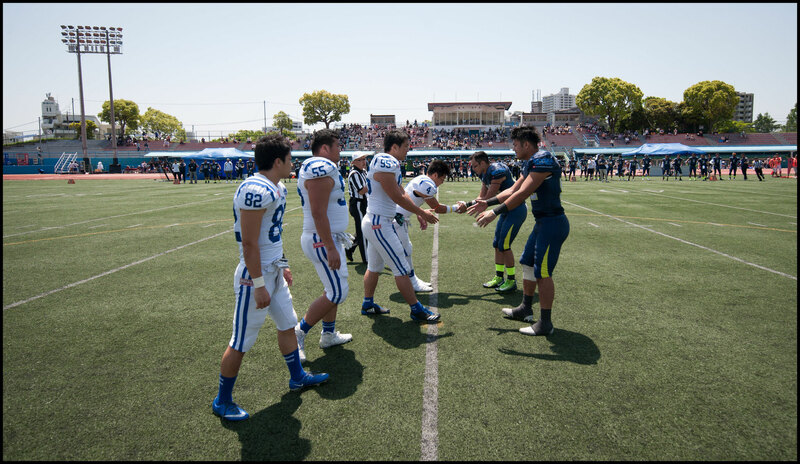 The two remaining X1 teams from outside the Kanto area were in action against X2 opponents in the Green Bowl Challenge. 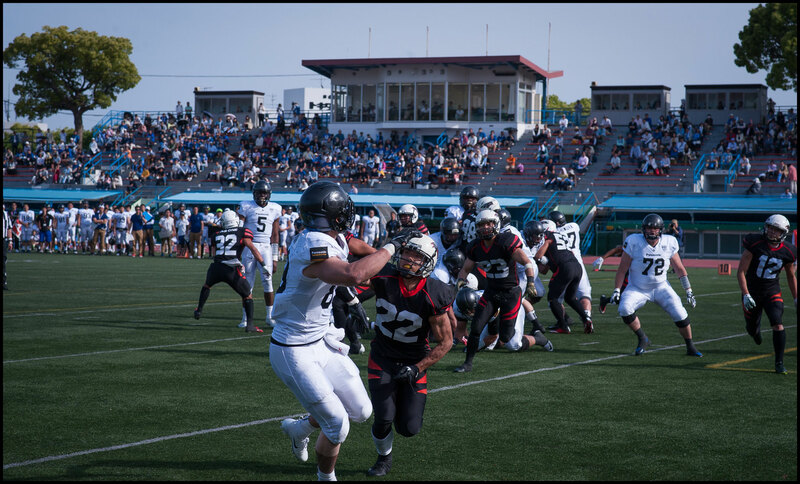 Nagoya Cyclones hosted Nishinomiya Bruins in the only game involving a top tier team to take place this spring in central Japan’s main city. 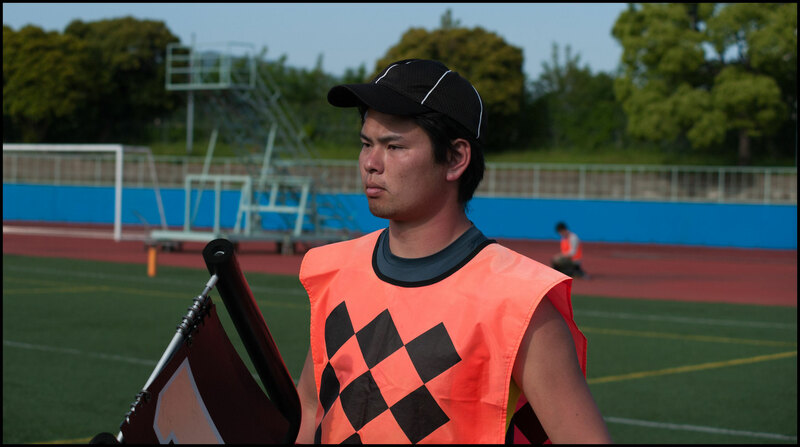 The match at an overcast Komyoji Stadium was a low scoring defensive affair with neither team able to get much going in the opening half. 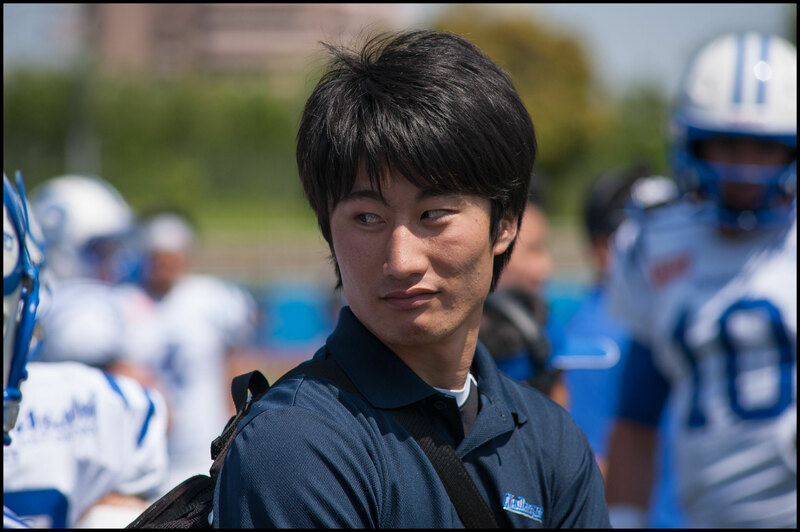 The Bruins probably had the better of the first quarter but the home side started to turn the screw thereafter with QB Naoki Ito and WR Yosuke Nagai hooking up well. 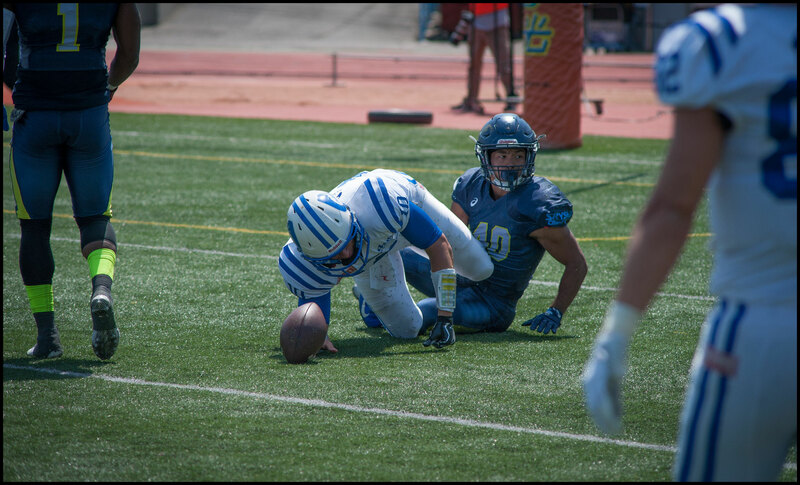 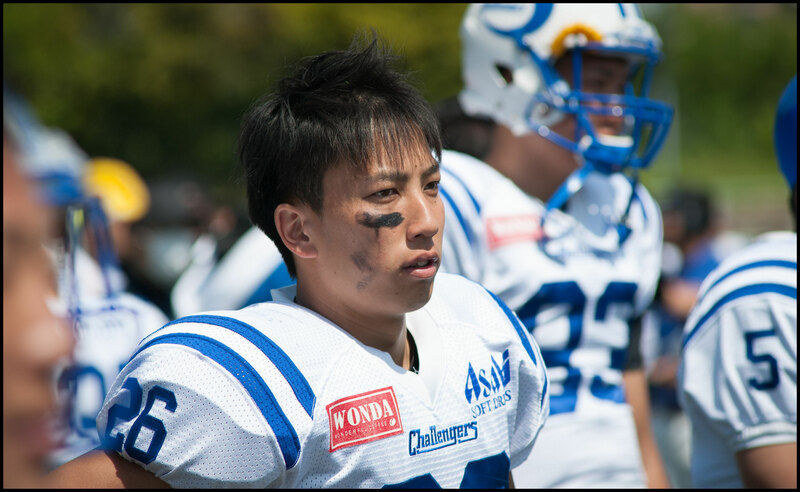 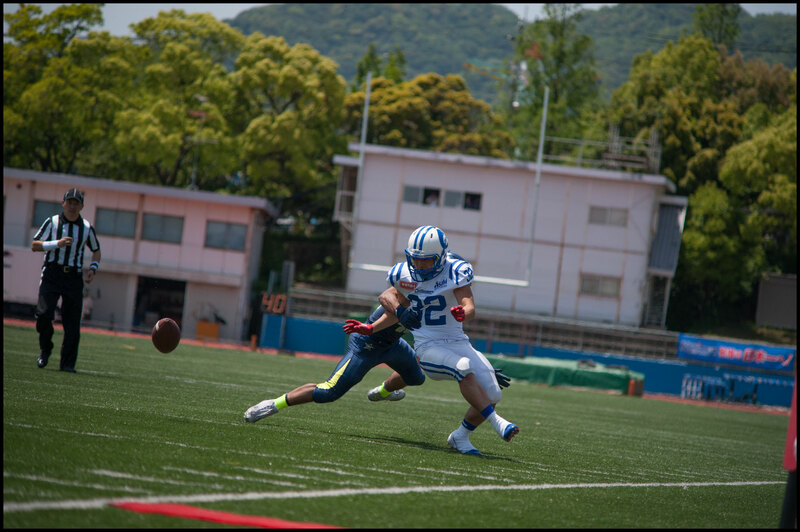 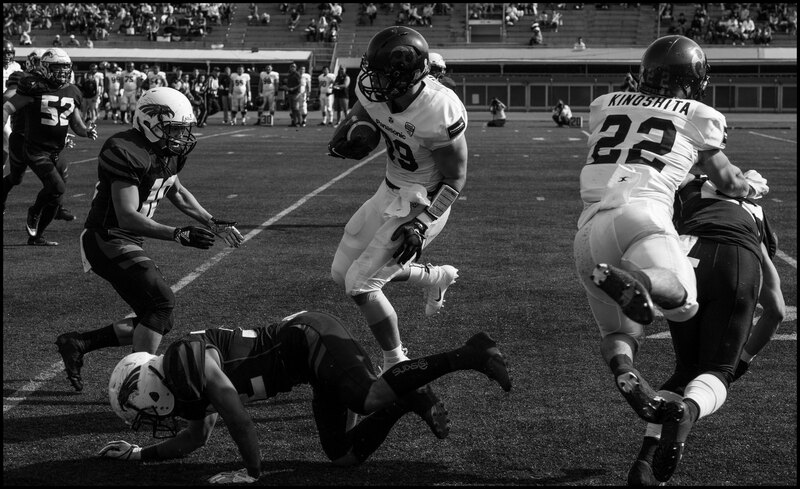 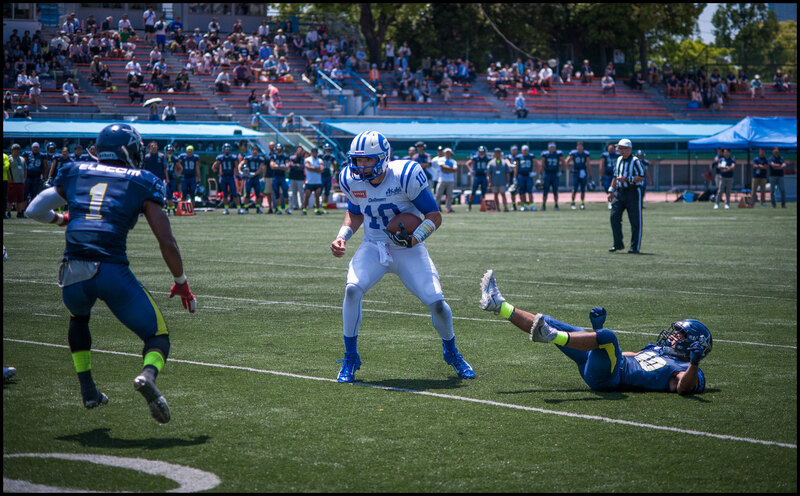 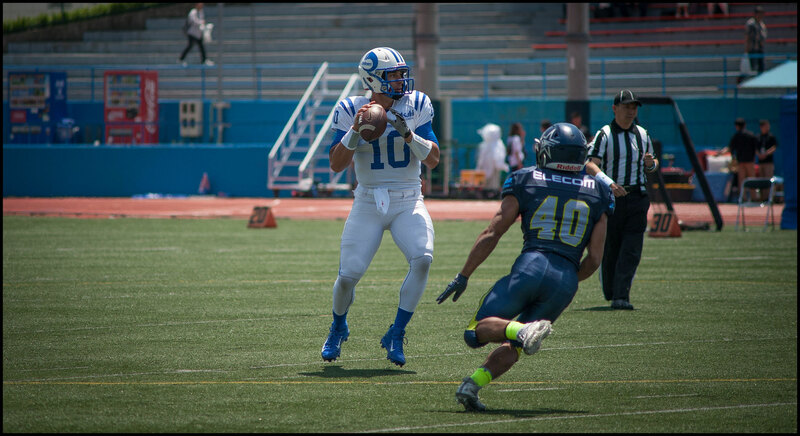 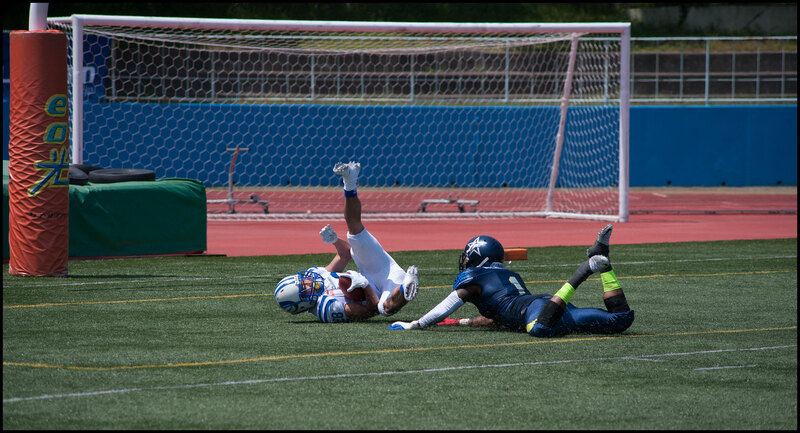 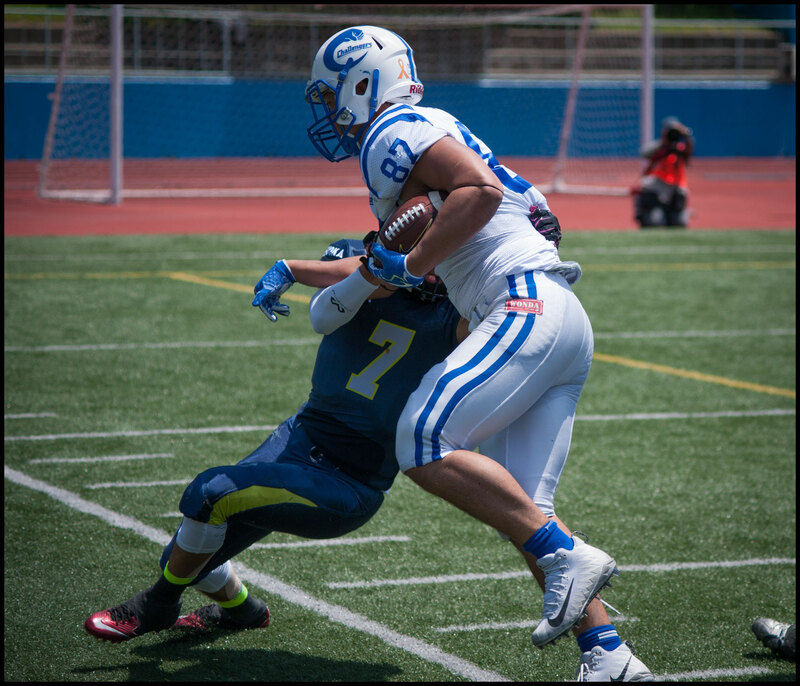 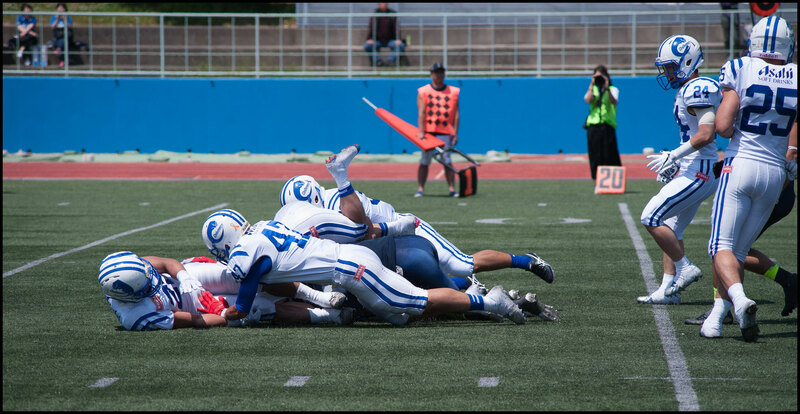 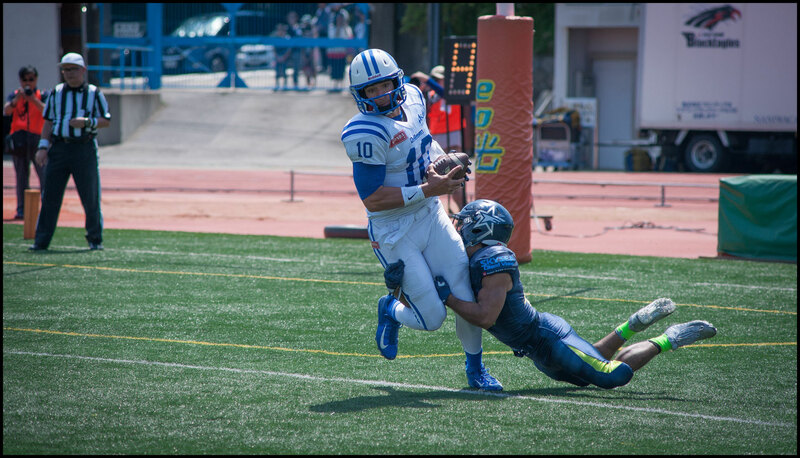 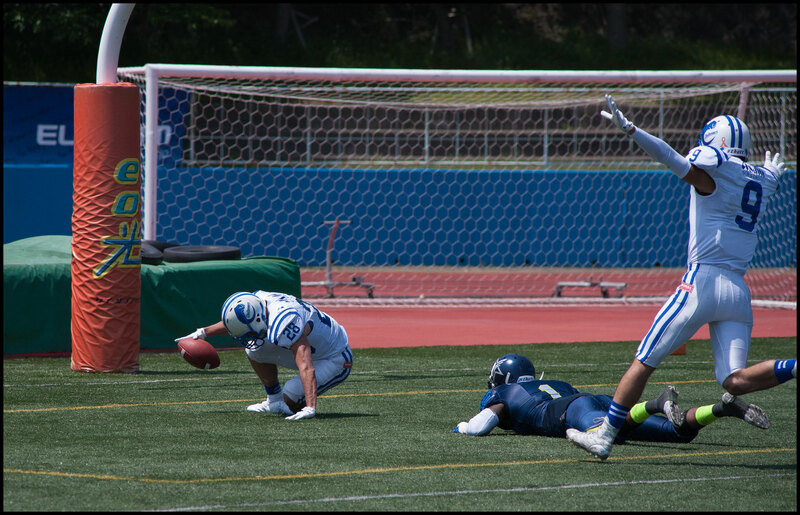 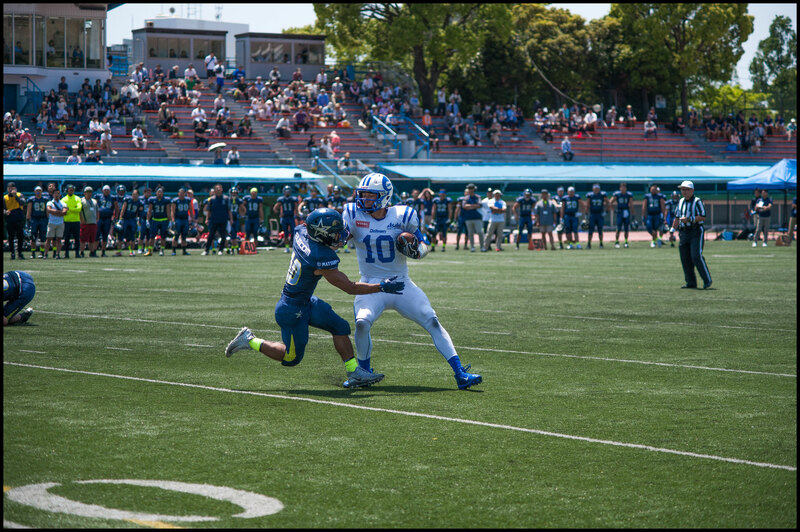 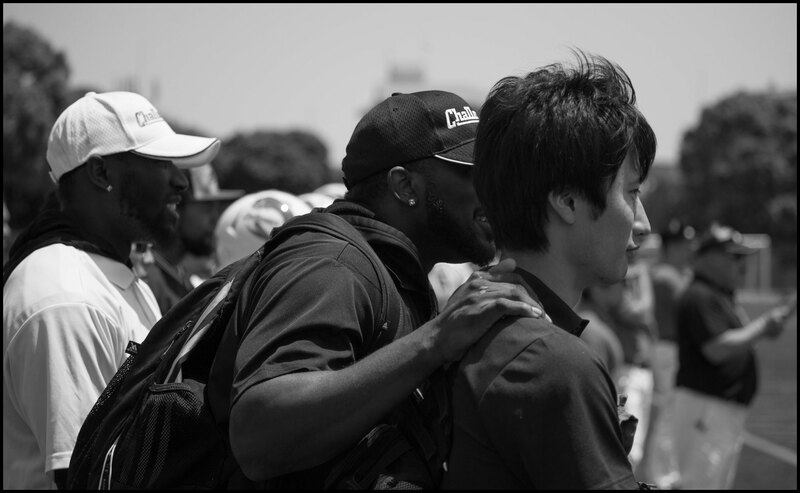 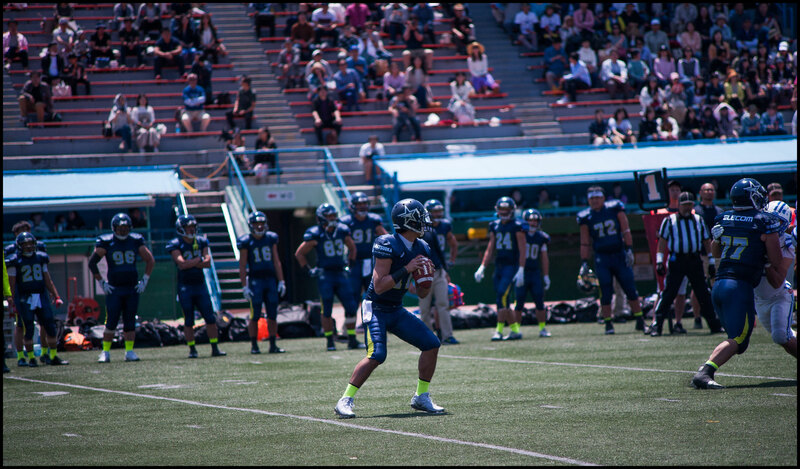 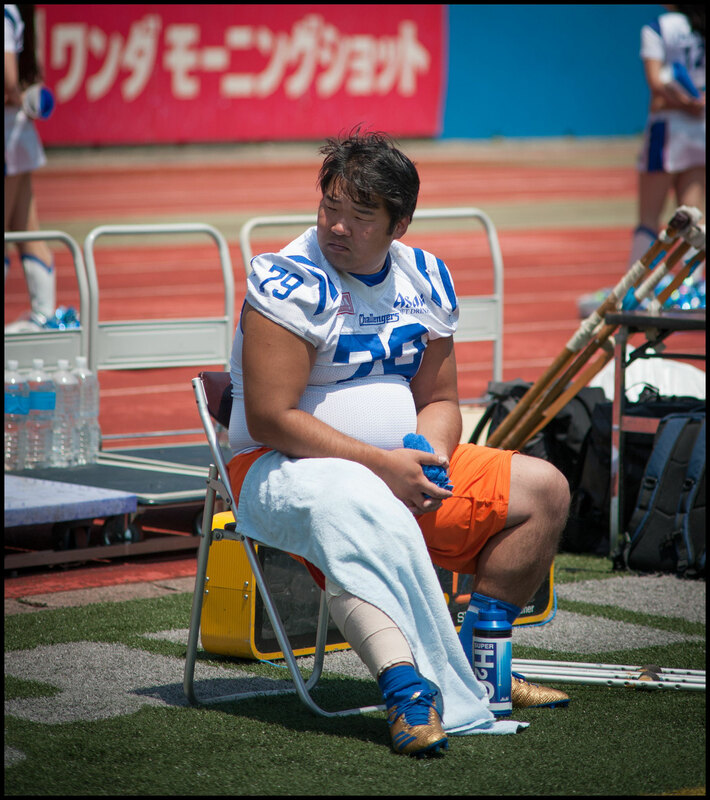 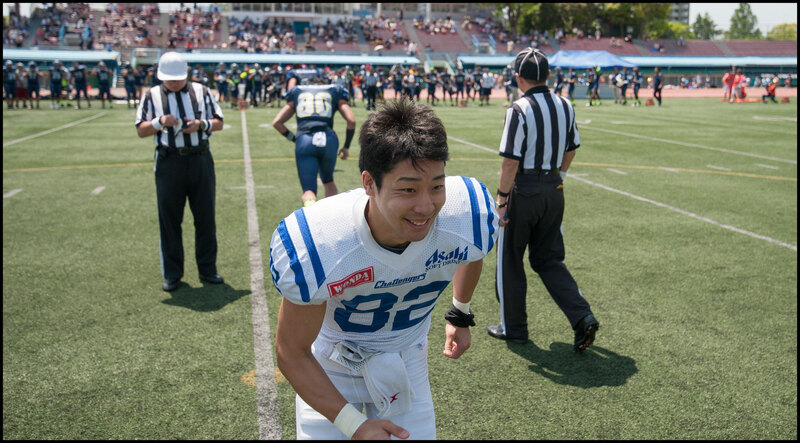 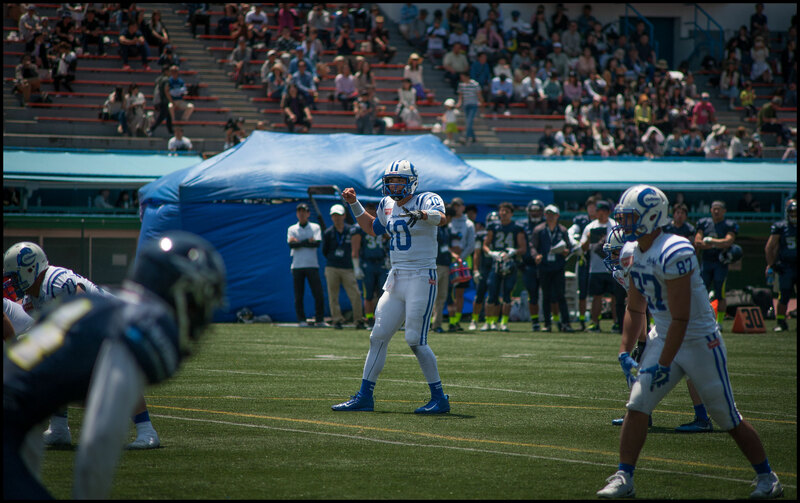 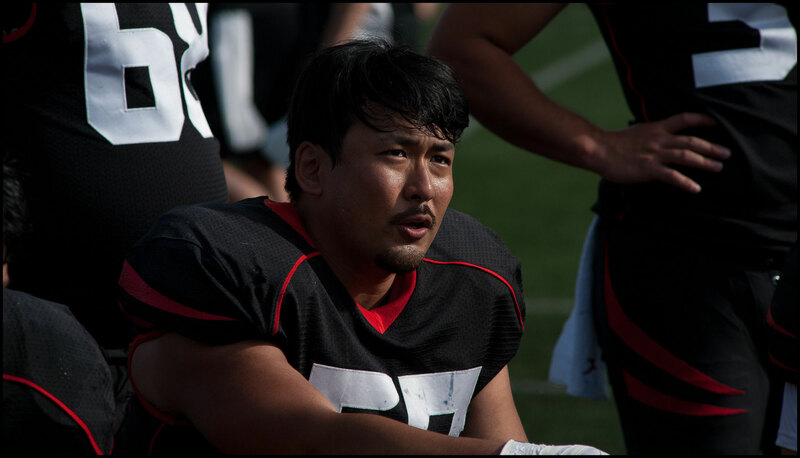 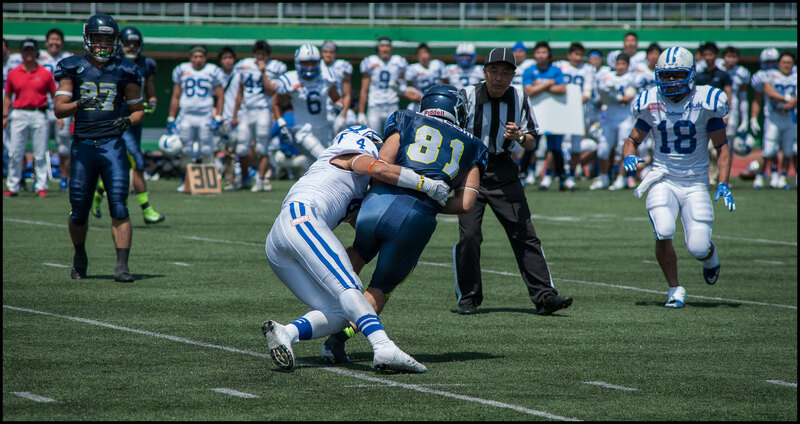 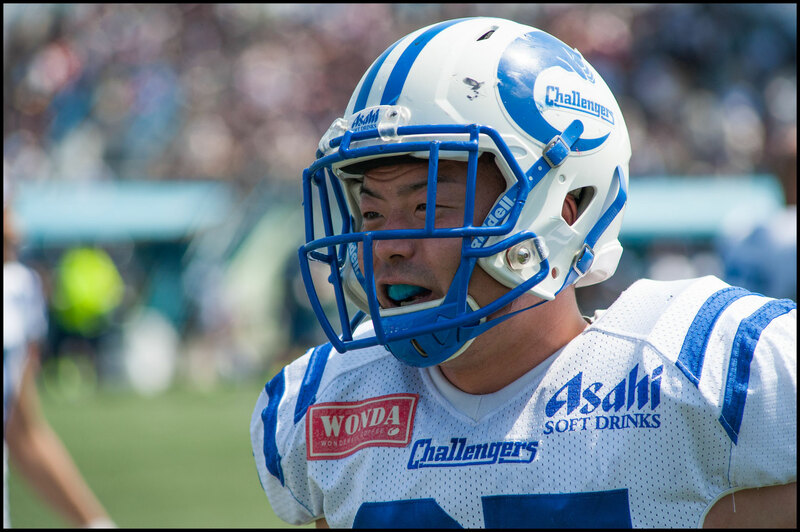 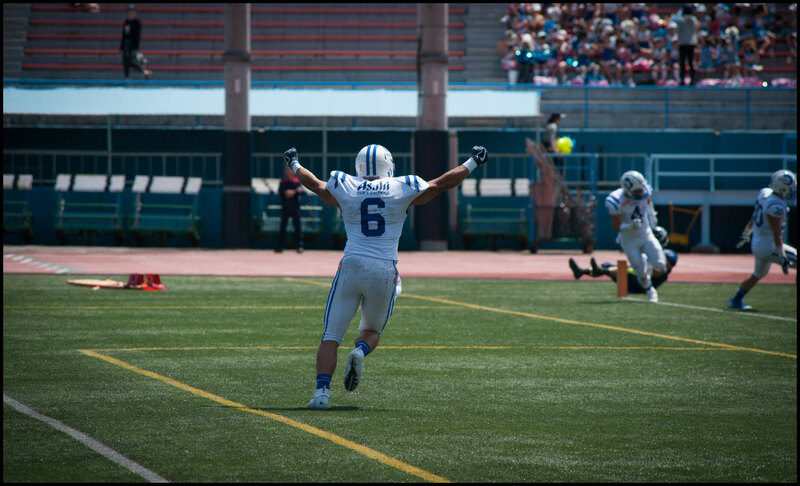 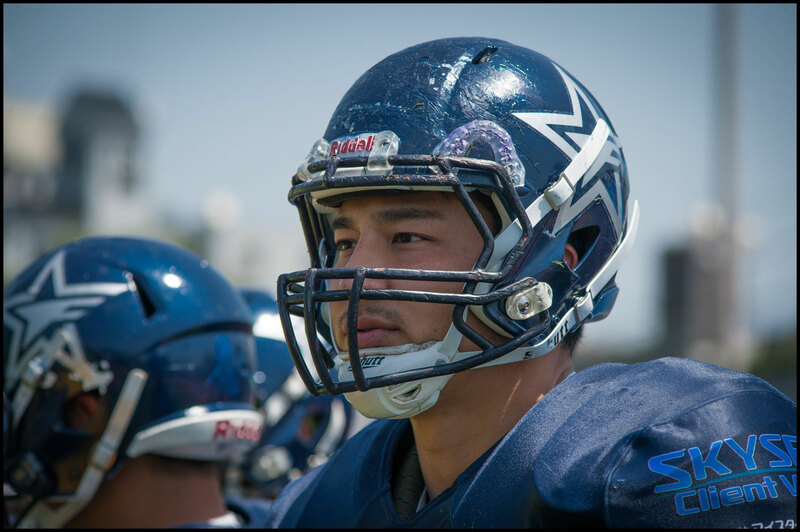 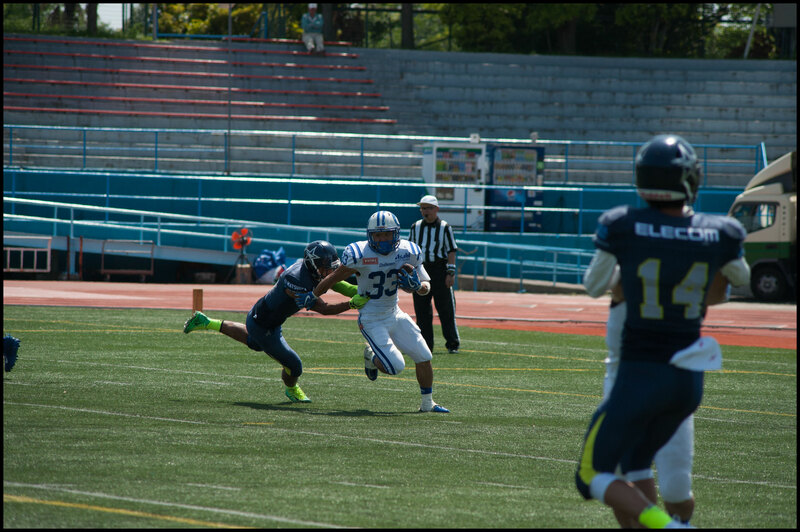 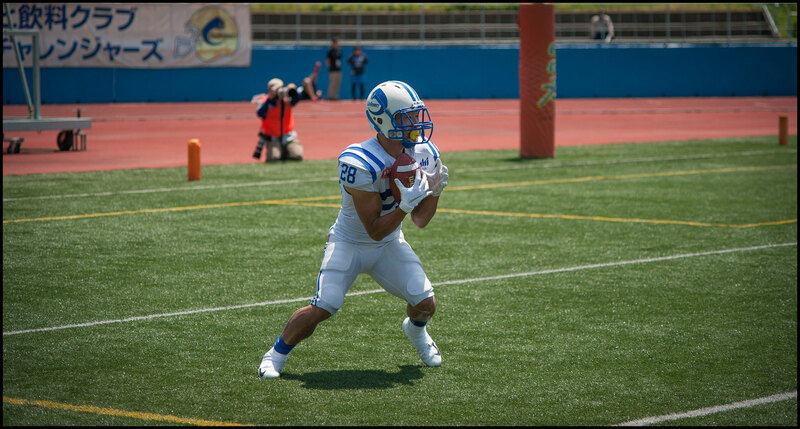 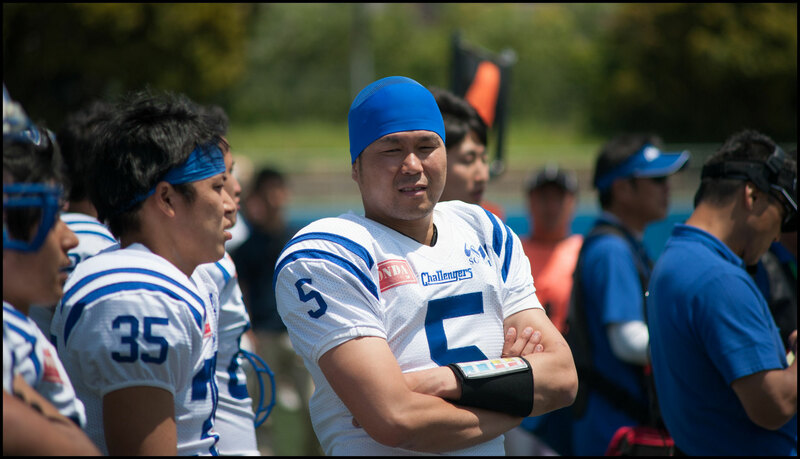 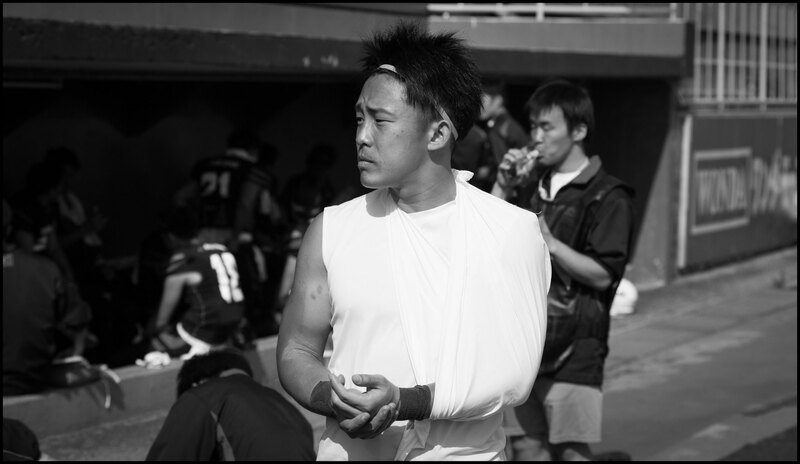 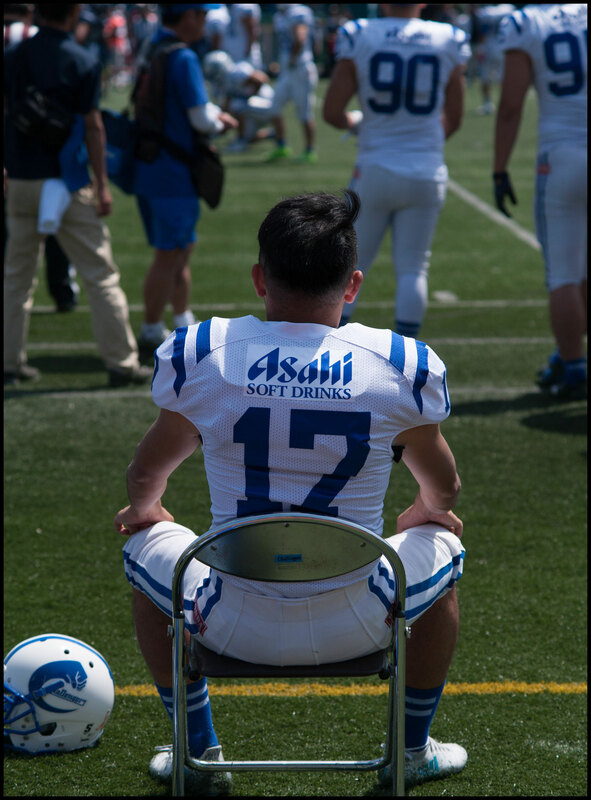 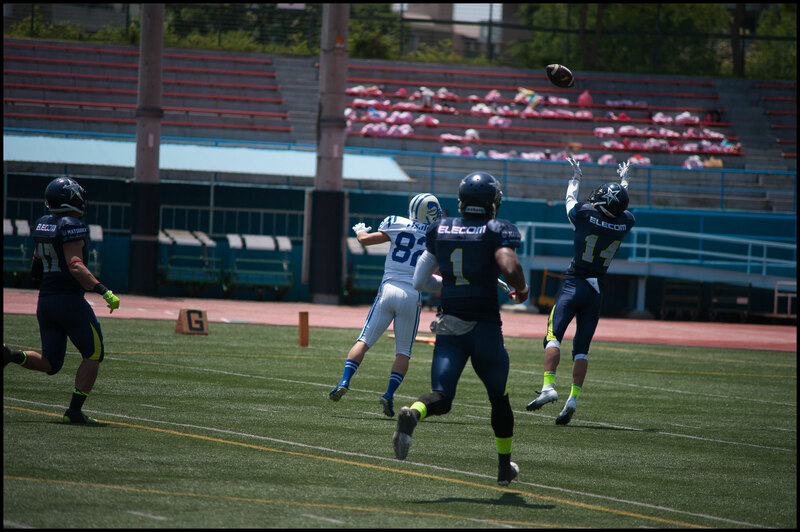 Nagai hauled in 5 passes for 75 yards and two scores on the day. 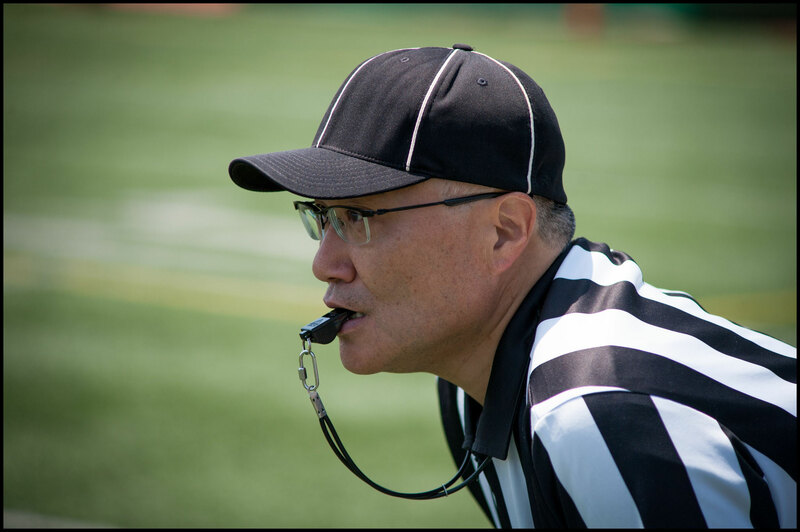 Bruins only score came on a safety in the fourth quarter. 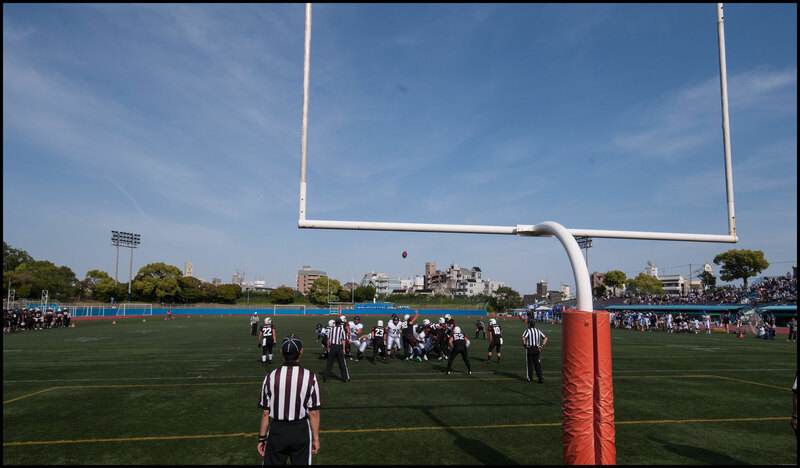 There was still only eight points in it at that stage but Nagoya finished with a scoring burst, kicking a FG and adding two TDs in the last 90 seconds of game play to run out 26 – 2 winners. 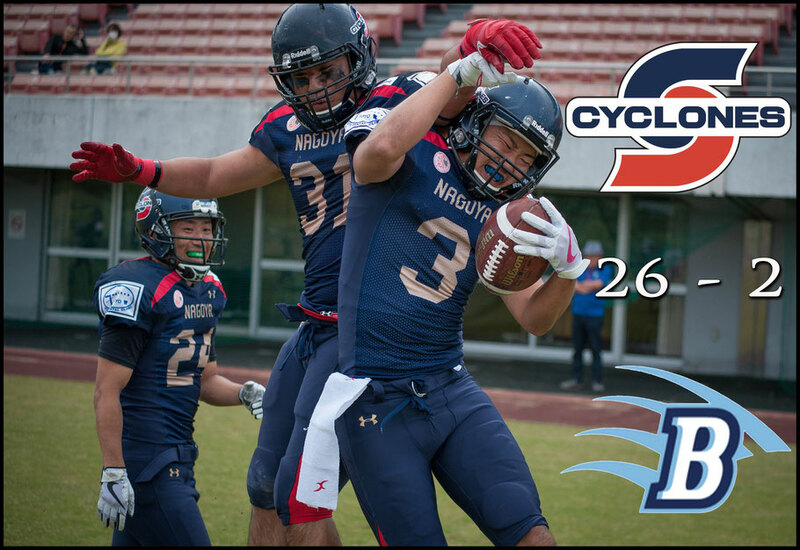 The victory sends Cyclones through to face Club HawkEye in a repeat of last year’s final. 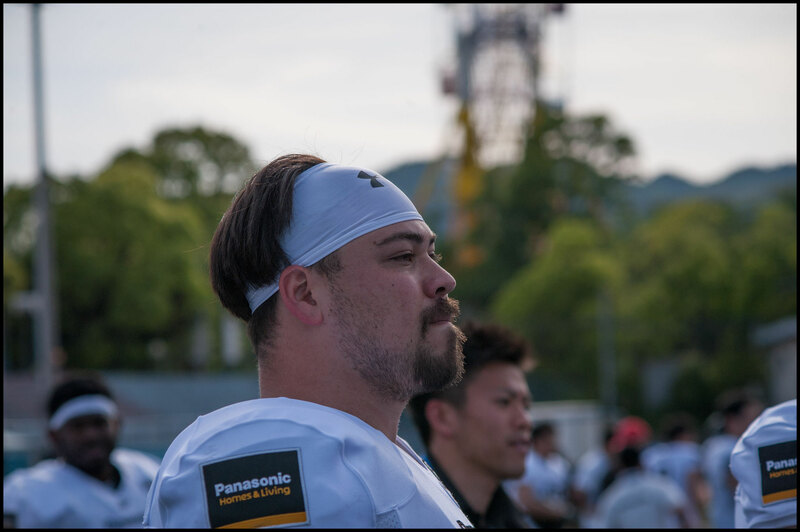 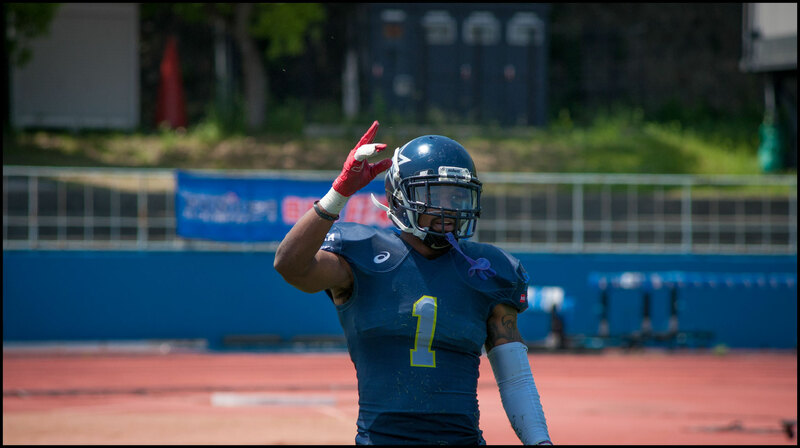 Nagoya were on the receiving end of a late flourish in that game with HawkEye blocking a punt, scoring a TD and getting the two-point conversion in the last 30 seconds to leave the final score 15 – 15. 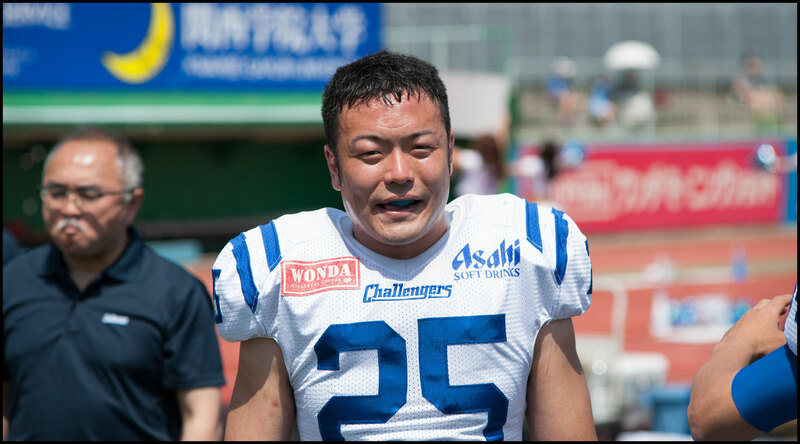 The Green Bowl Challenge unlike the Green Bowl doesn’t employ any tiebreak mechanism. 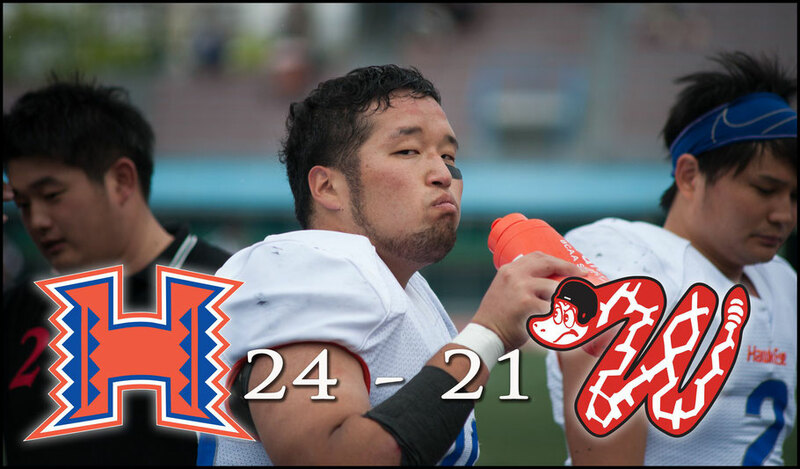 HawkEye made it through to this year’s final by defeating Sidewinders 24 -21. 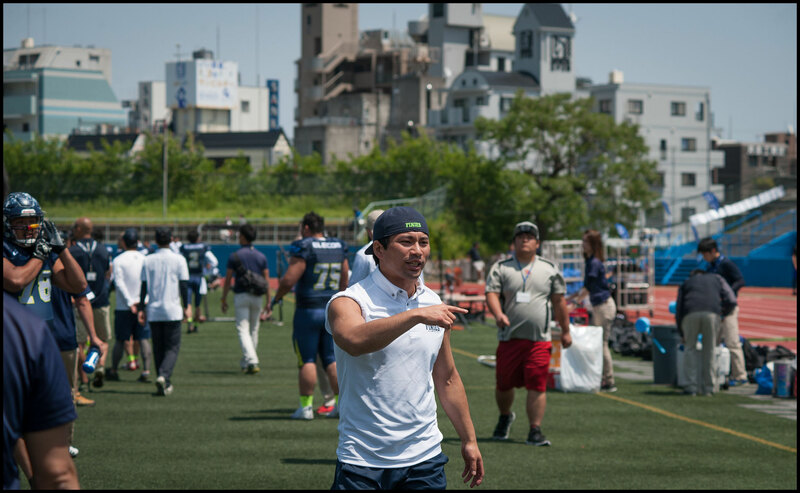 The teams have switched positions in X1 and X2 in each of the past two years with the lower ranked side winning on both occasions. 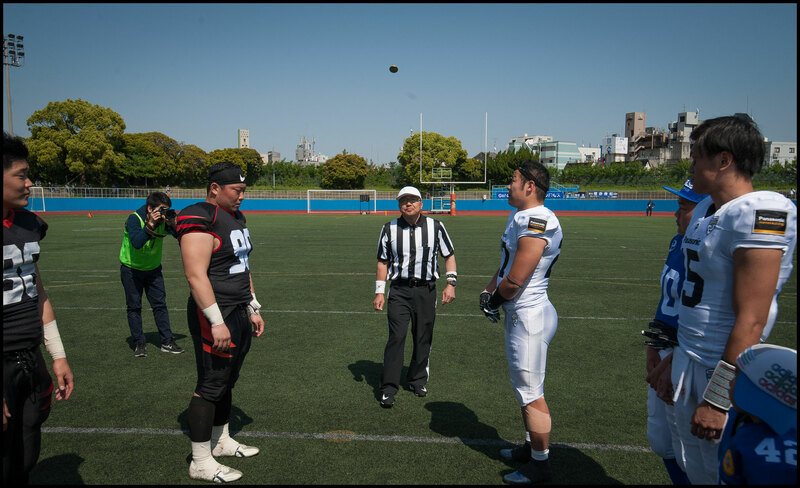 Unsurprisingly then the matchup at Kobe’s Oji Stadium was a chippy affair. 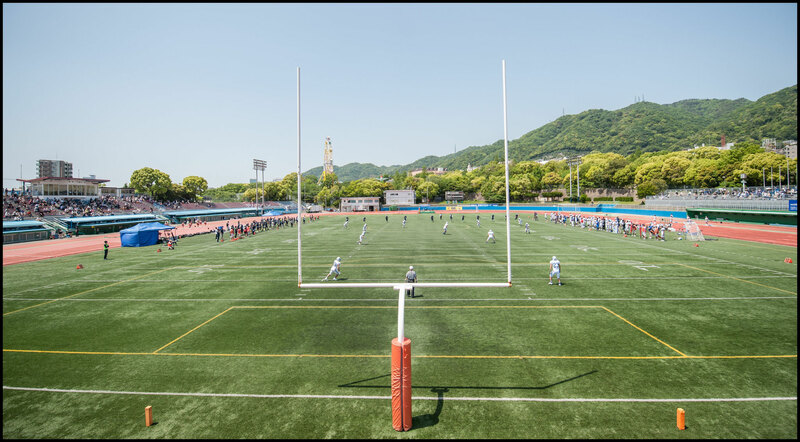 Perhaps upset at being relegated after a singe season in the top flight HawkEye’s players let their emotions get out of control at times and found themselves penalized 7 times for 70 yards. 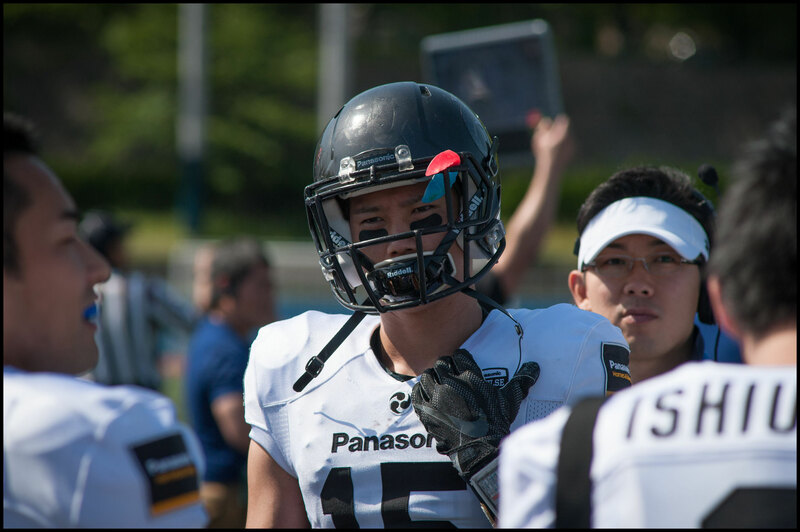 Sidewinders by contrast didn’t have a singe flag thrown against them but perhaps could have used a bit of that HawkEye fire early on as they fell behind 17-0 midway through the second quarter. 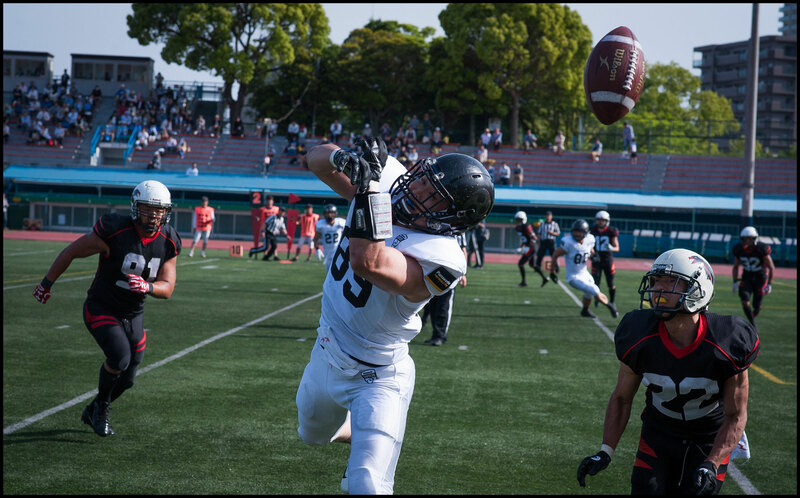 The Nishinomiya side staged a late fightback but it wasn’t enough and so they will face crosstown rival Bruins in the third / fourth place game which serves as the curtain raiser to the HawkEye – Cyclones final on May 27 at Oji Stadium.